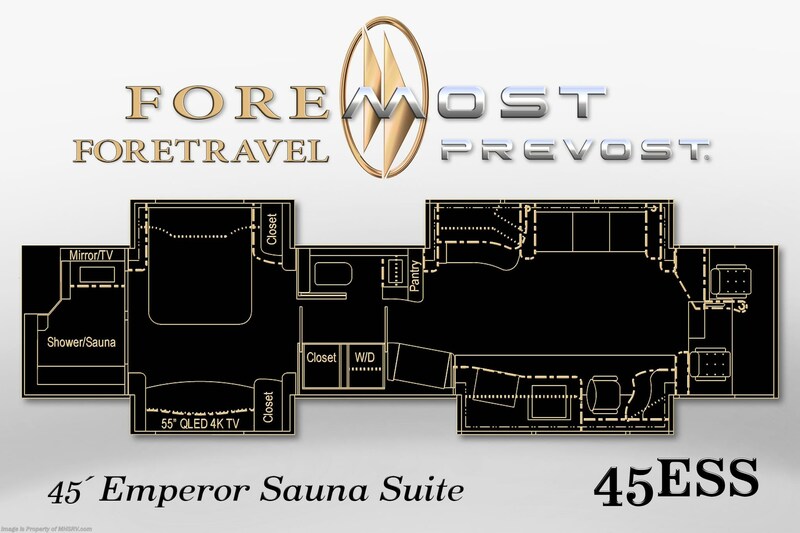 The 45' Emperor Sauna Suite (45ESS) M.S.R.P. 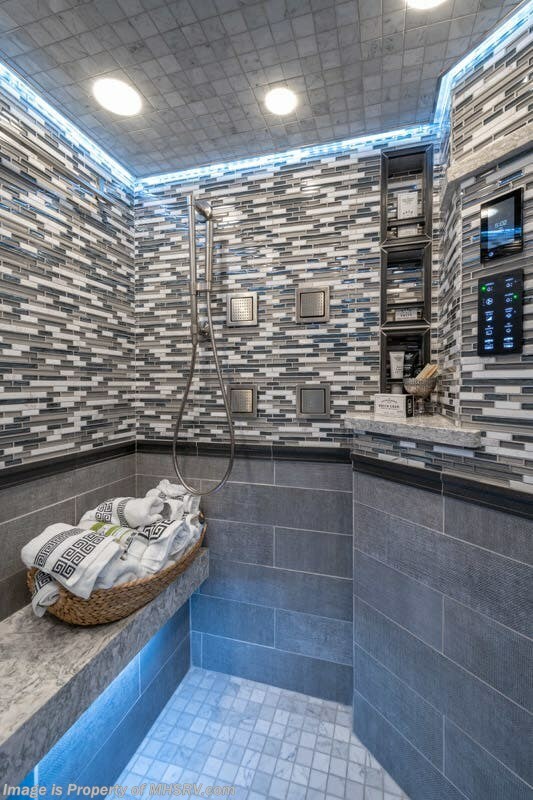 $2,882,700. 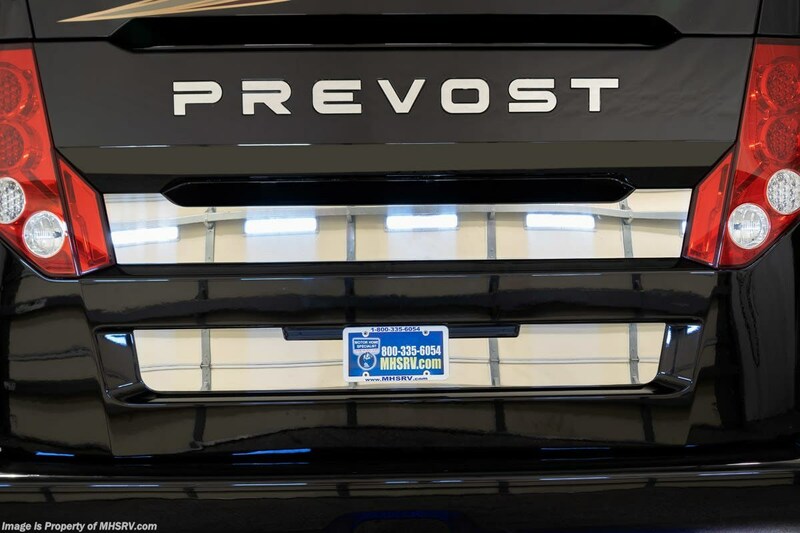 Foremost, by definition, means first in place, first in order or first in rank... 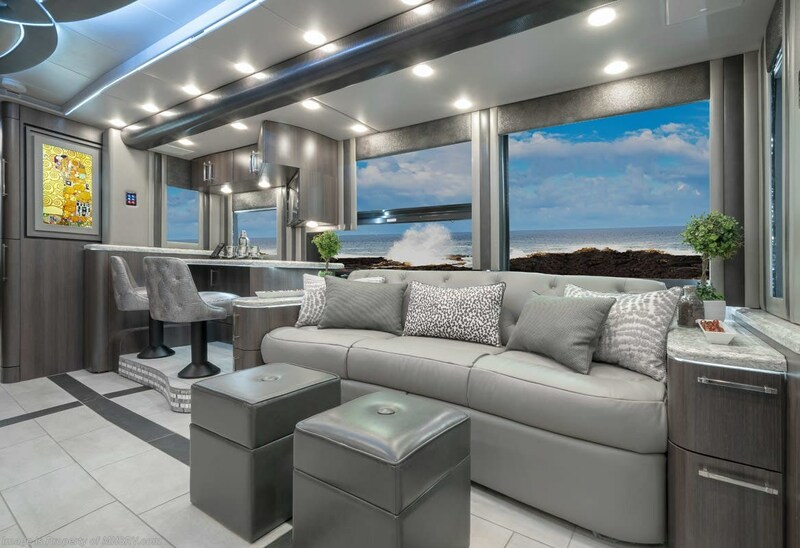 The Foremost in luxury motor coaches is here and available now at the #1 volume selling motor home dealership in the world. 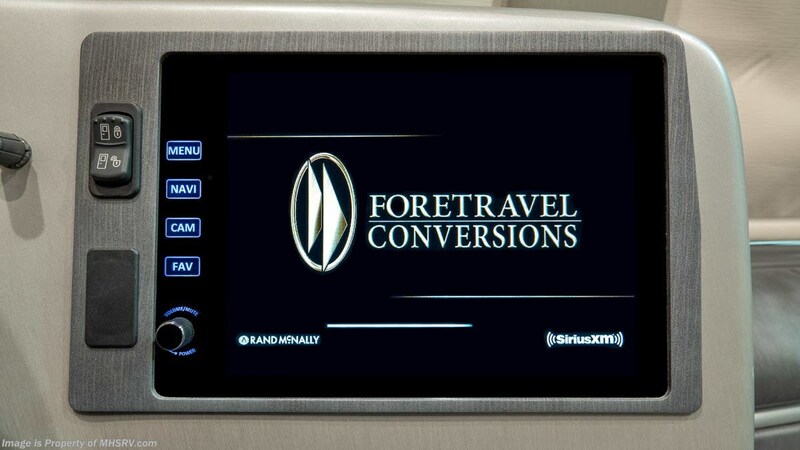 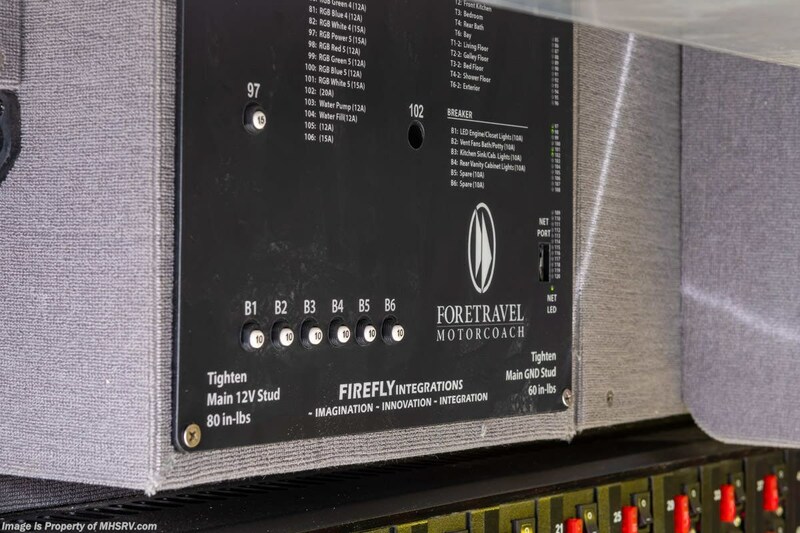 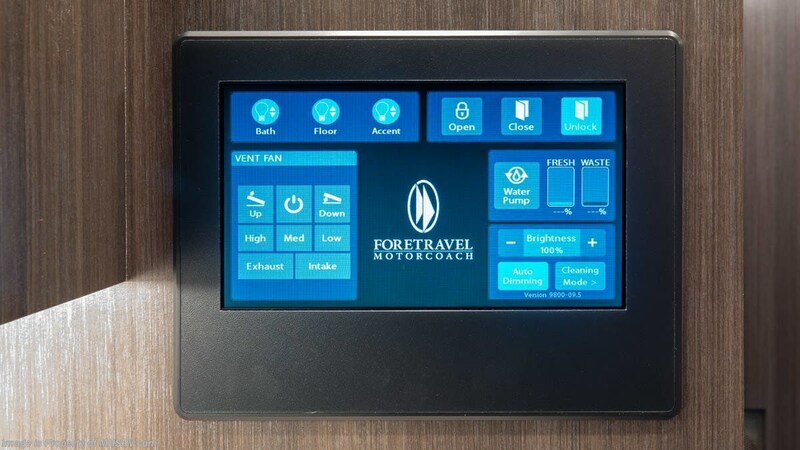 For over 50 years Foretravel has remained at the pinnacle of the luxury motor coach industry. 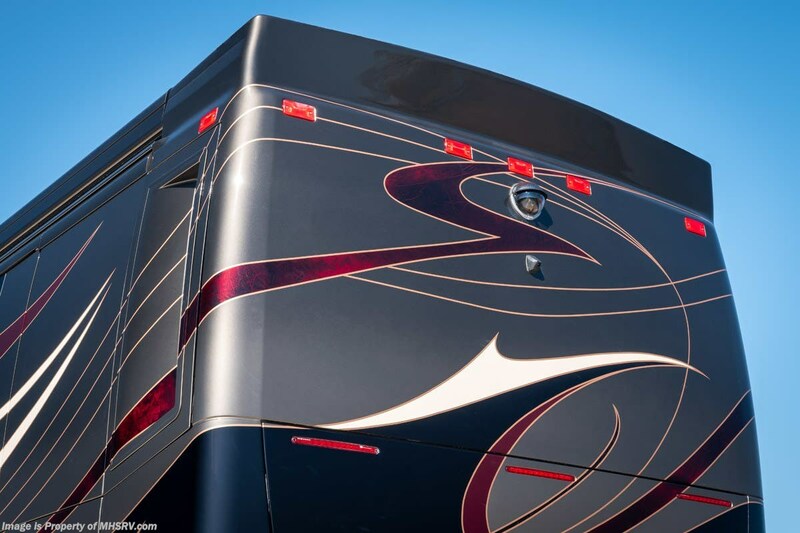 Offering only the finest in coach design, materials and quality. 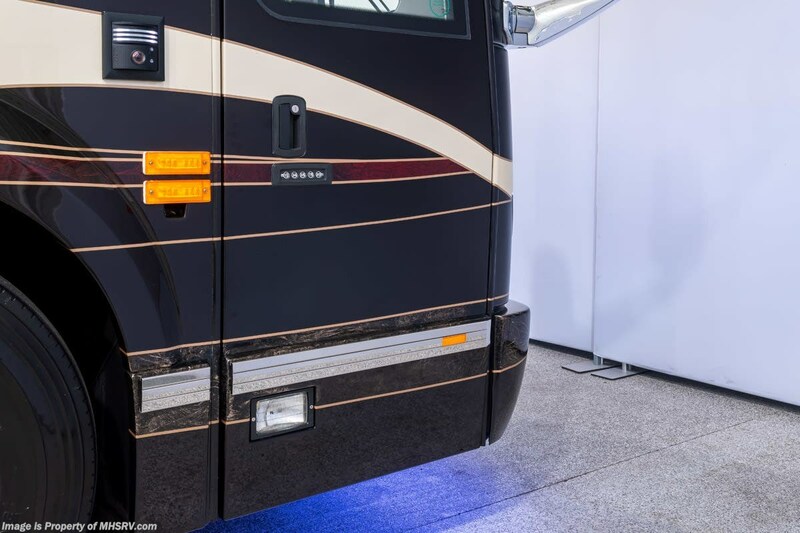 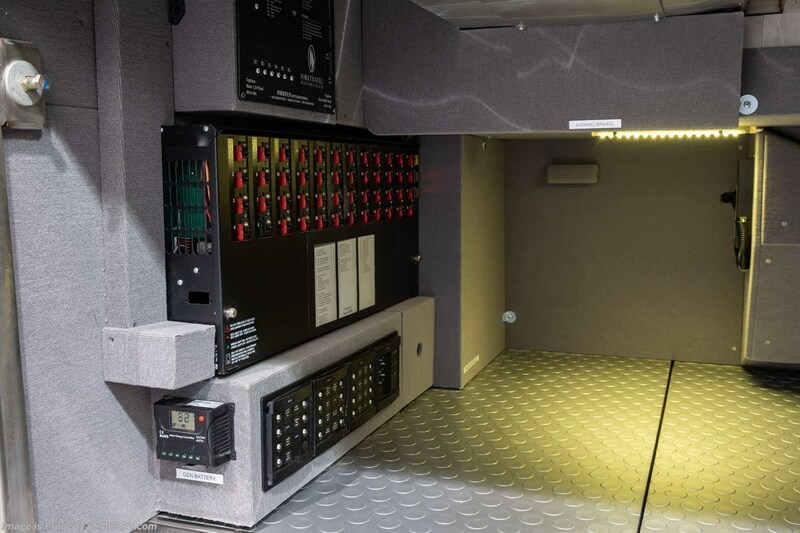 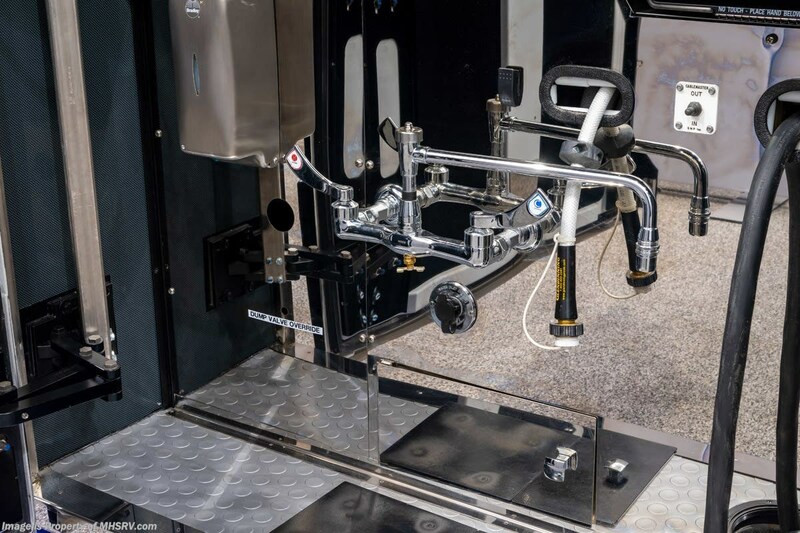 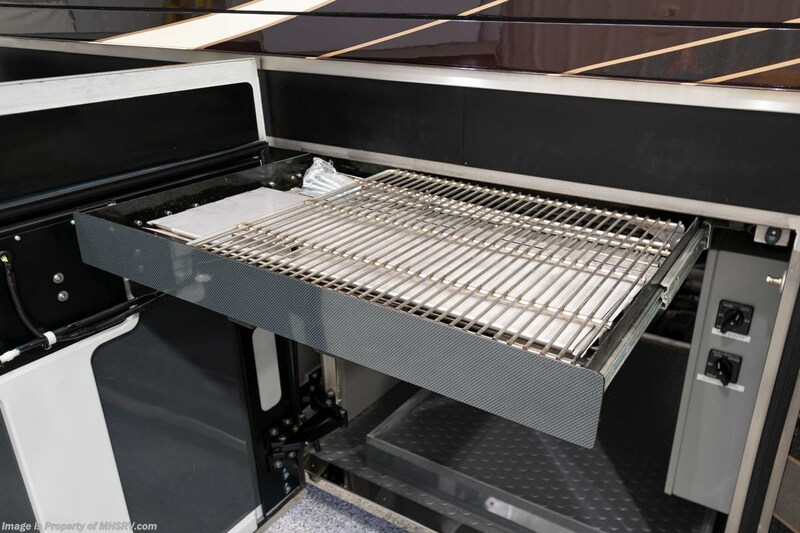 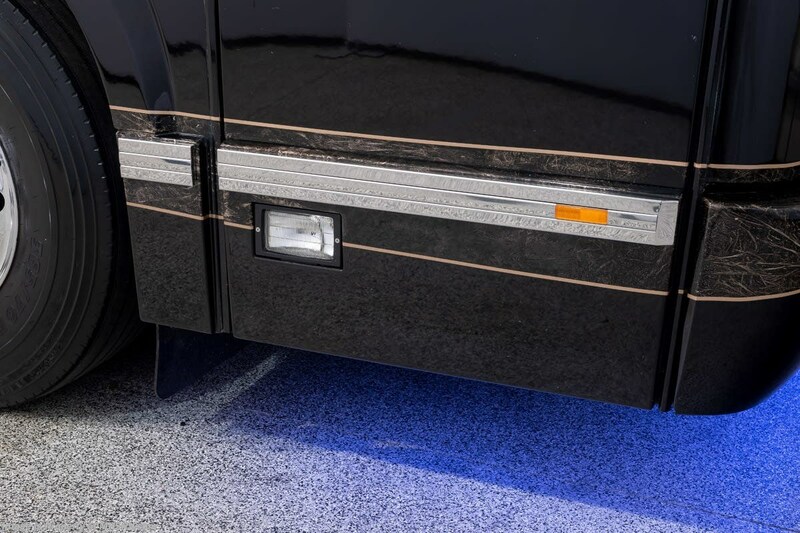 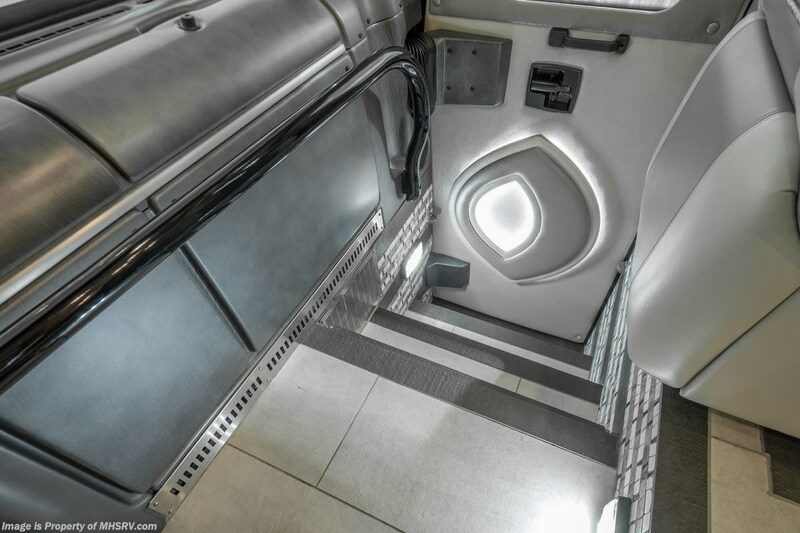 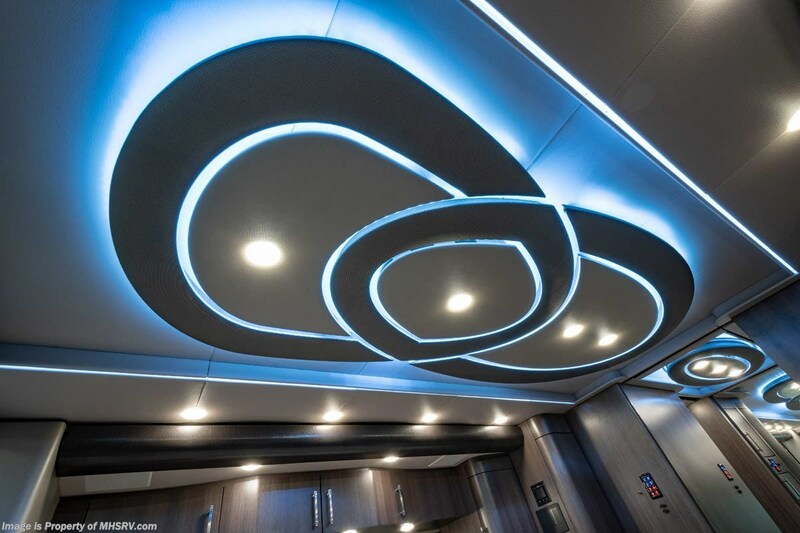 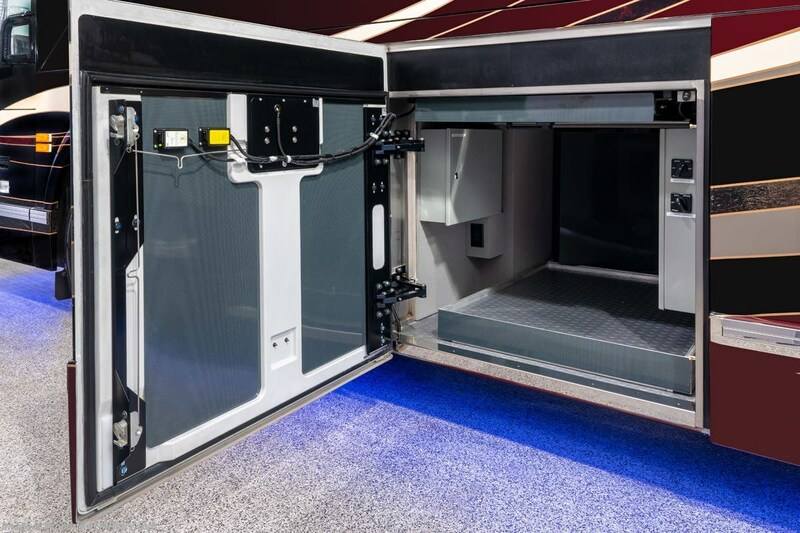 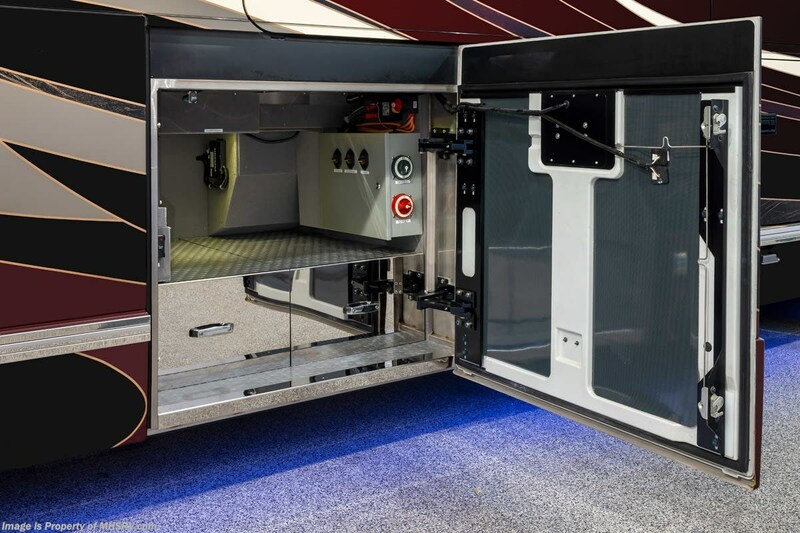 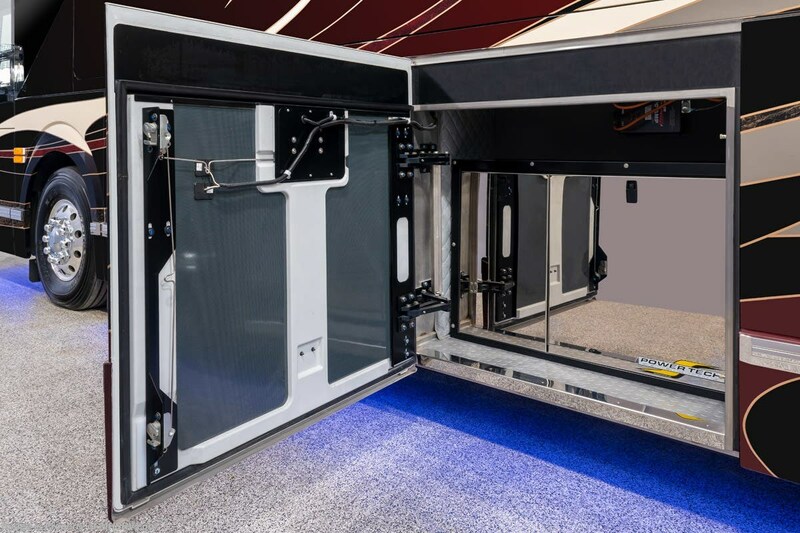 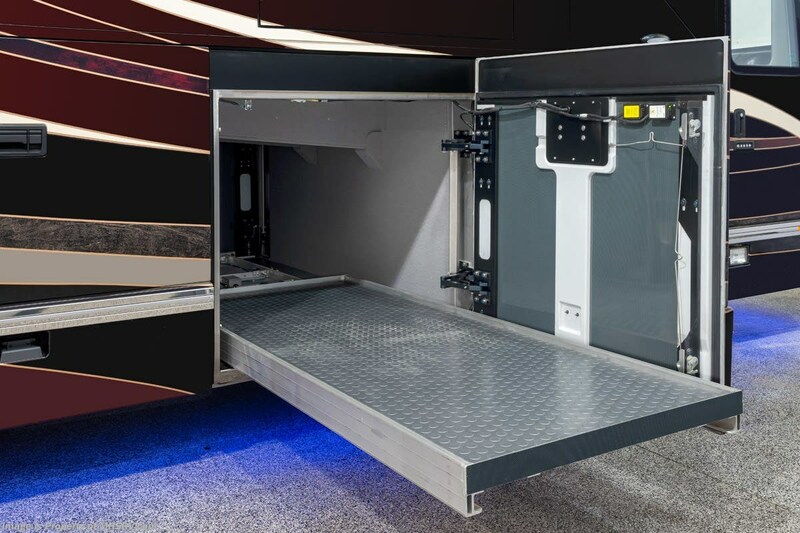 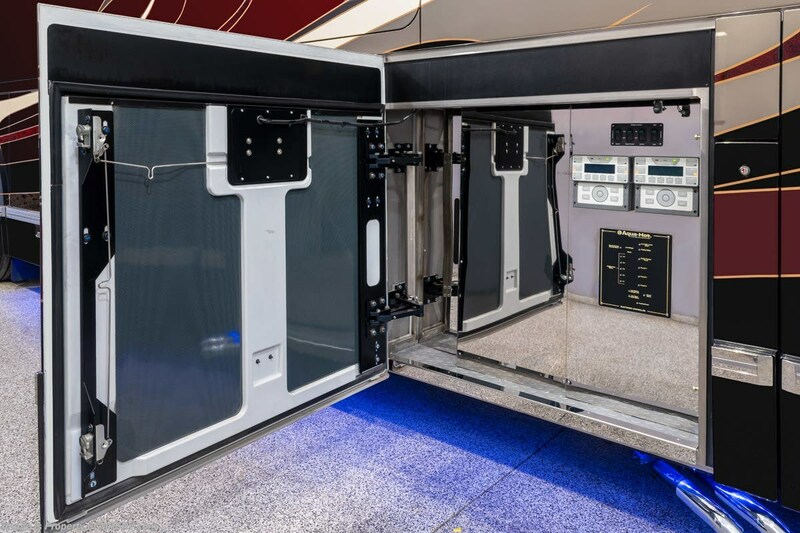 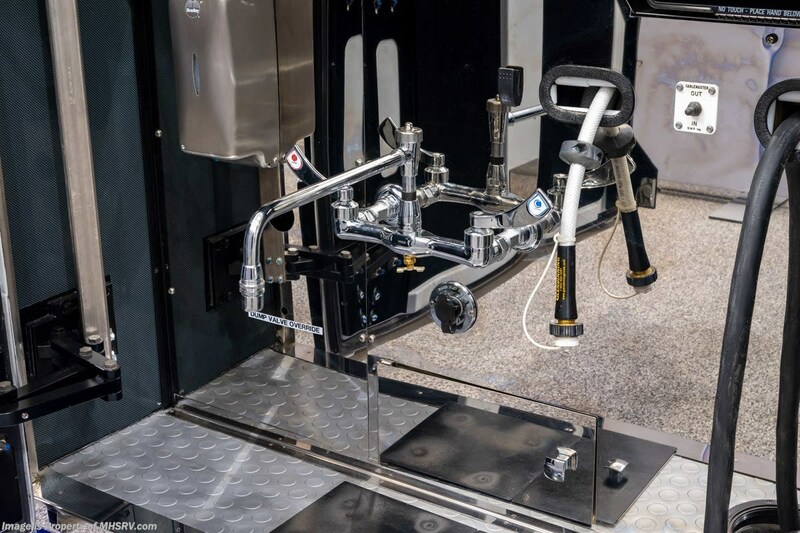 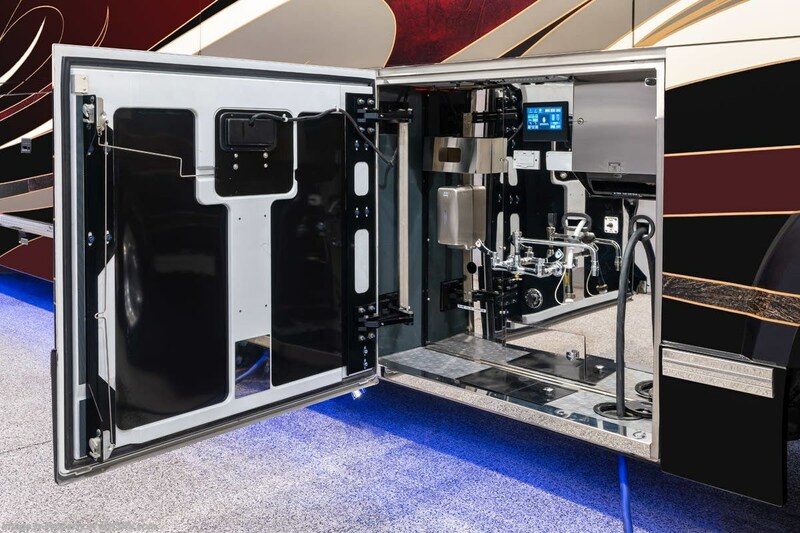 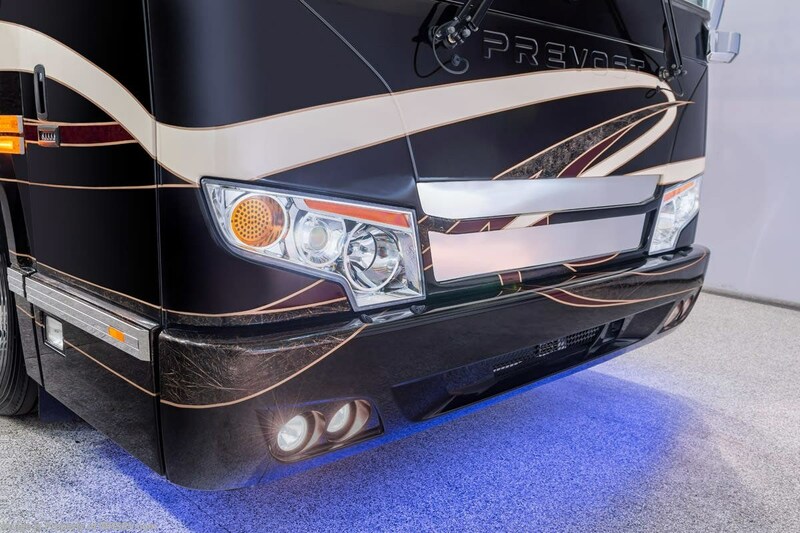 This legendary coach manufacturer has now infused its more than half a century of coach building expertise into the "ultimate in excellence", the Prevost® H3-45 VIP™. 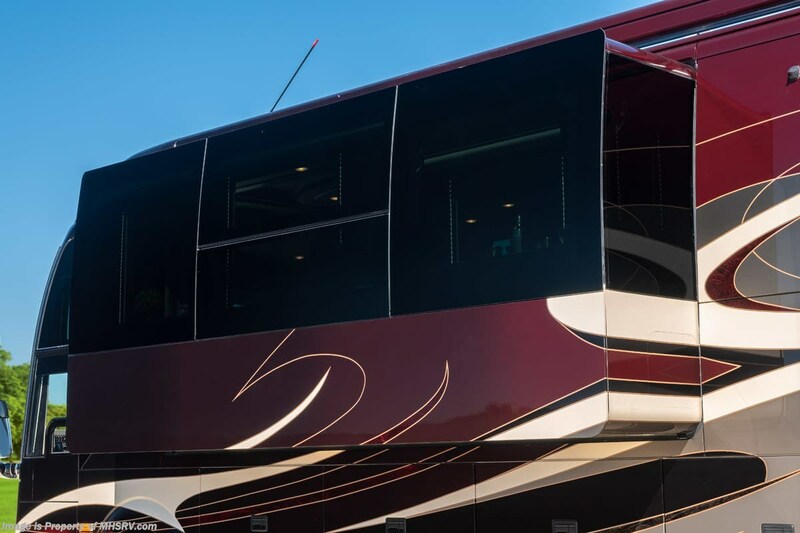 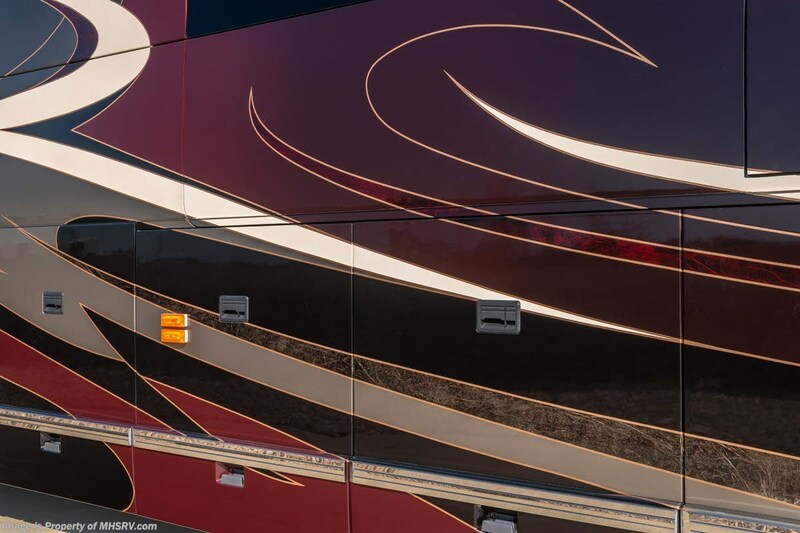 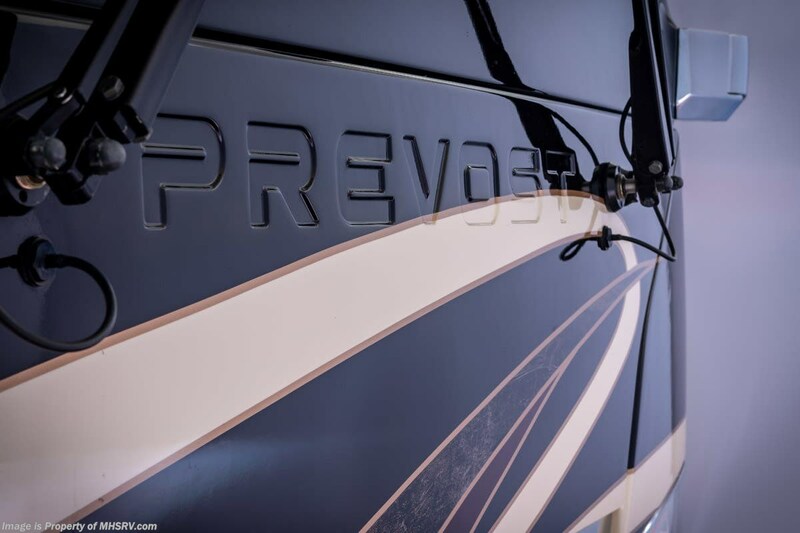 The Prevost® chassis and shell is truly second to none and reserved for only a select few motor coaches and motor coach enthusiasts per year. 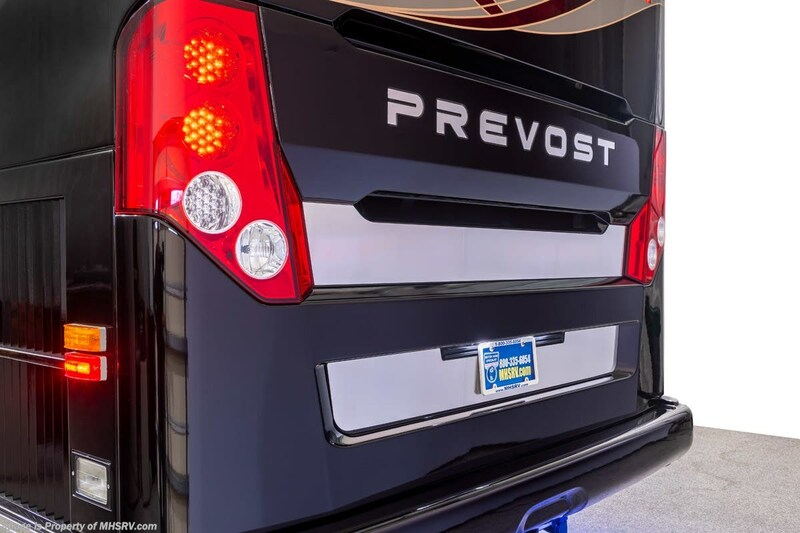 In a Prevost® coach market, filled with opulence and options, the Foretravel Prevost® stands second to none. 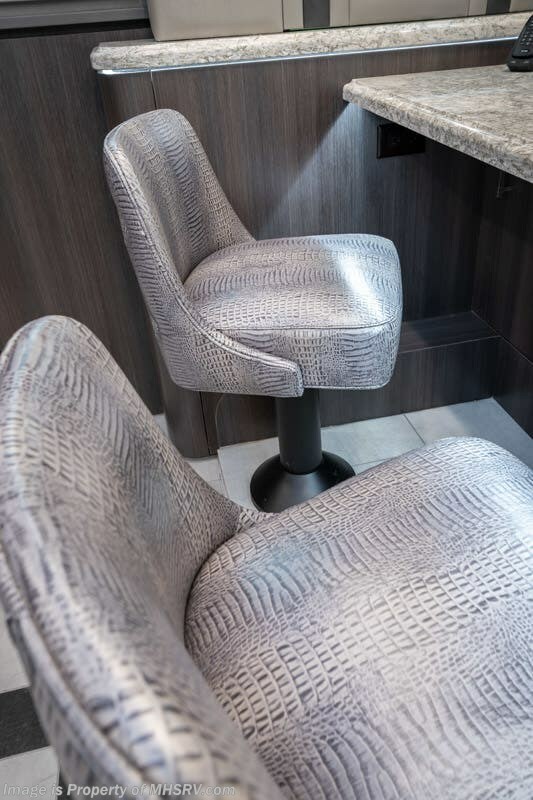 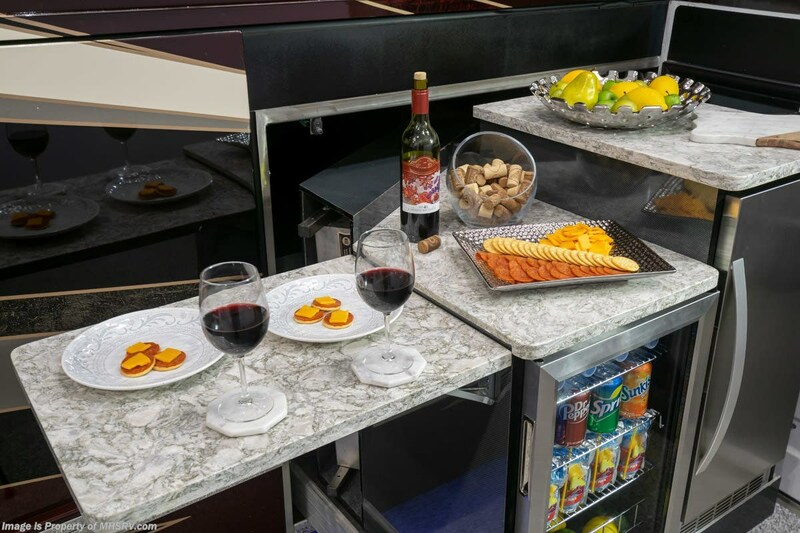 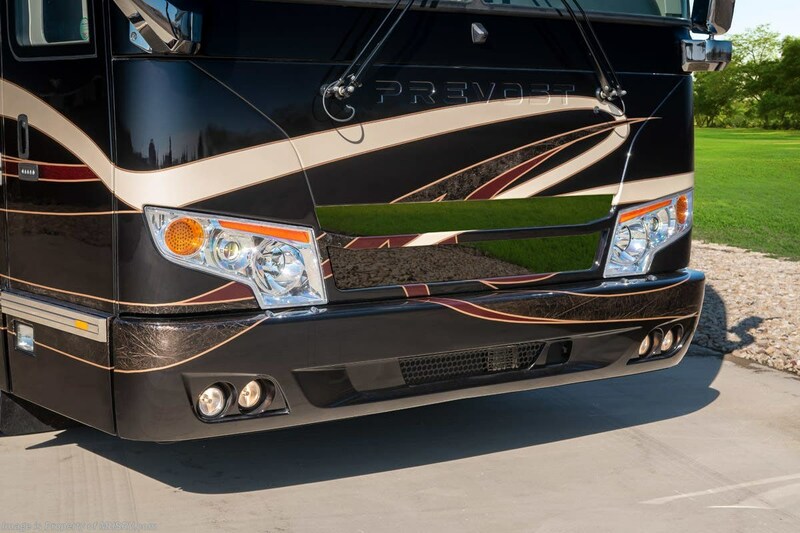 You will not only find the customary luxury features found in most all Prevost® conversions, but an unprecedented level of function, livability and appointments never before offered in a motor coach. 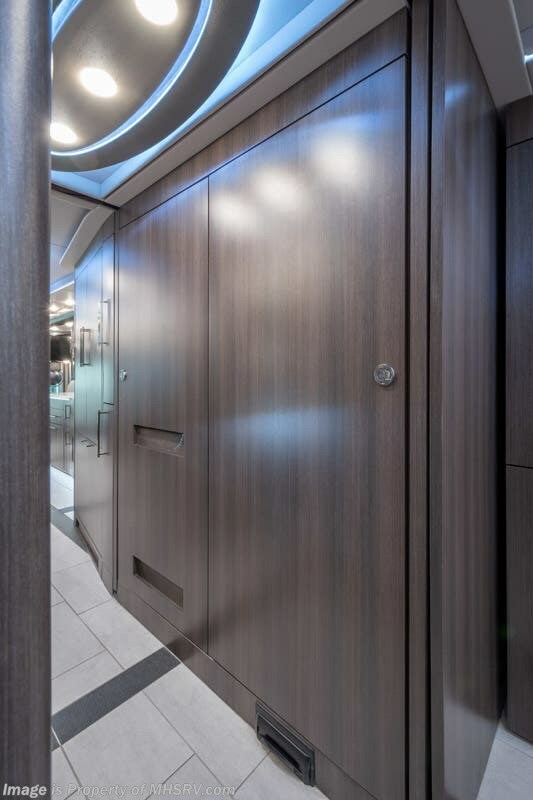 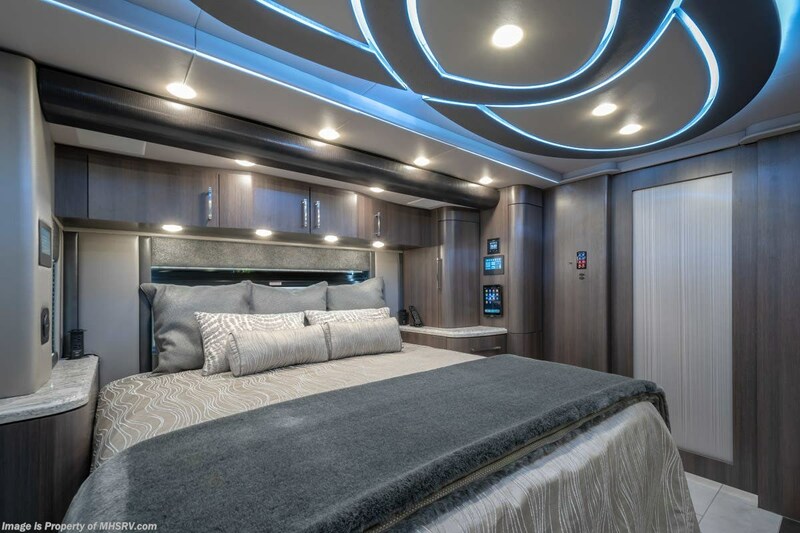 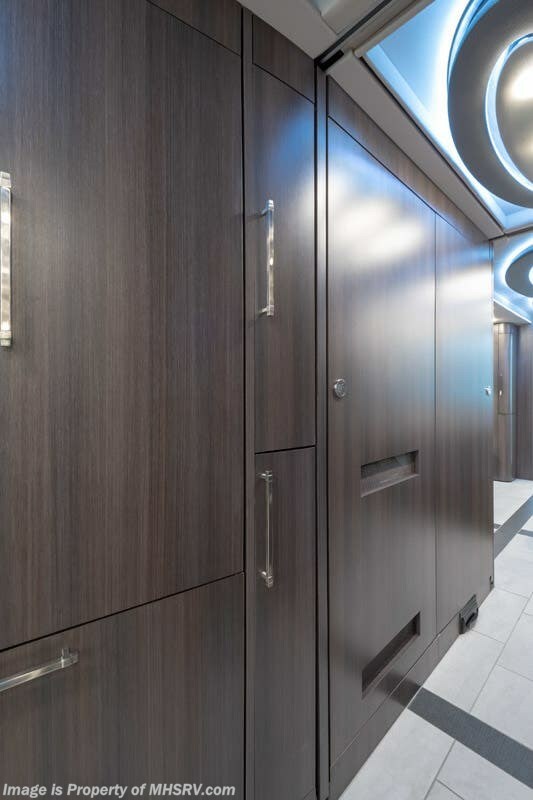 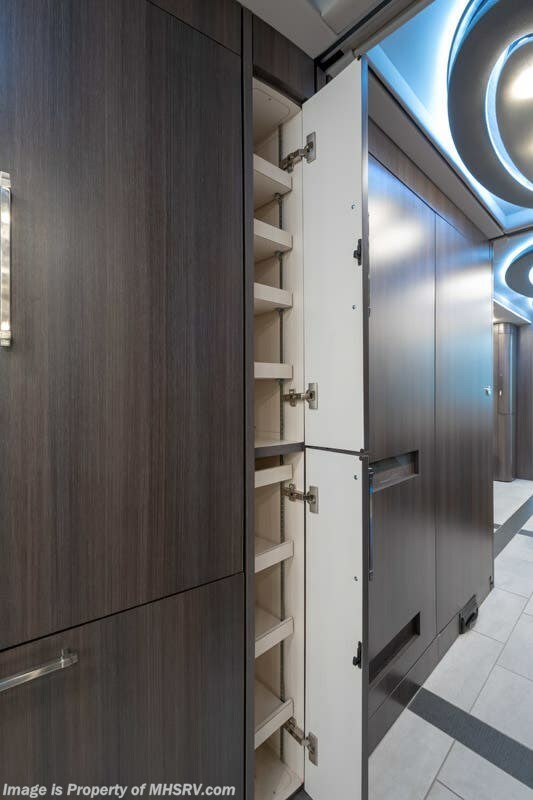 The Emperor Sauna Suite (45ESS) floor plan boast 4 slide-out rooms offering the most spacious galley available. 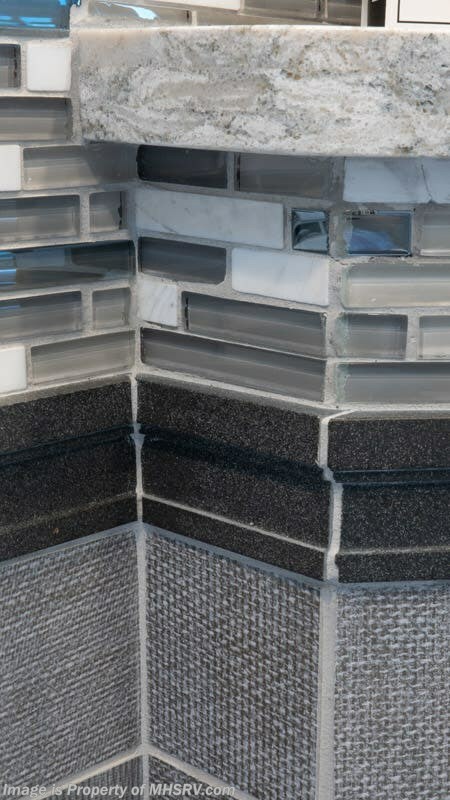 Within the galley you will find Crossville®'s imported porcelain floor tile from Modena, Italy, as well as the highest quality Cambria® solid surface counter tops, masterfully tiled backsplashes and an extraordinarily designed ceiling feature with a multi-color decorative lighting package and cleverly concealed A/C intakes and returns throughout. 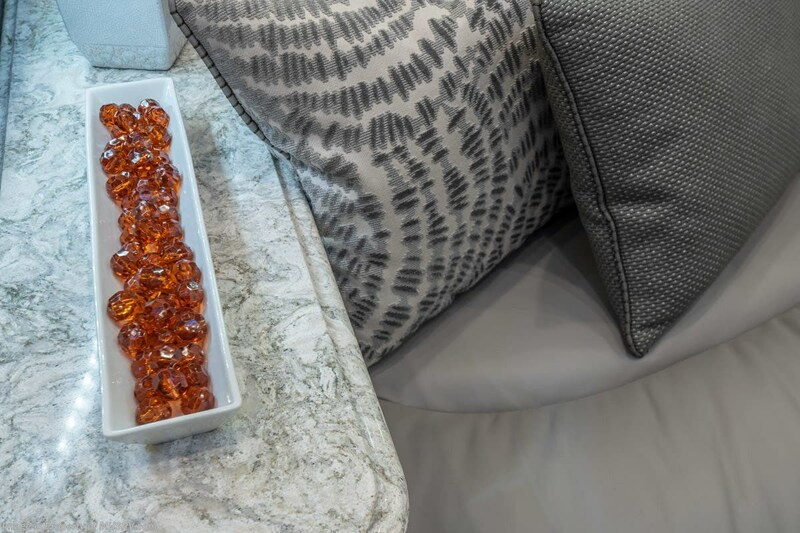 You can enjoy the ambiance of the built-in fireplace year-round as well as change the look and feel of the coach with Meural® and a swipe of your hand. 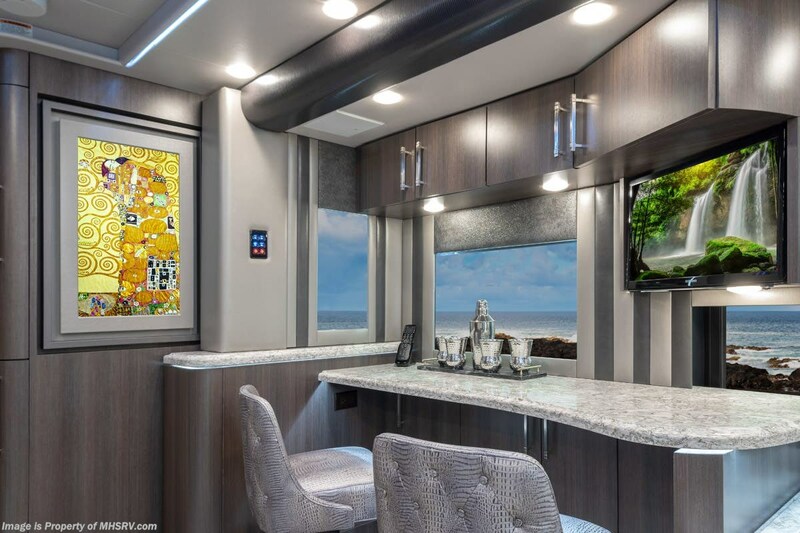 The feature wall in the galley displays Meural®'s digital art exhibit. 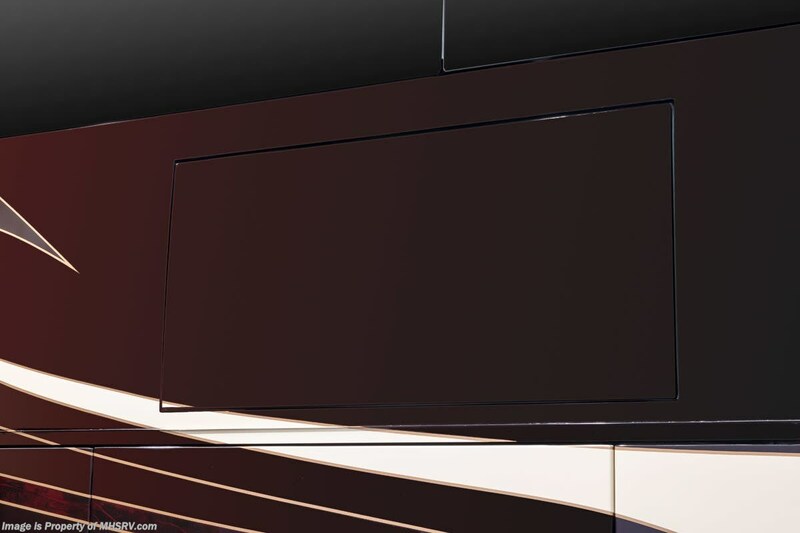 With stunning realism you will have digital access to tens of thousands of works of art from museums and galleries around the world. 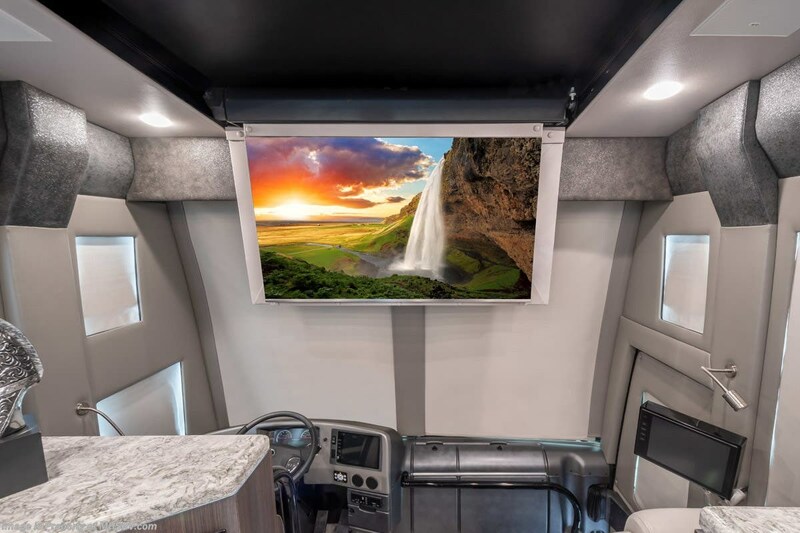 You can also display your own photographic works of art and family photos as you travel across the country. 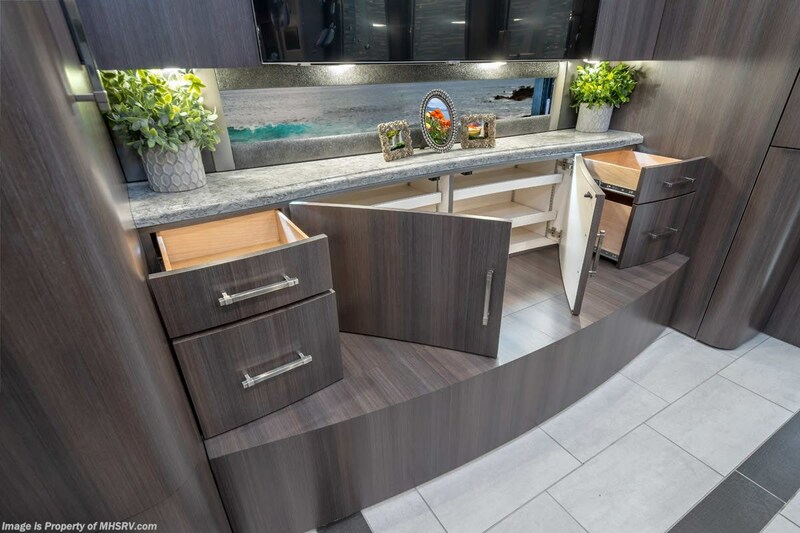 Additional galley highlights include a power drop down 49" QLED HD TV in the living room, a beautiful yet practically designed work and leisure space with built in 1080P HDTV, a fully integrated refrigerator, dishwasher drawer, an ultra high-end Karbon® fiber articulating kitchen faucet by Kohler® and additional high-end appliances throughout including the space saving Signature Series LG® washer/dryer found in the 45ESS laundry cabinet. 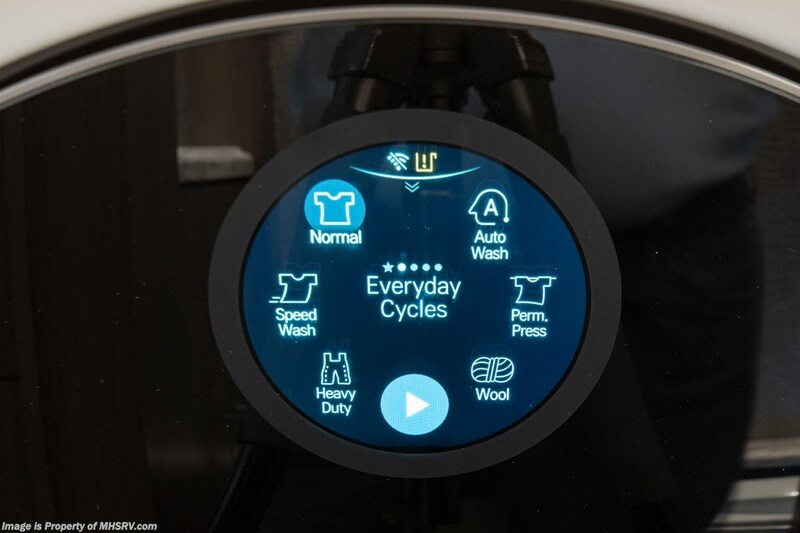 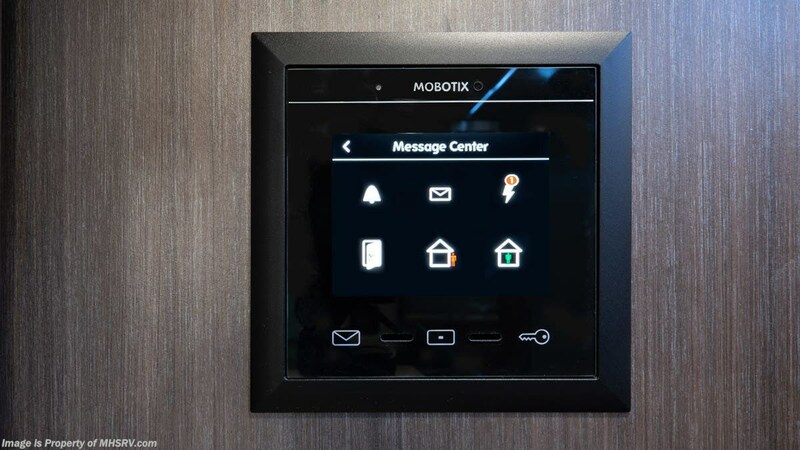 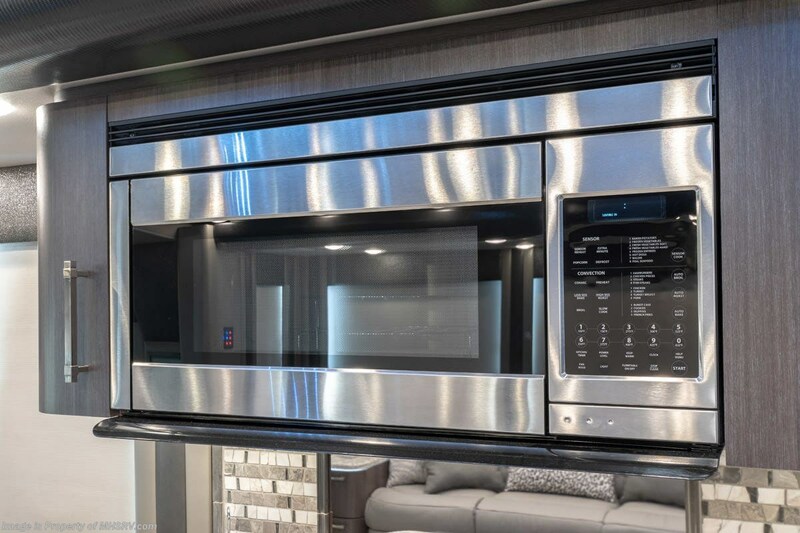 Enjoy advanced LG® features like Auto-Dosing, LED display and SmartThinQ® technology providing you remote management of all key features. 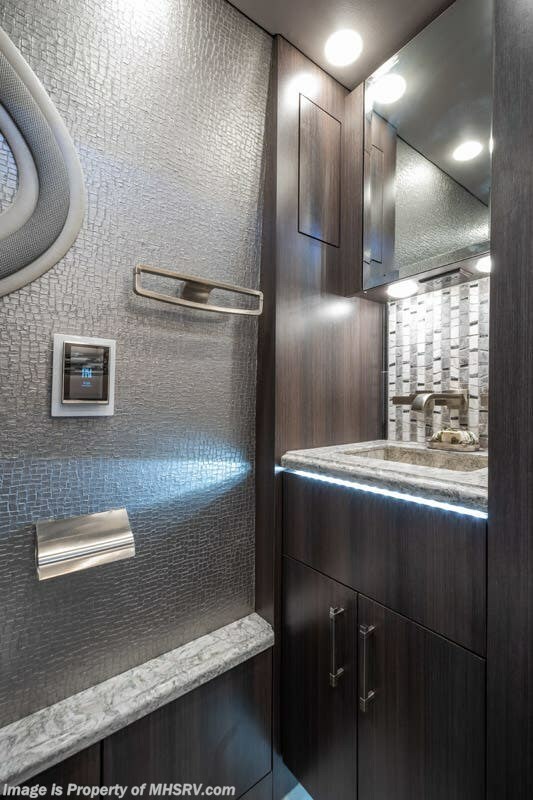 The master lavatory is a split bath and is adorned in only the very best. The Kohler Numi® Comfort Height® smart commode is Kohler's most advanced commode offering personalized settings that allow you to fine-tune every option to your exact preferences, from ambient colored lighting, to wireless Bluetooth® music sync capability, to the heated seat and foot warmer. 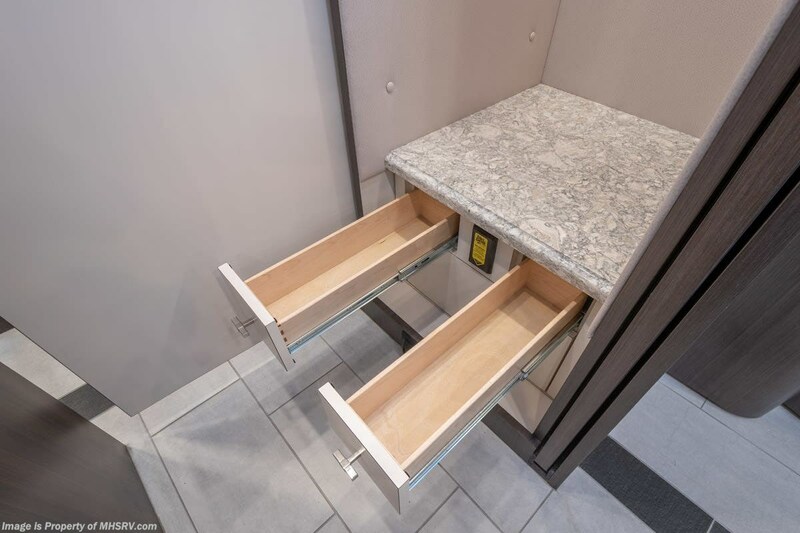 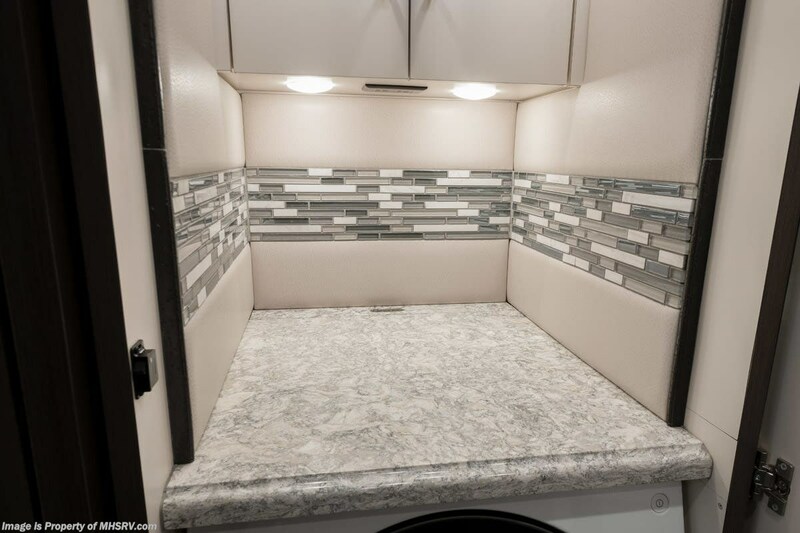 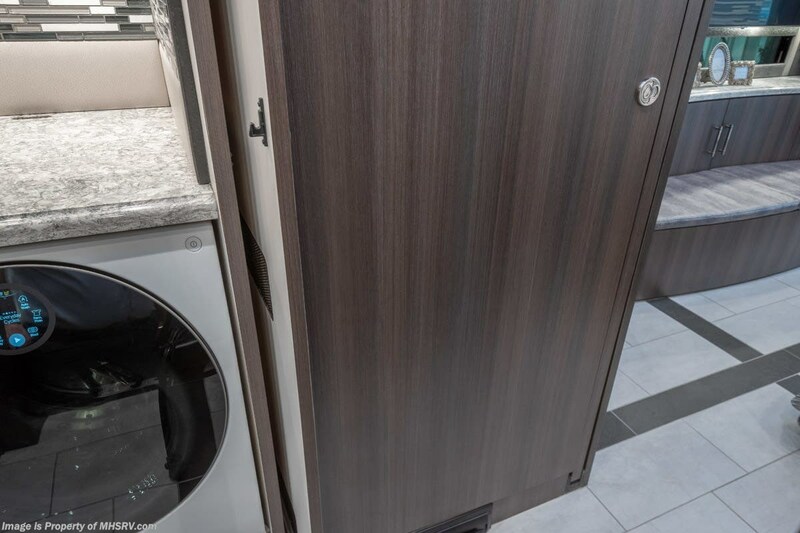 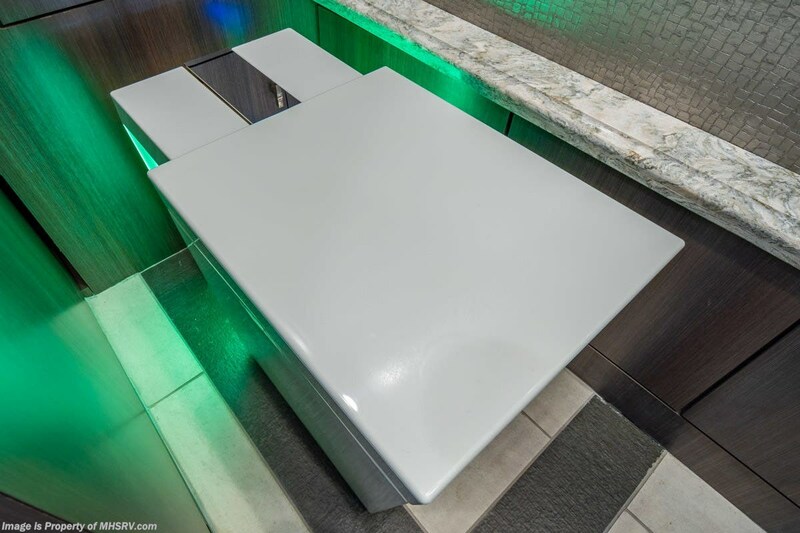 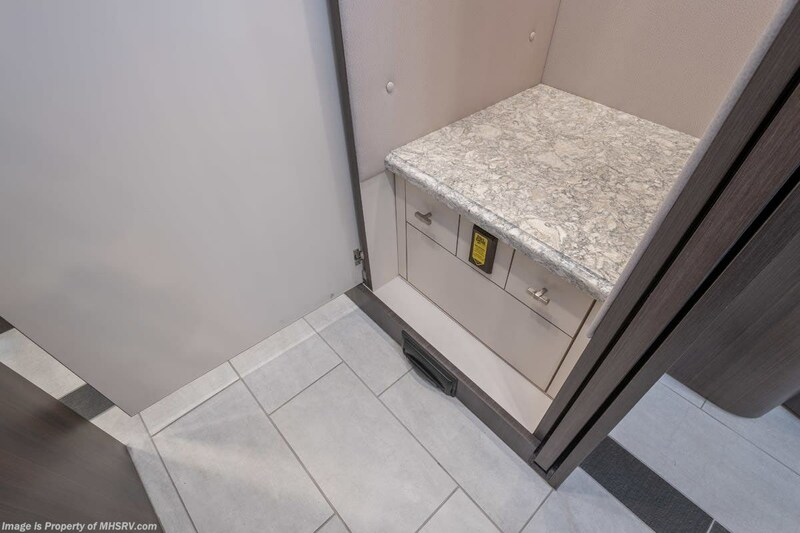 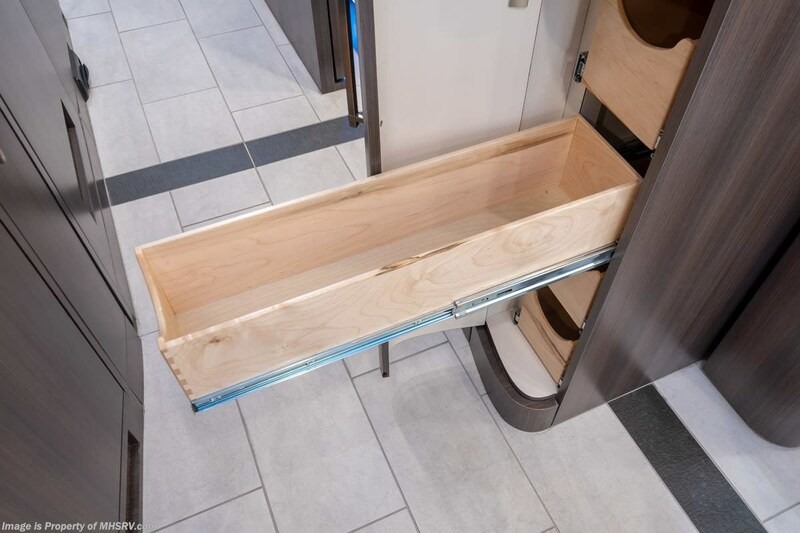 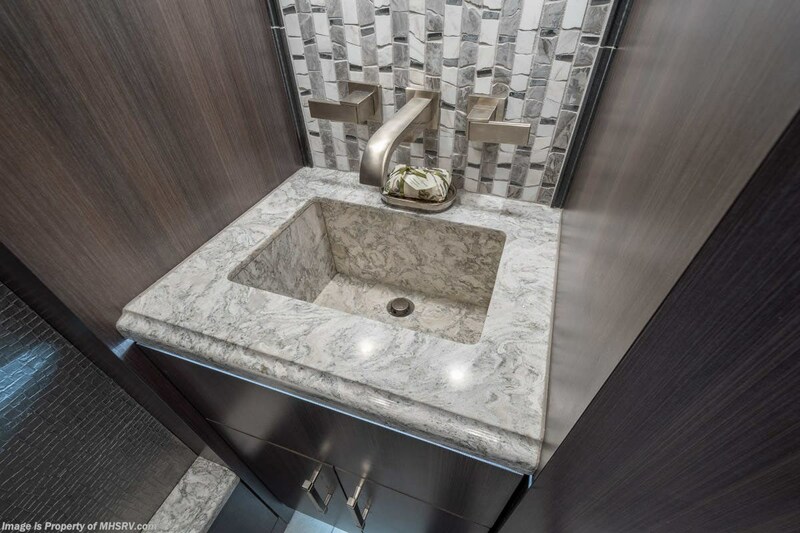 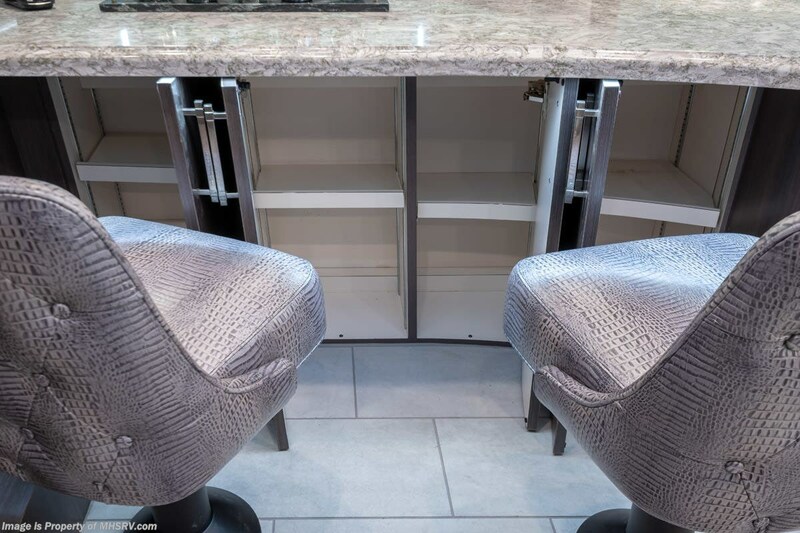 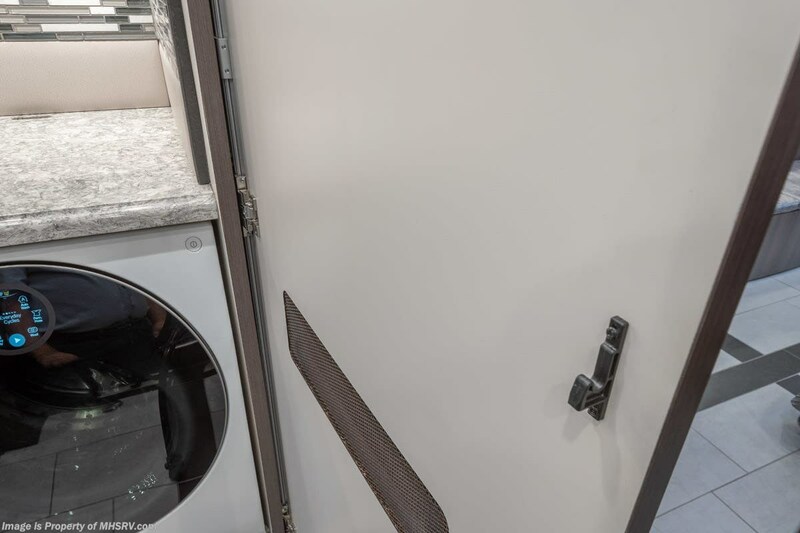 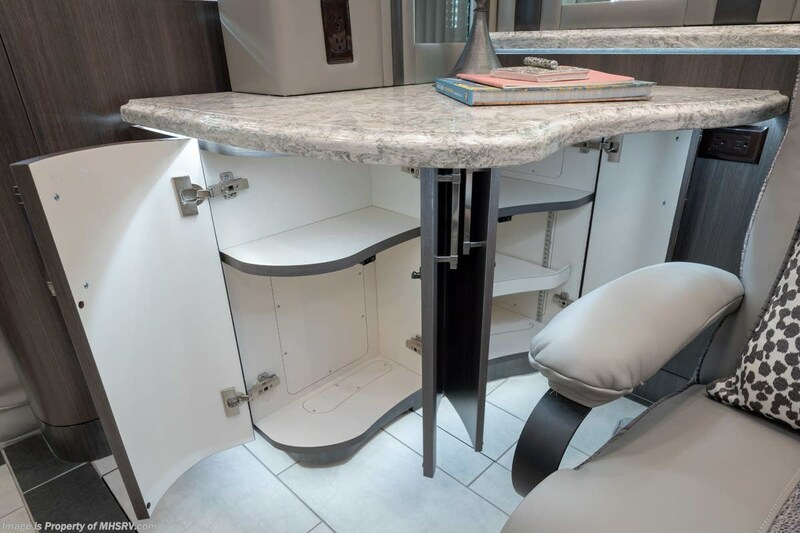 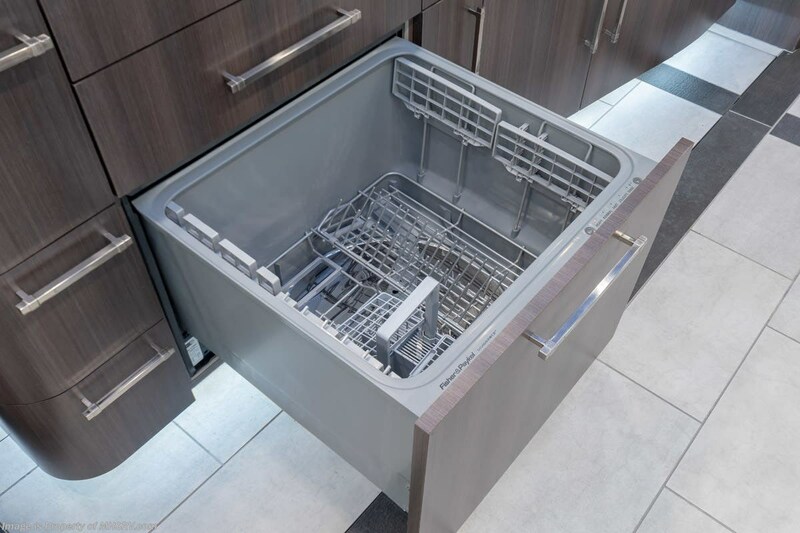 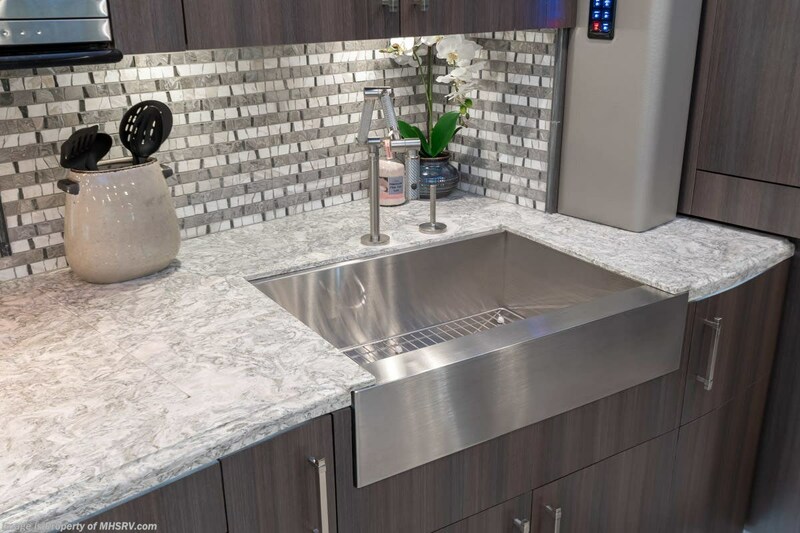 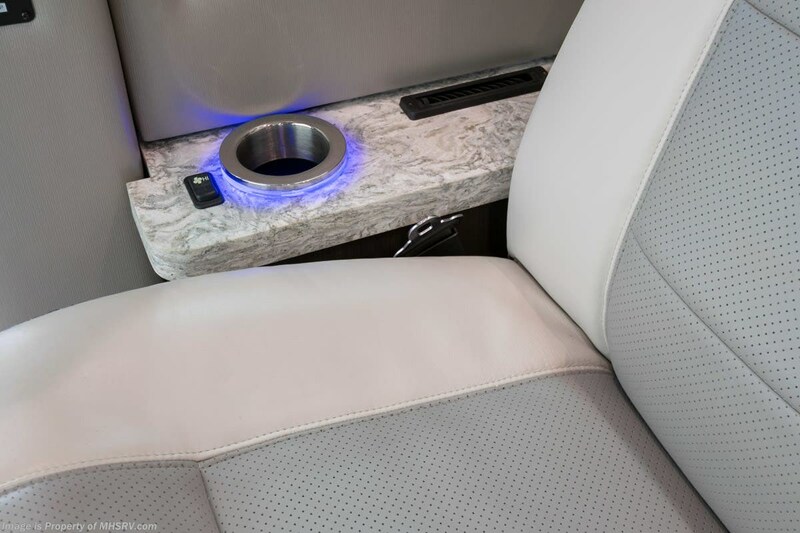 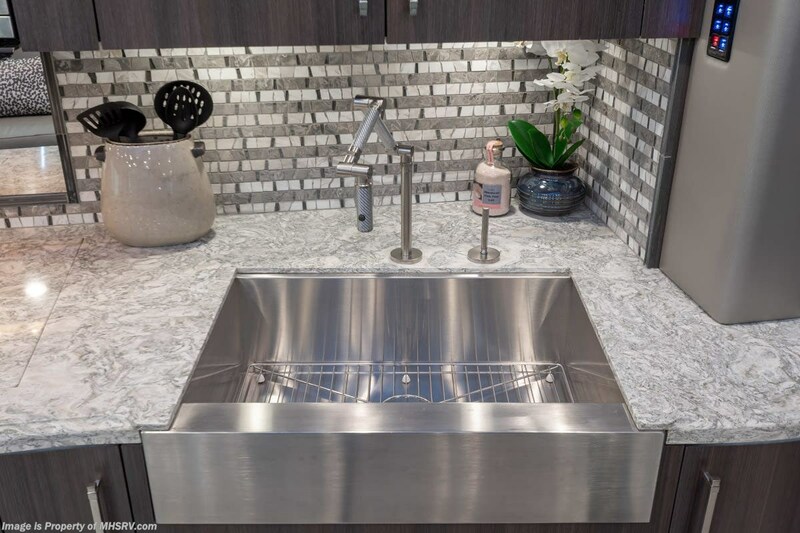 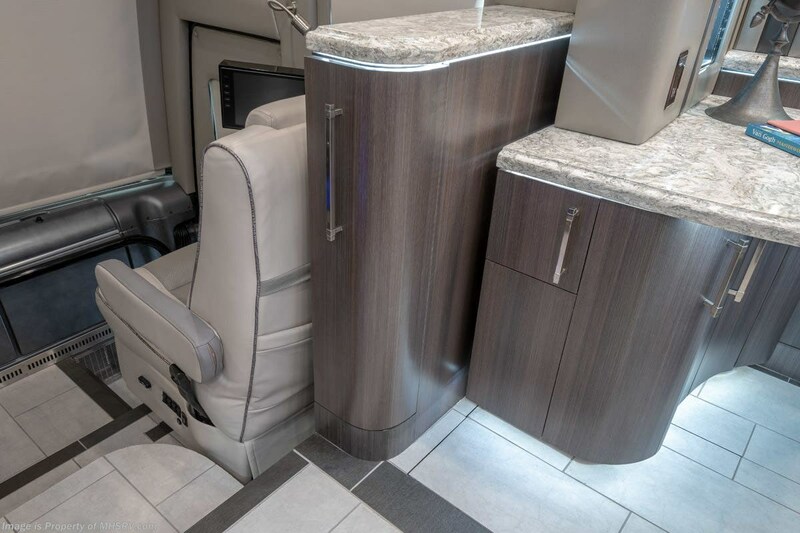 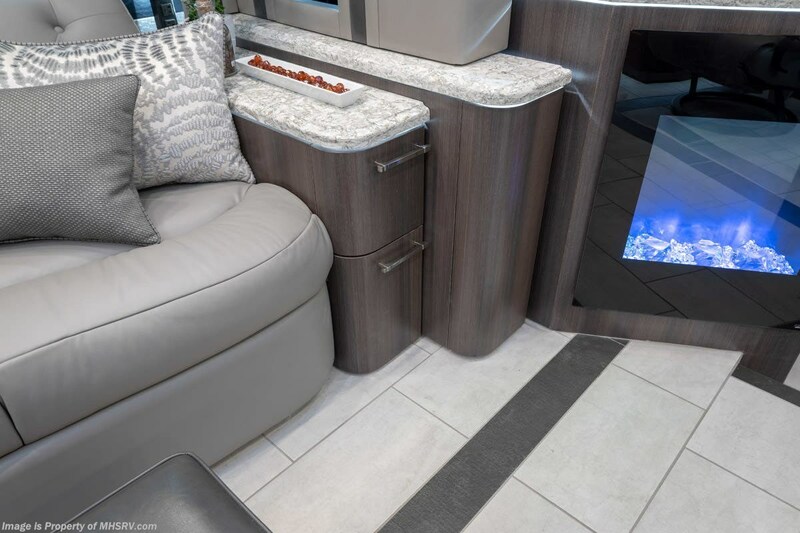 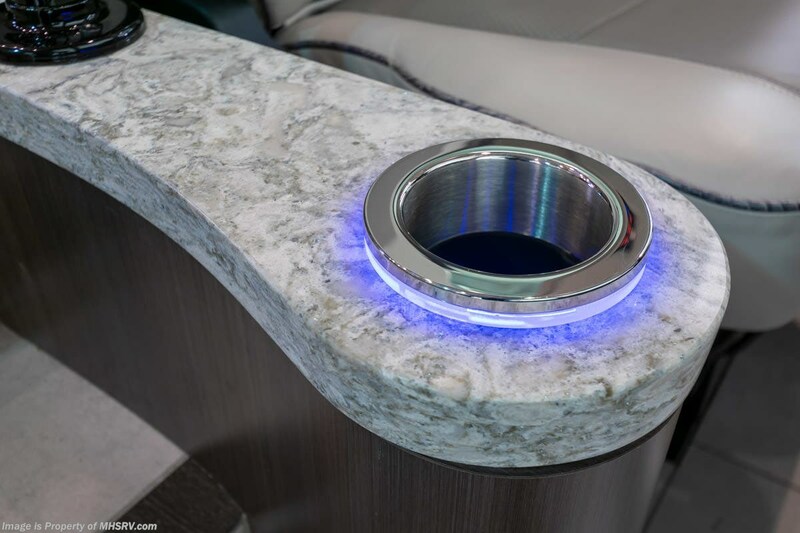 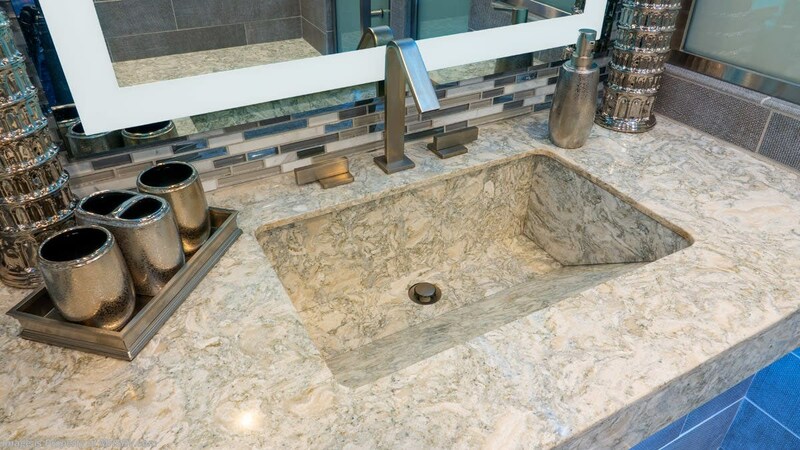 This spacious lavatory also boast a custom built wedge style sink that is specifically made for the Foretravel 45ESS to maximize size and space. 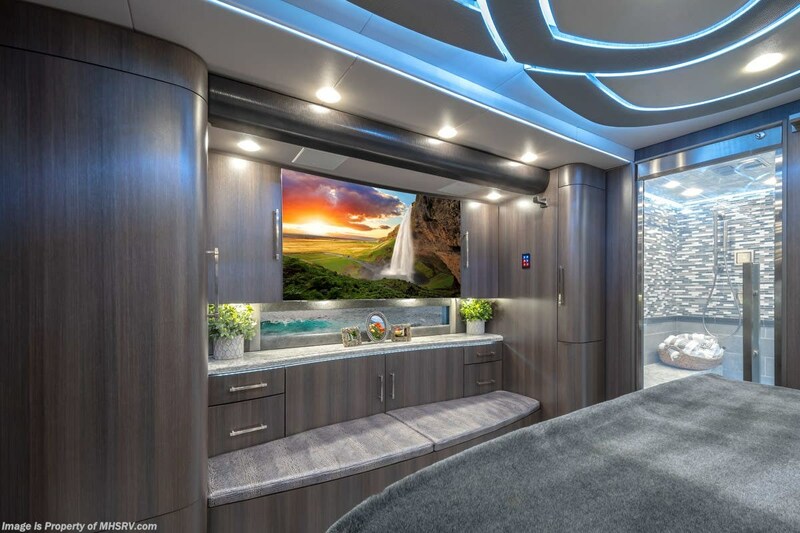 The master suite boast plenty of closet and storage space, a large seating area as well as a 55" QLED 4K curved television that fits the space perfectly. 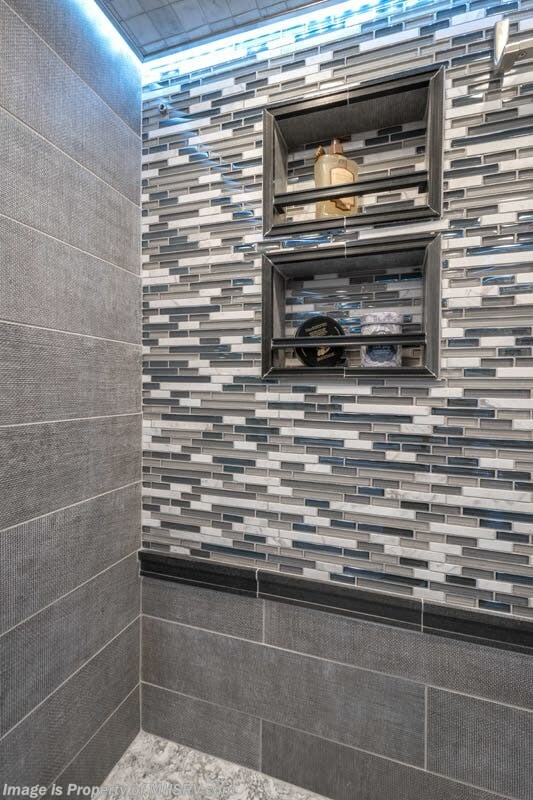 Then there is the rear portion of the master bath. 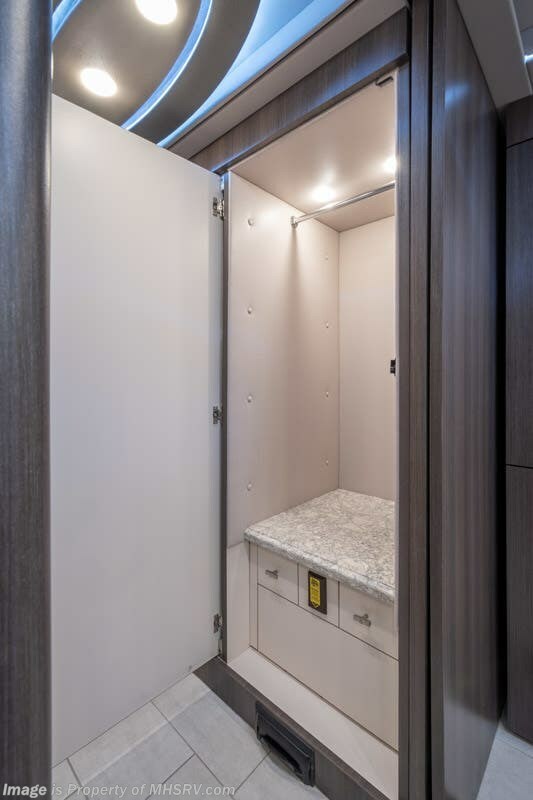 When dry, the room acts as a traditional powder room. 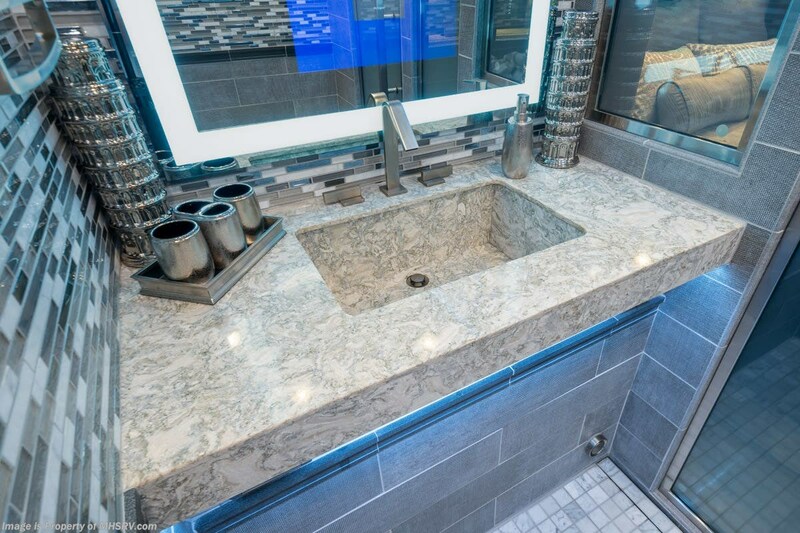 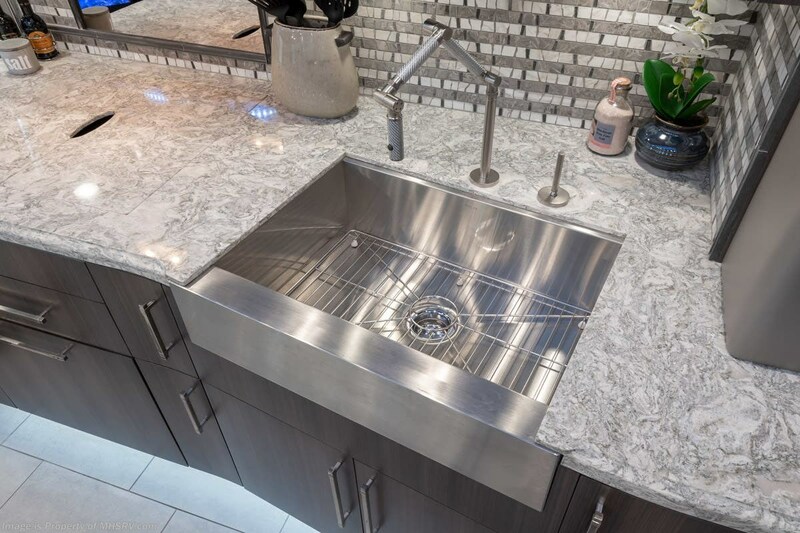 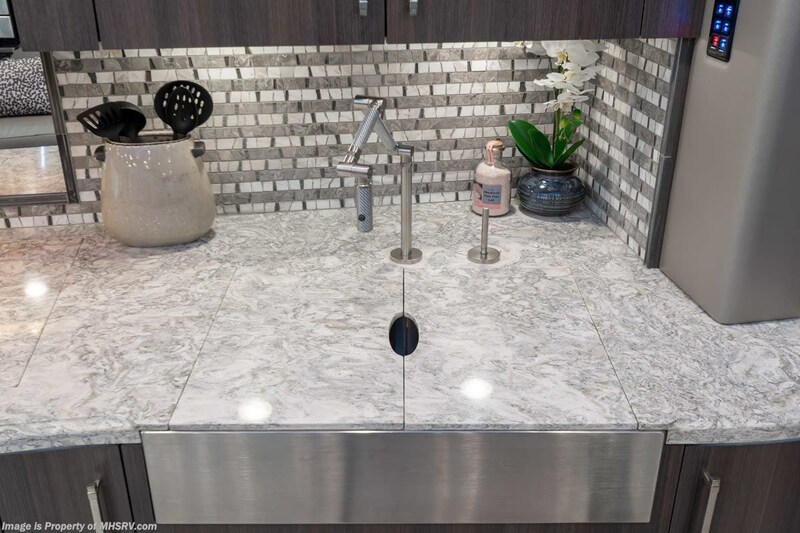 You'll find a second large custom built wedge style sink, plenty of counter space and a built in MirrorVue® bath & shower television. 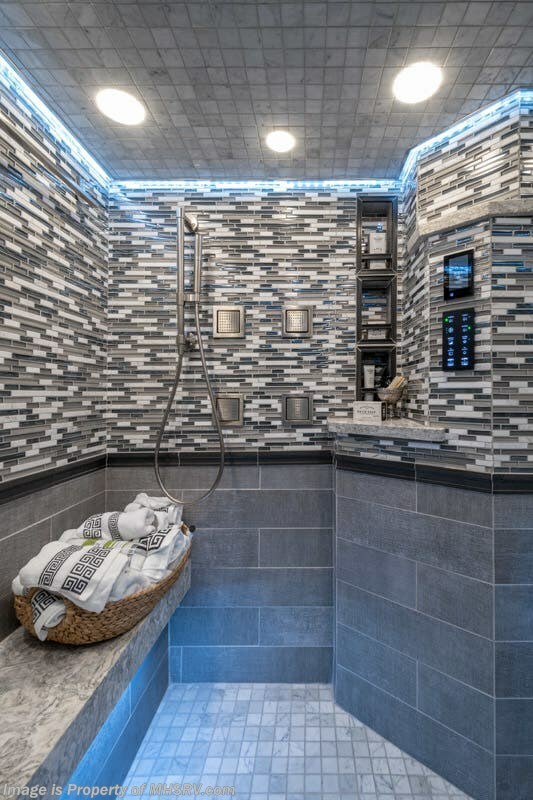 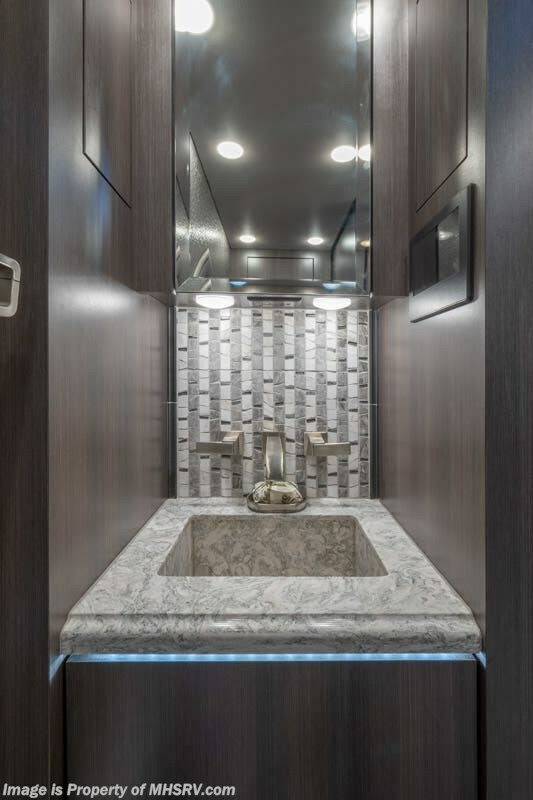 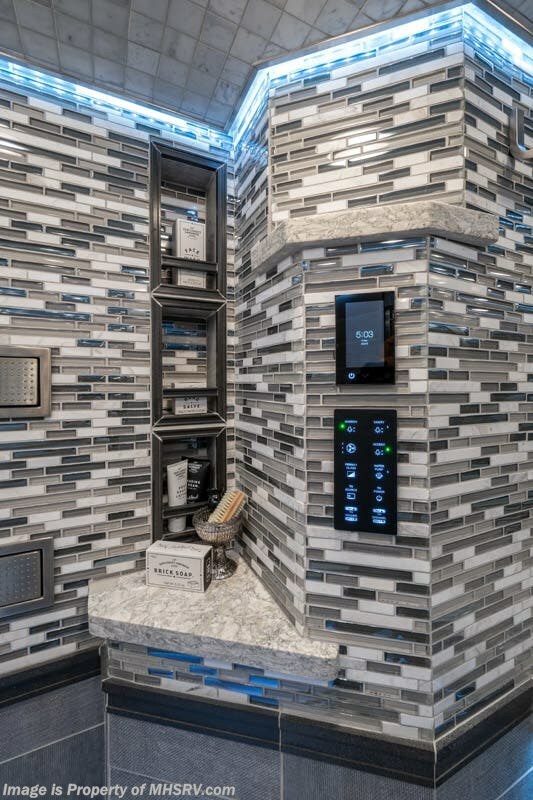 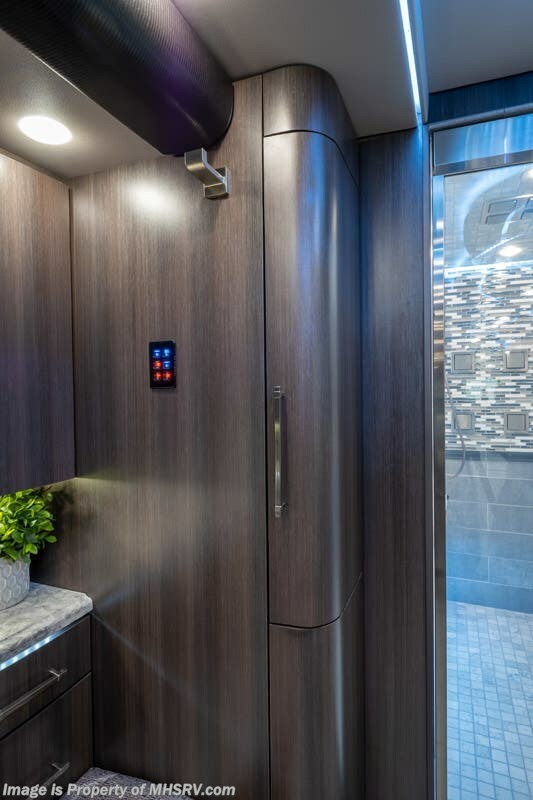 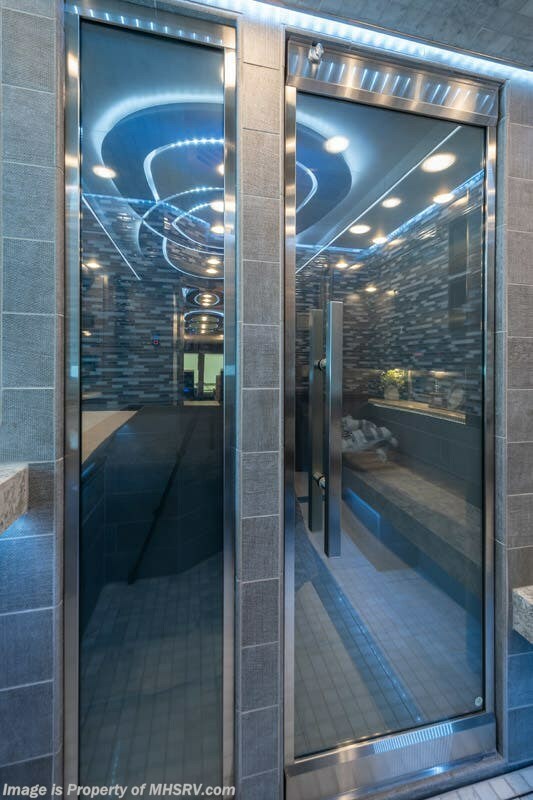 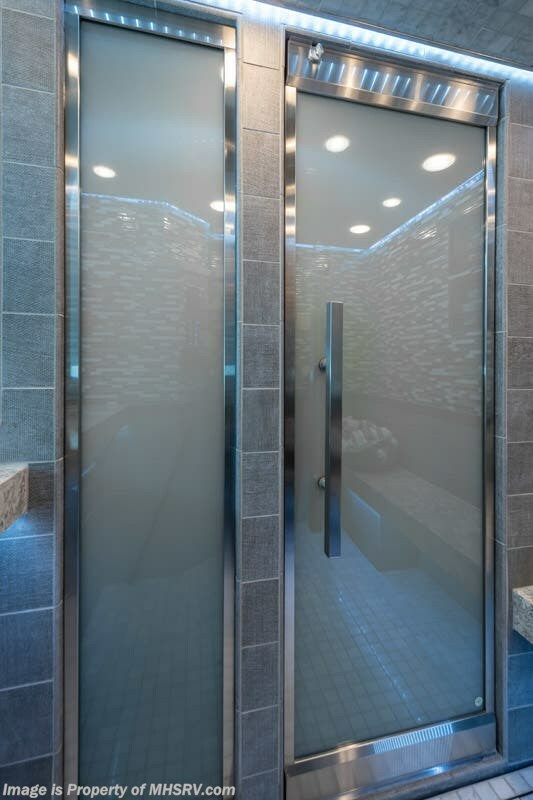 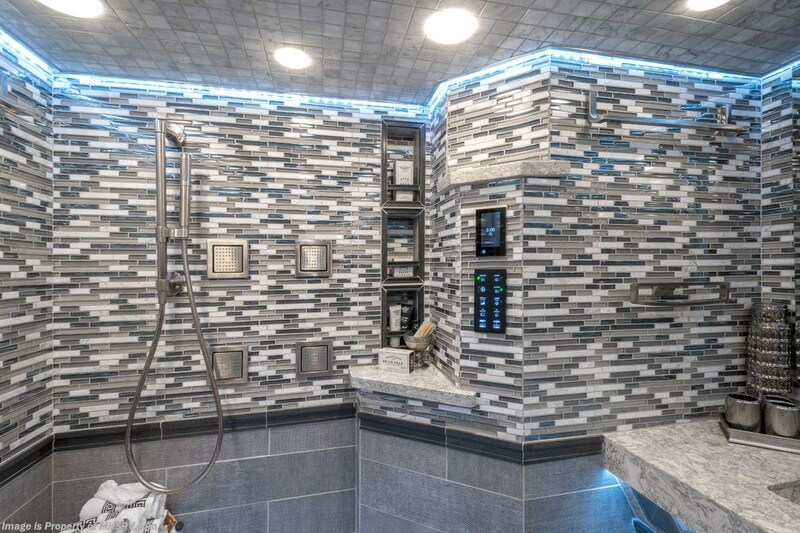 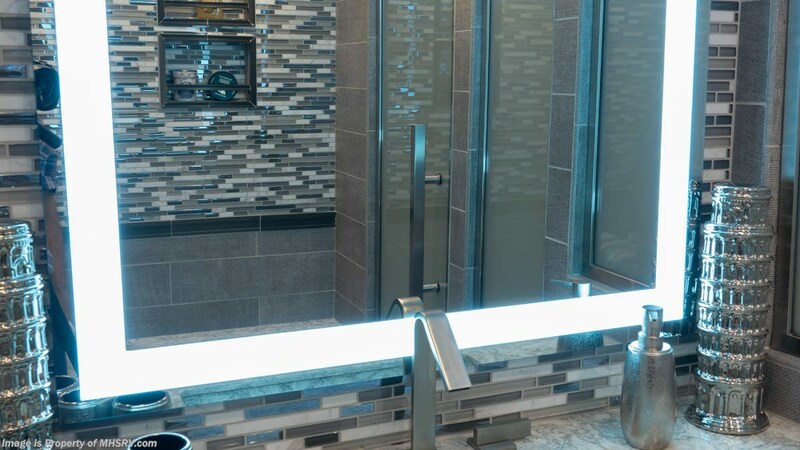 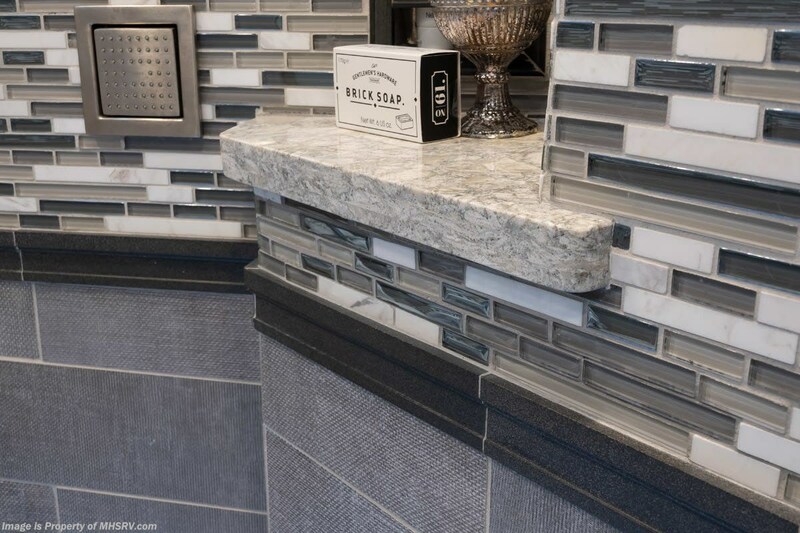 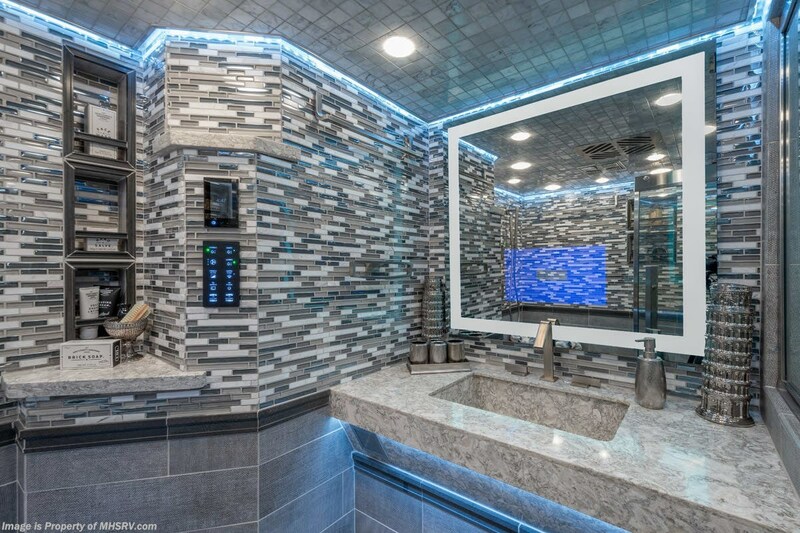 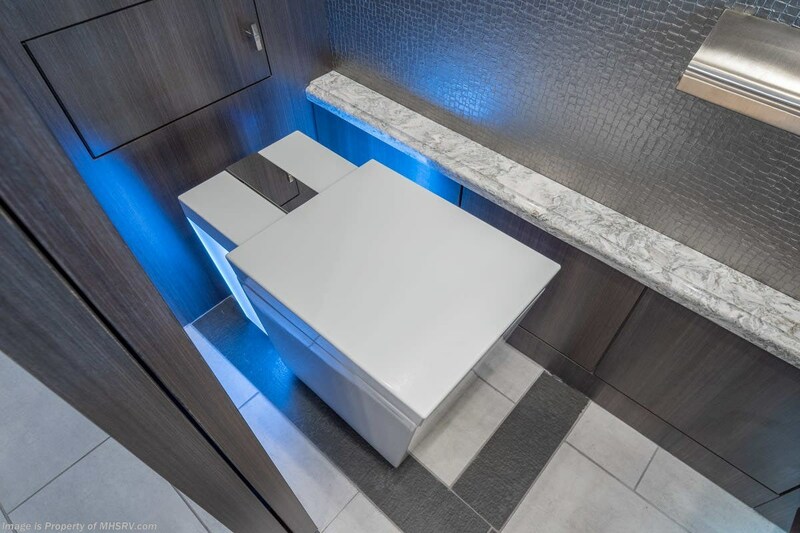 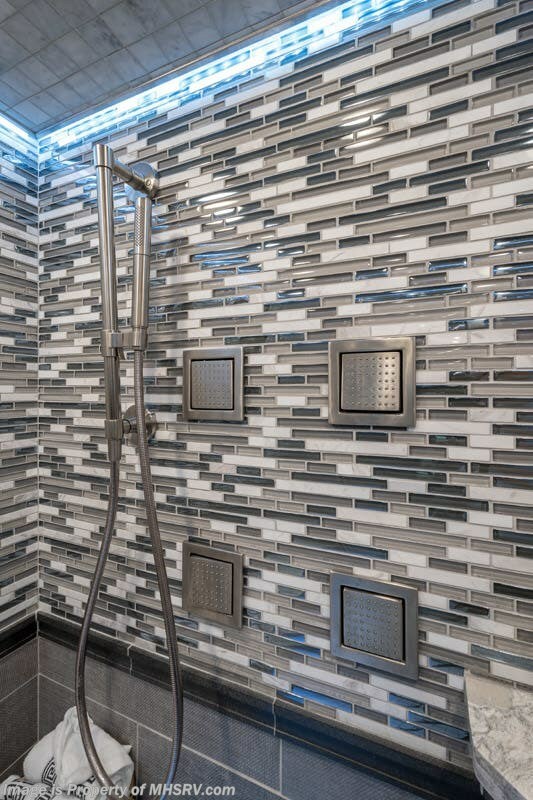 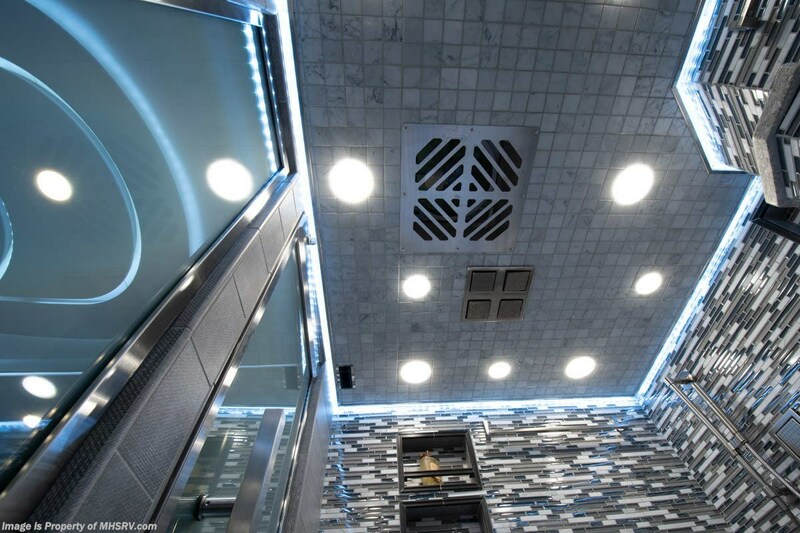 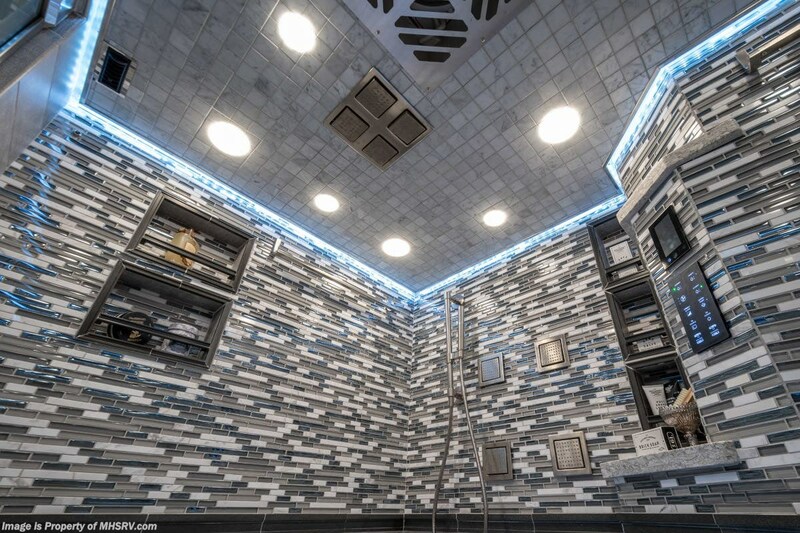 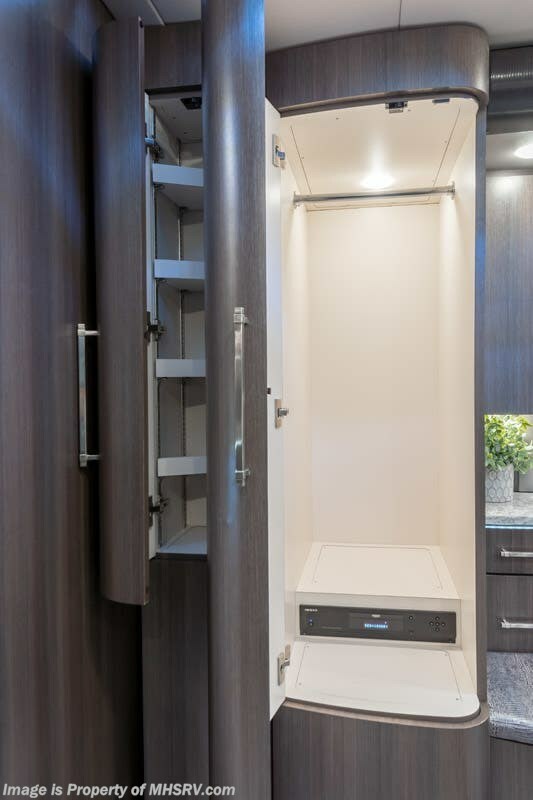 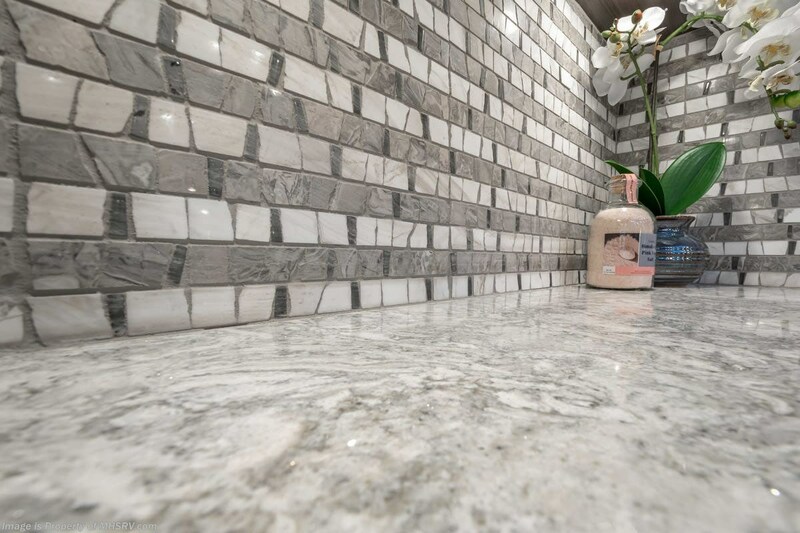 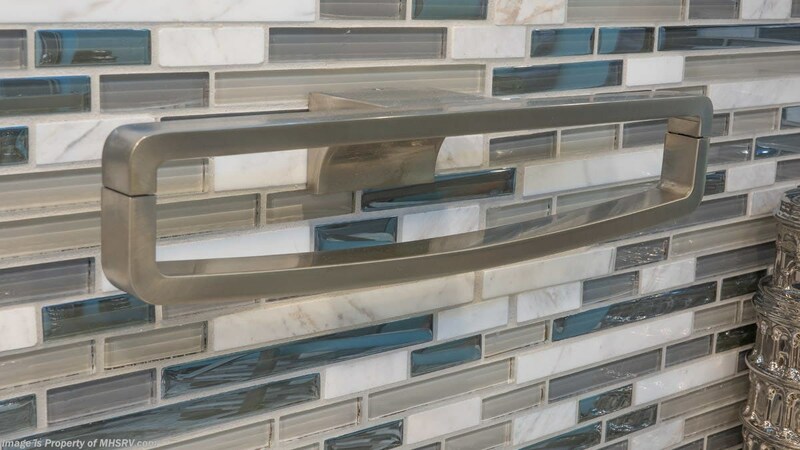 When wet, this powder room transforms into your very own spa like retreat and because it is the largest master shower ever constructed in a Prevost® it can easily become a couple's retreat as well. 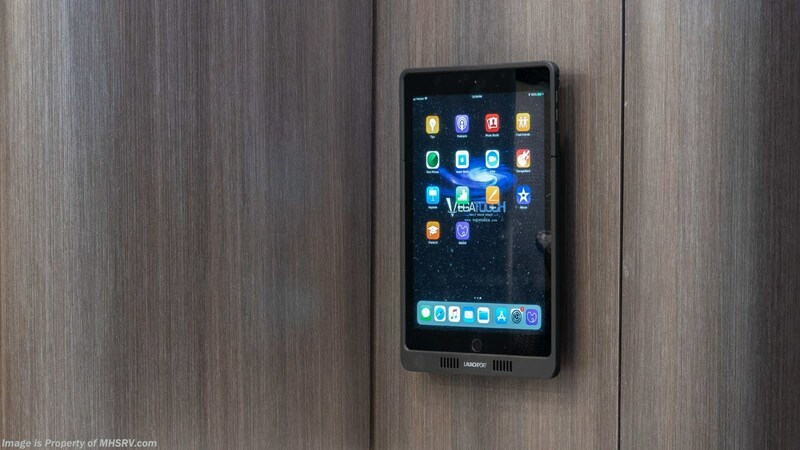 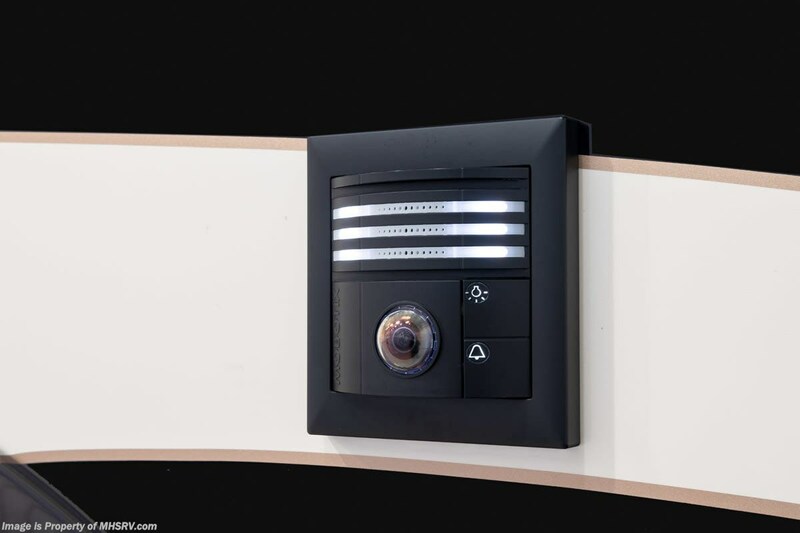 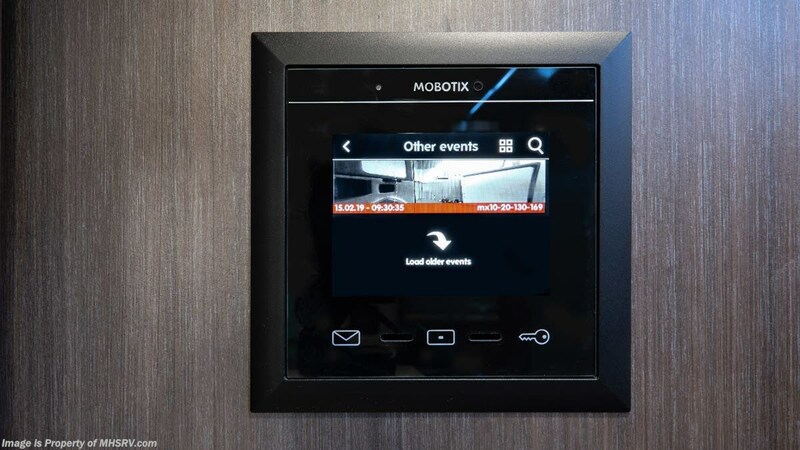 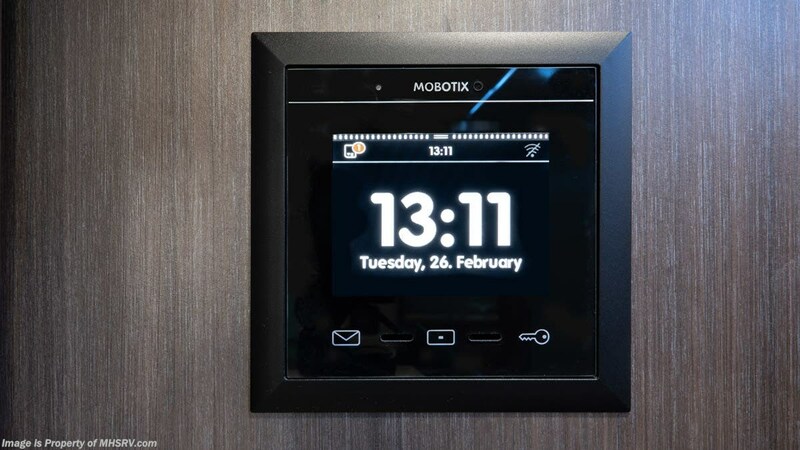 Create privacy by electronically frosting the glass door and wall. 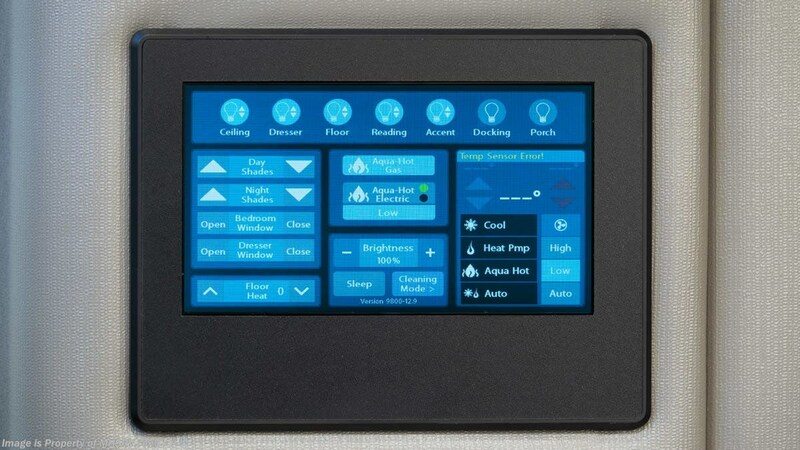 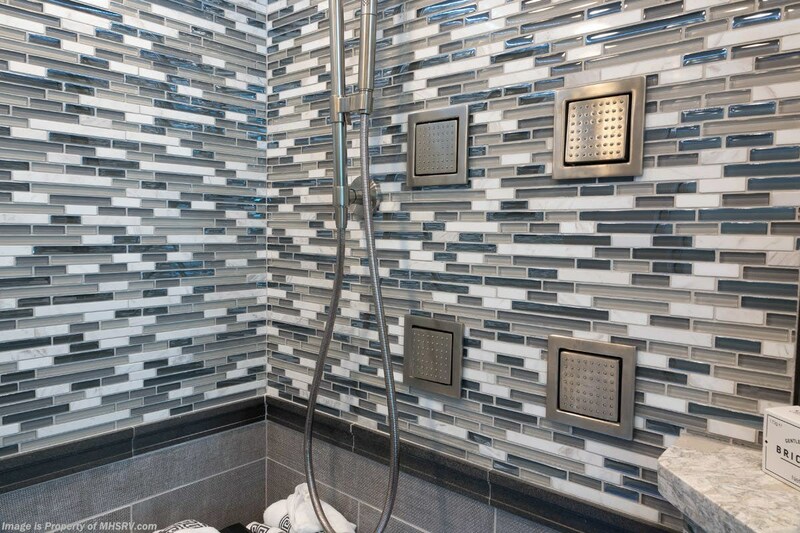 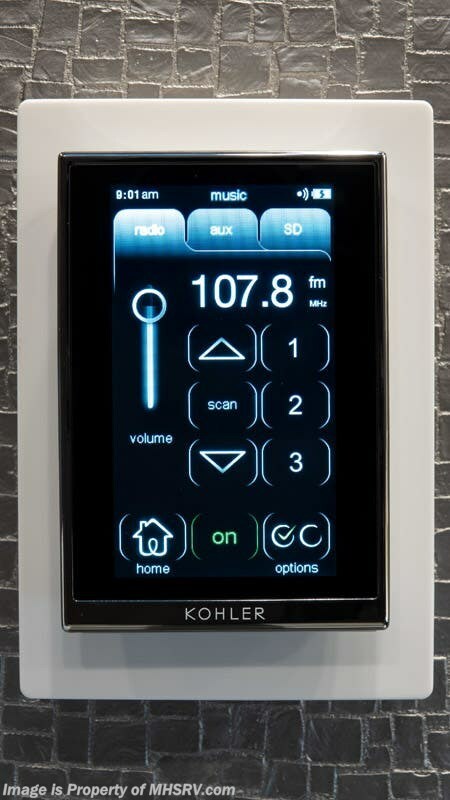 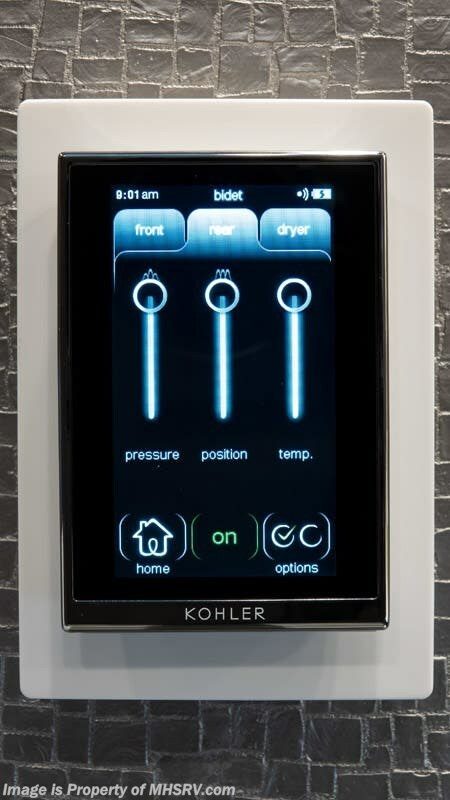 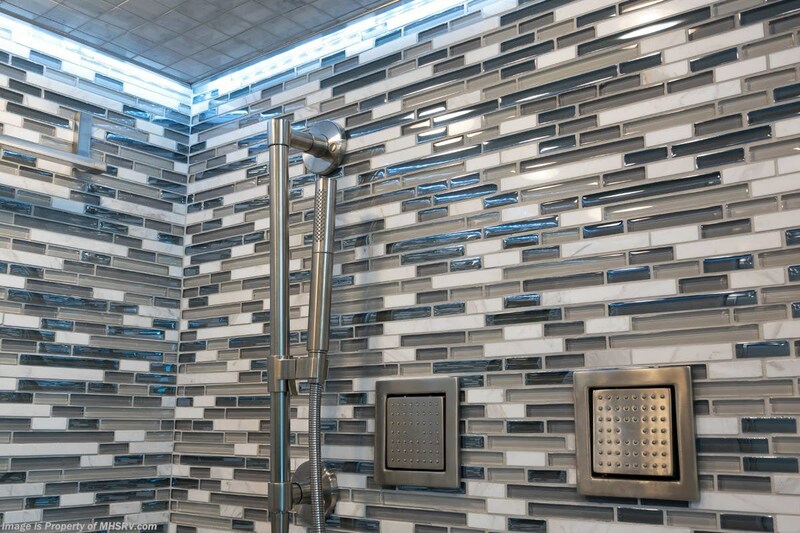 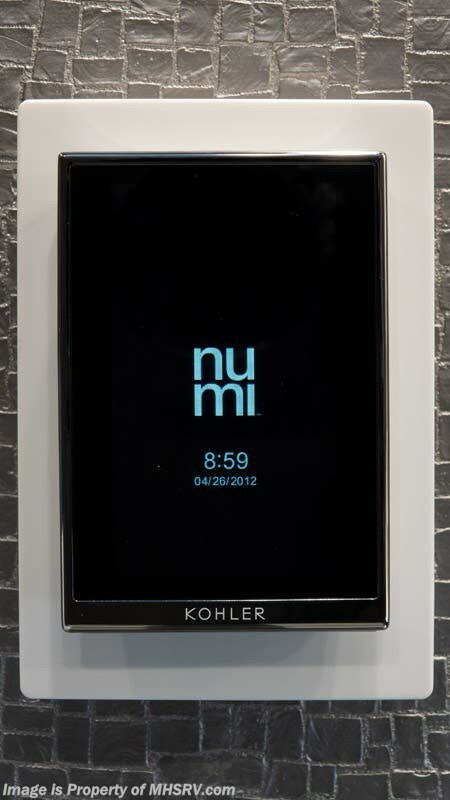 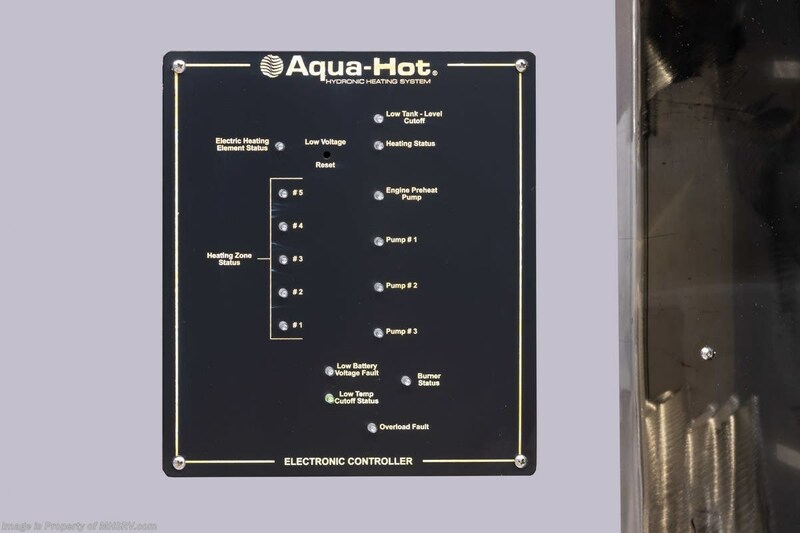 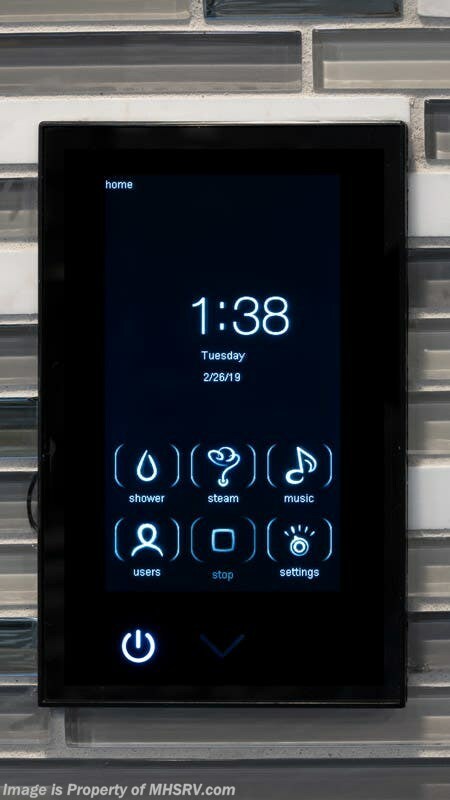 Digitally control the temperature, water settings and even the incredible sound system installed in the master shower. 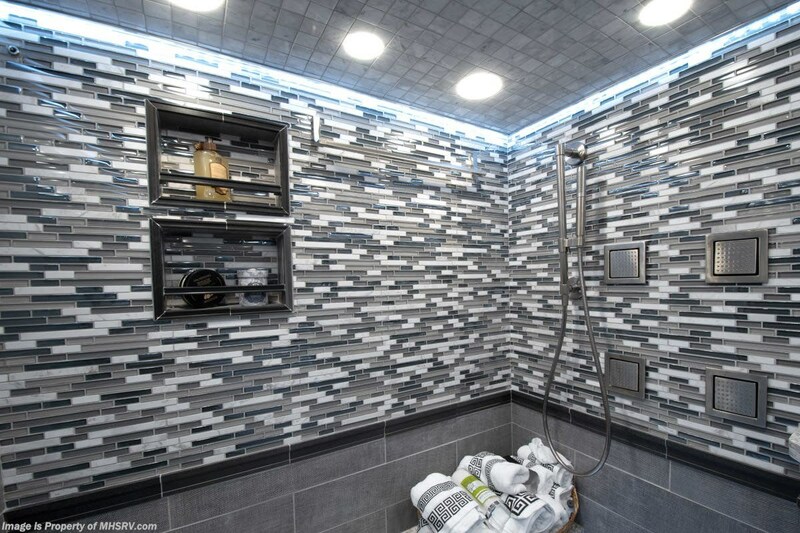 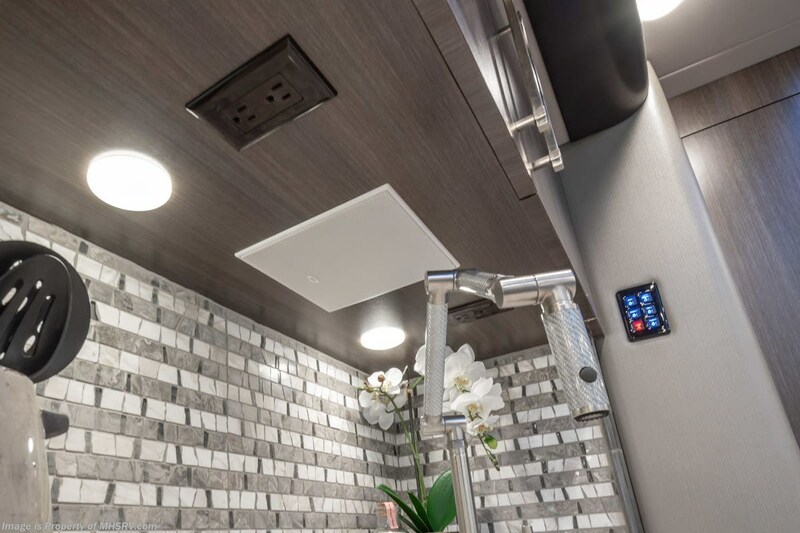 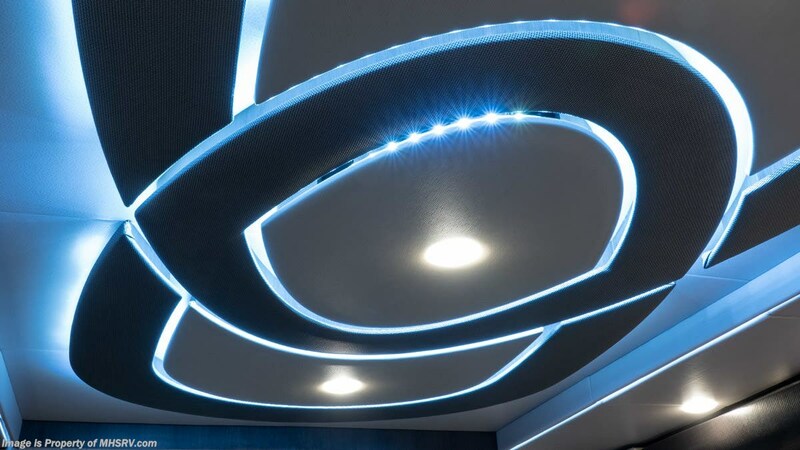 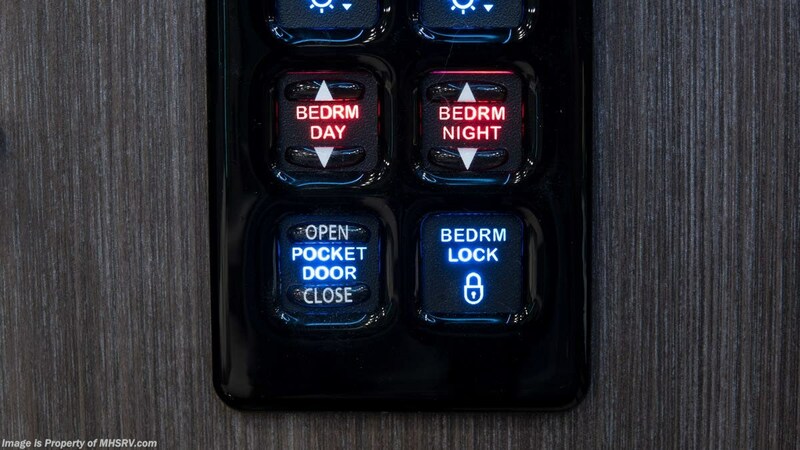 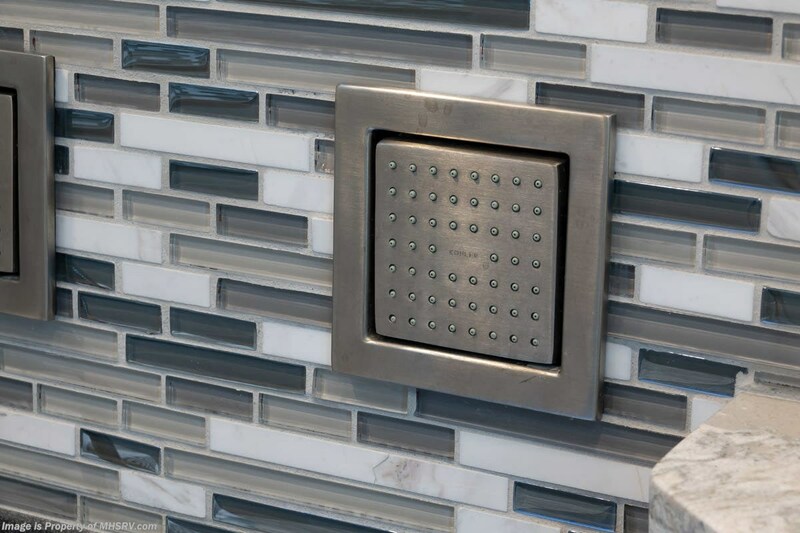 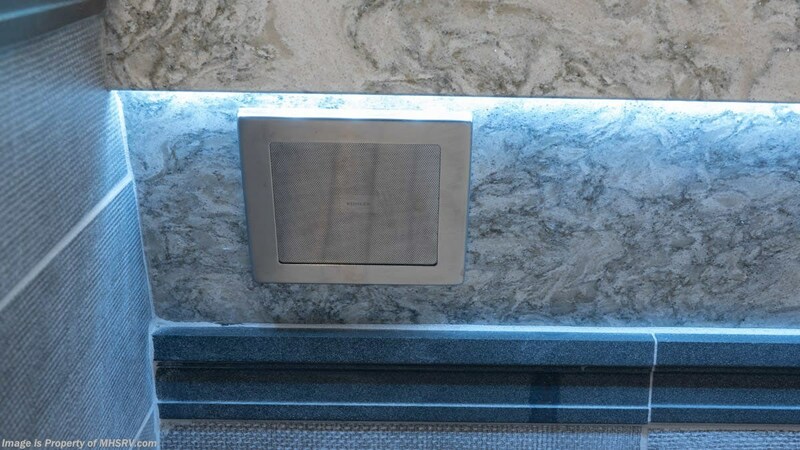 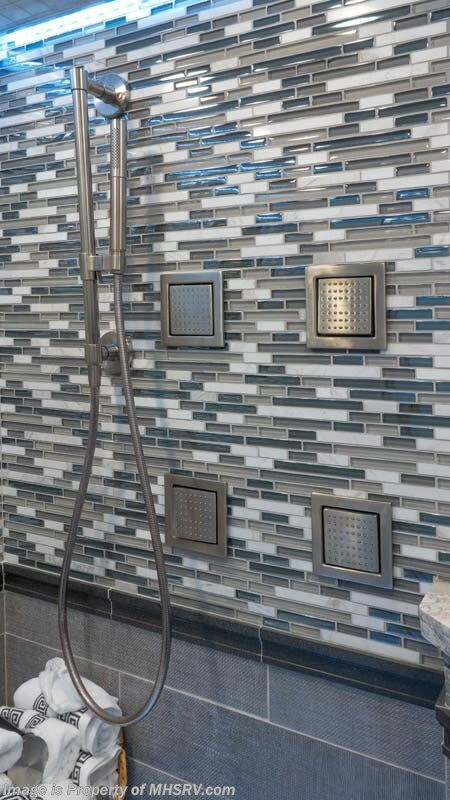 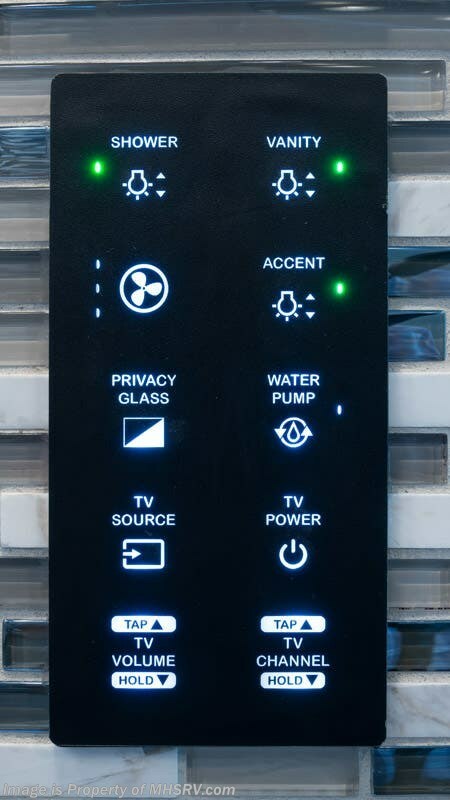 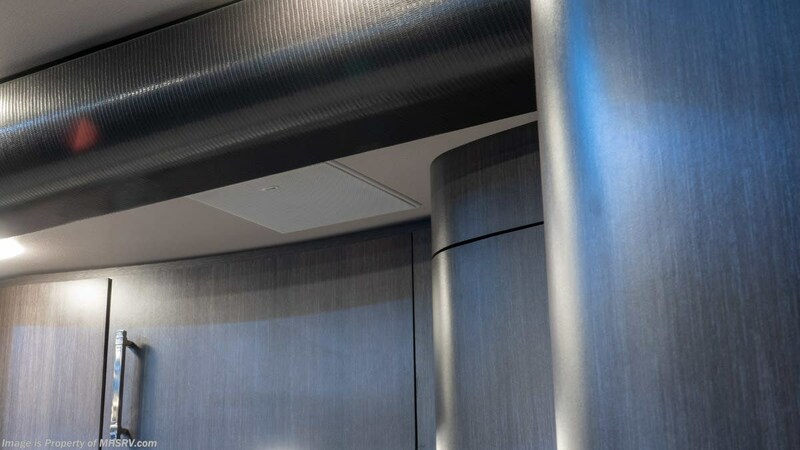 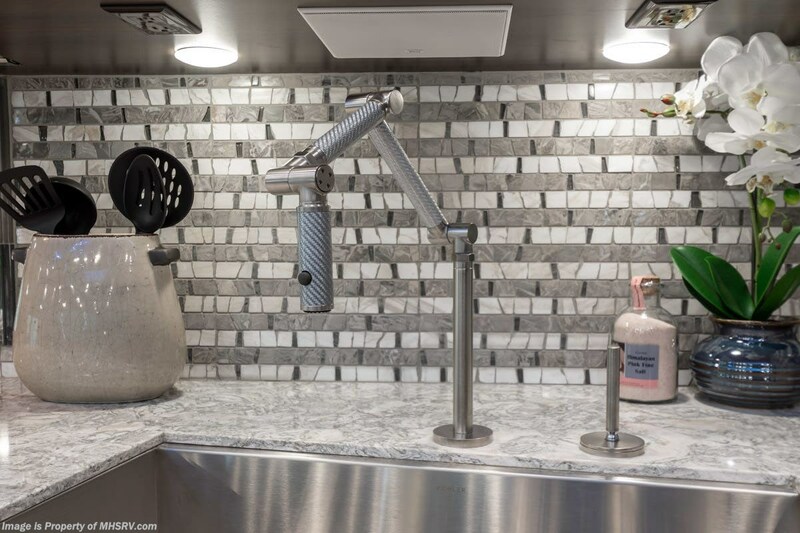 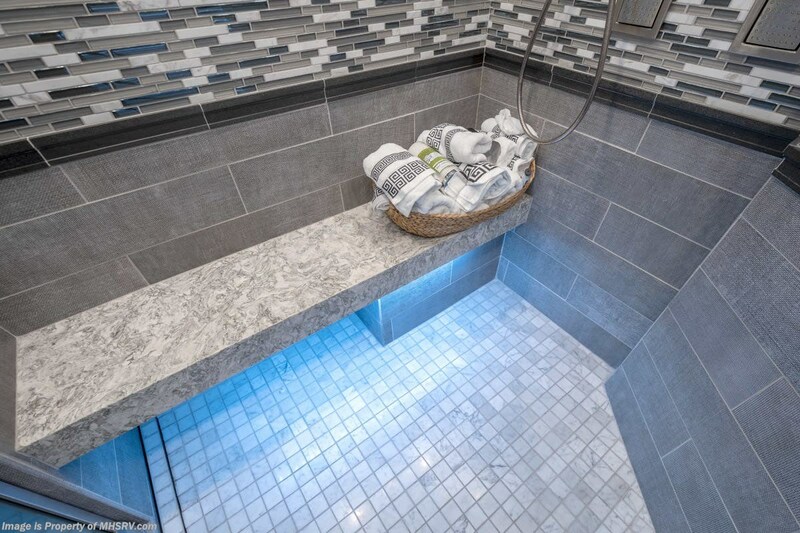 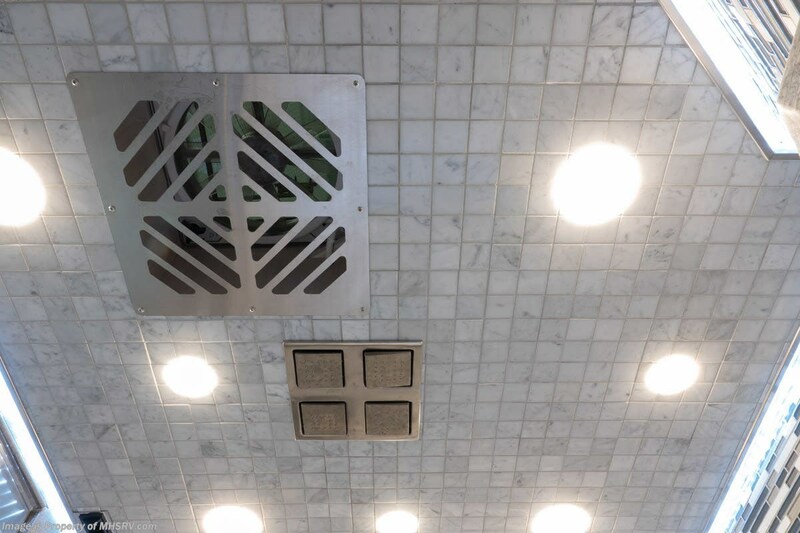 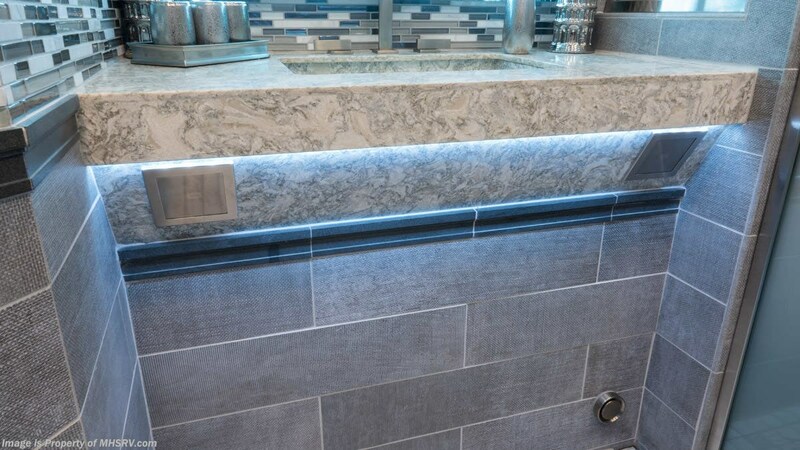 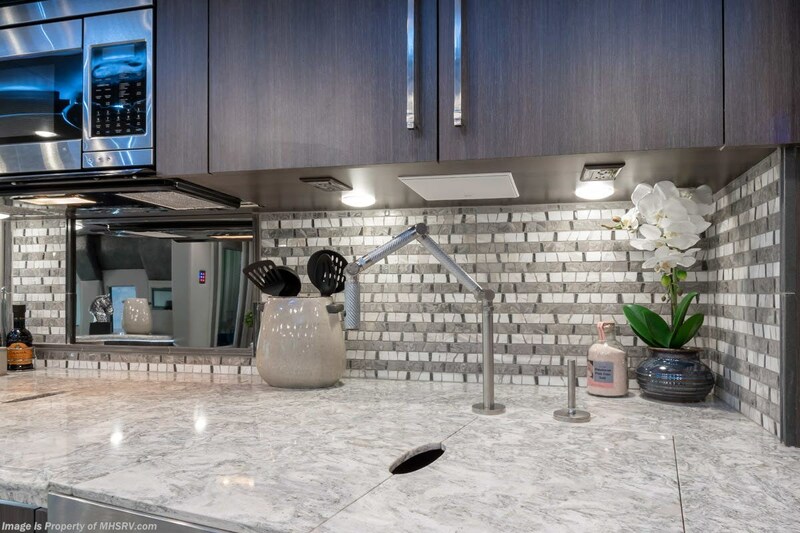 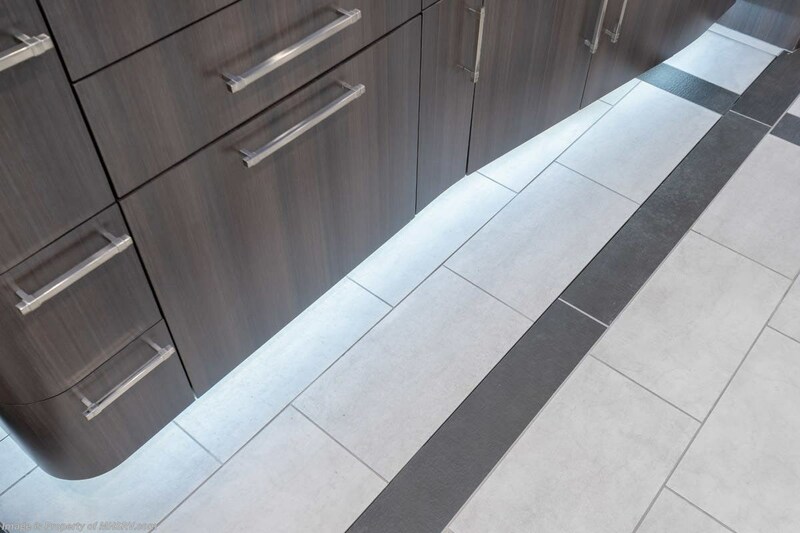 Control the pressure of the overhead Ambient Rain Shower, adjust the multiple Water Tile® body sprayers and you can even control the mood with multi-color LED lighting. 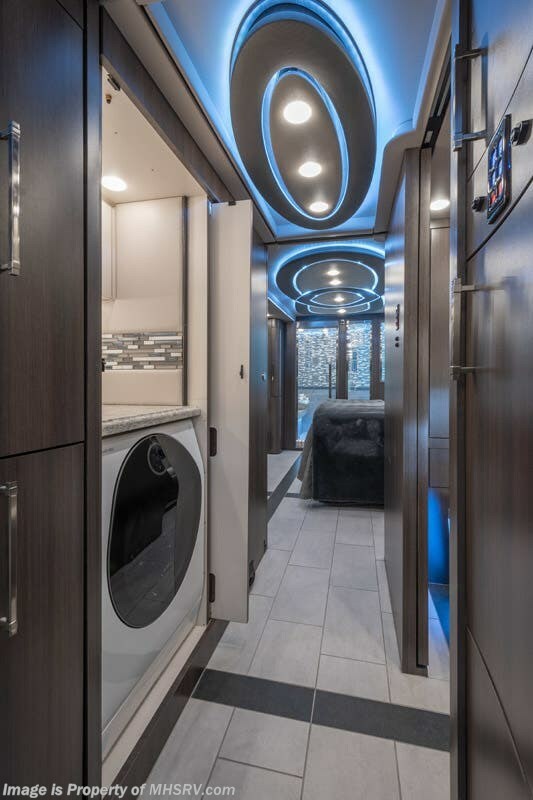 Should you rather take a steam the 45ESS leaves you wanting for nothing. 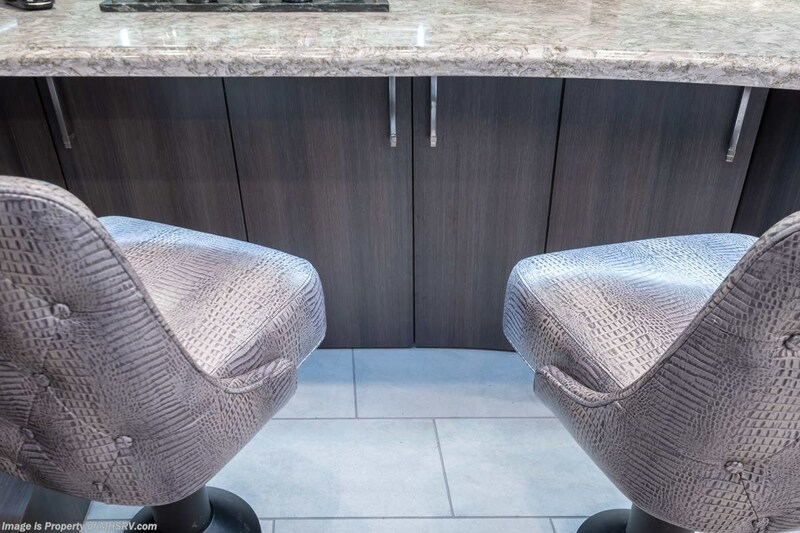 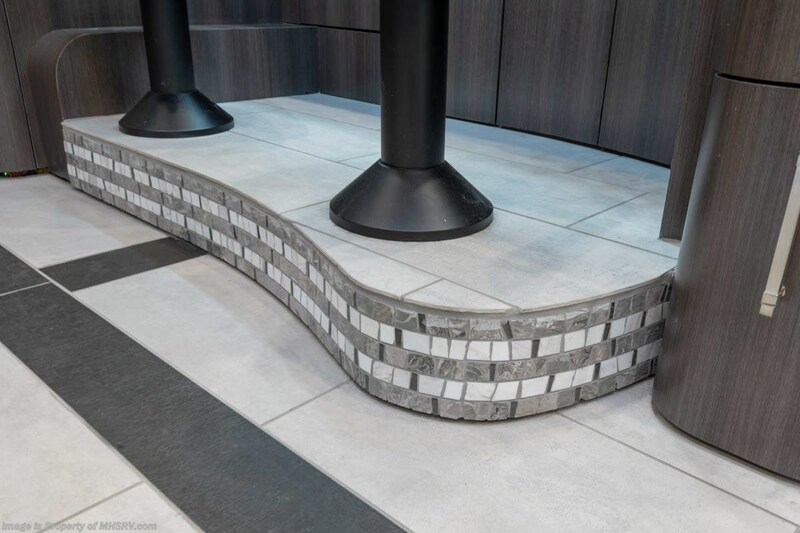 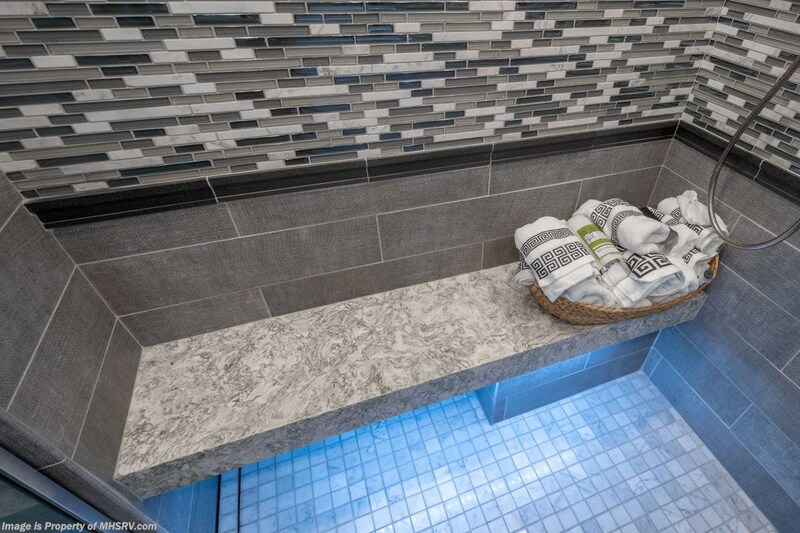 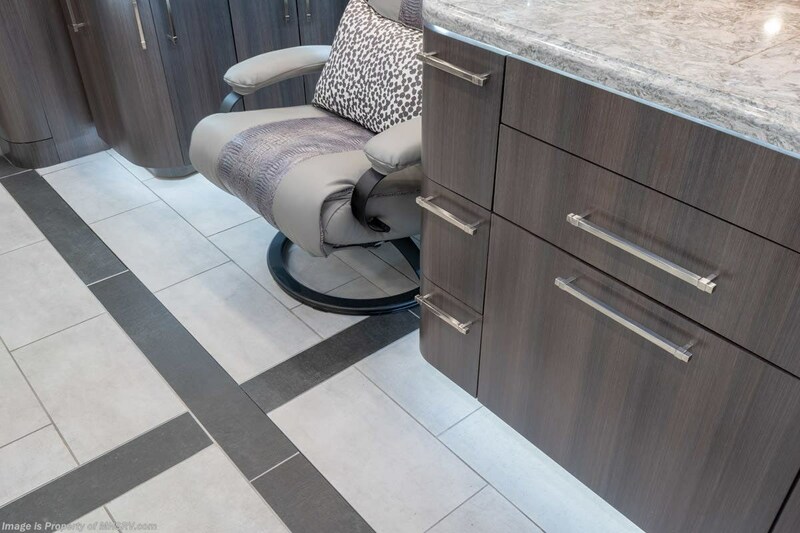 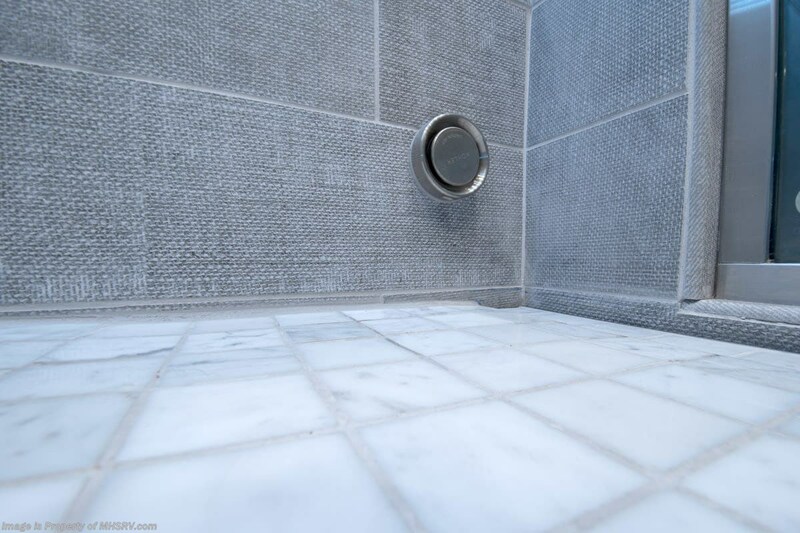 The room features a full length tile bench so you can sit down, relax and turn on the Kohler Invigoration® 9kw steam generator. 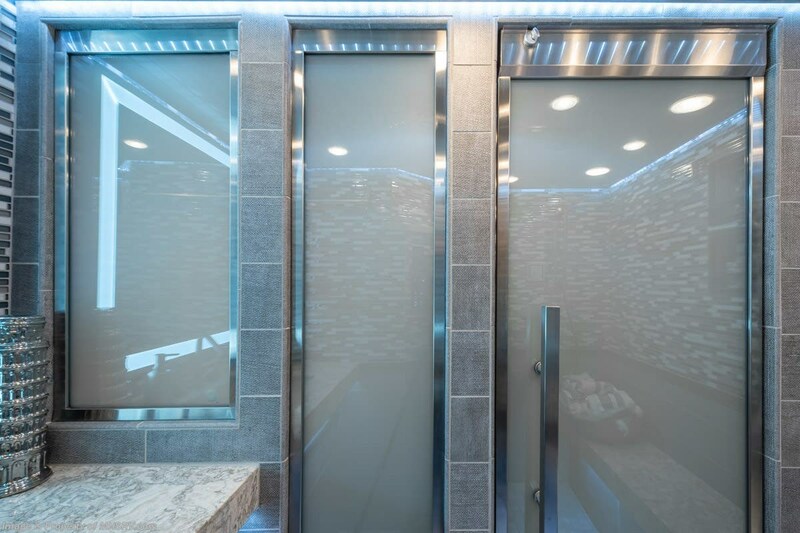 When done you can turn on the high velocity roof fan to empty the sauna room of steam and heat and be ready to start your day invigorated! 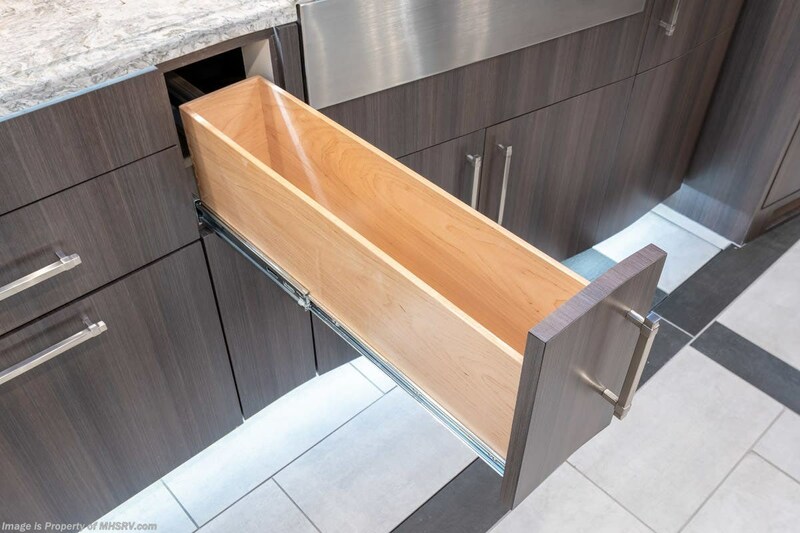 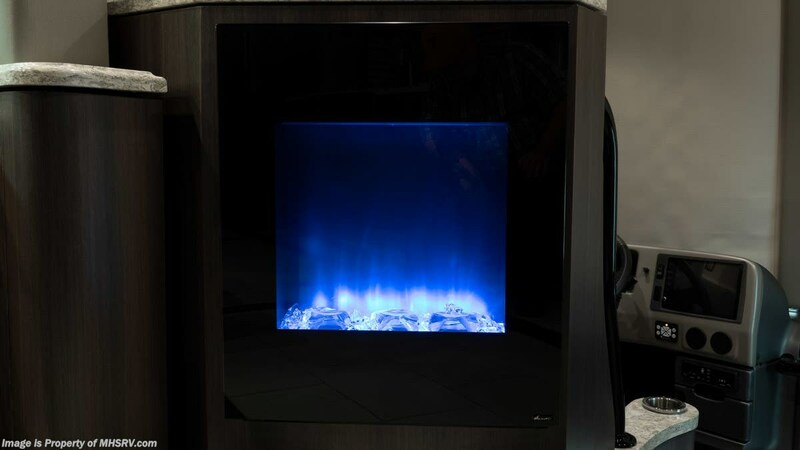 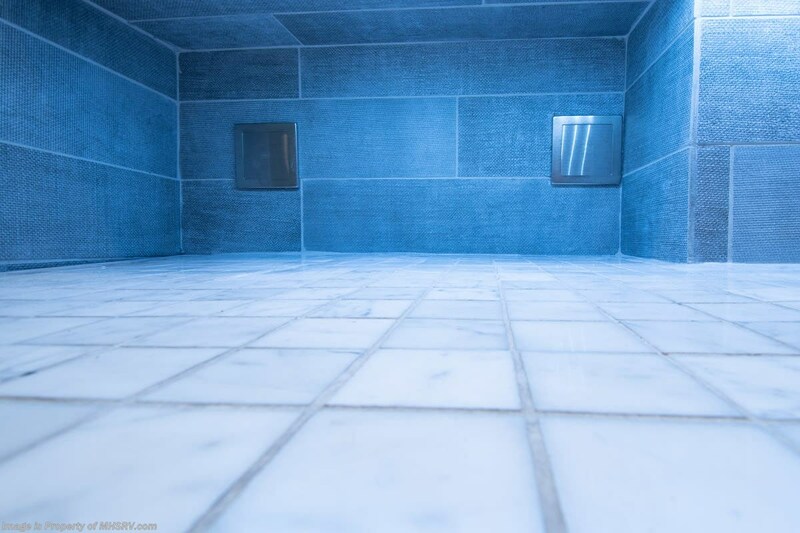 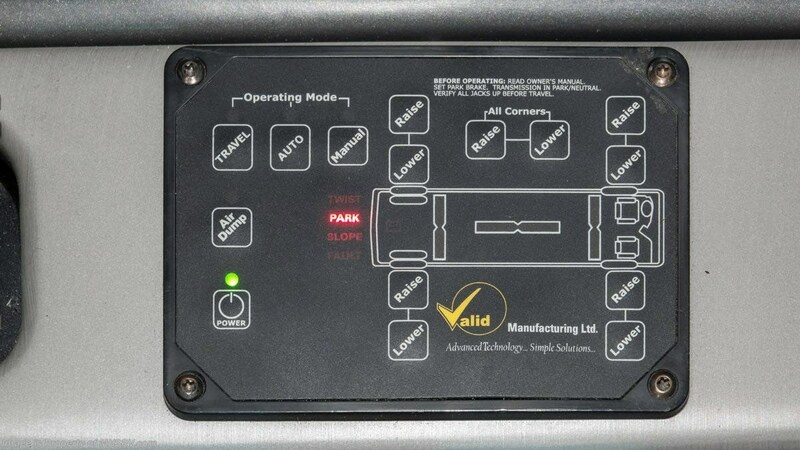 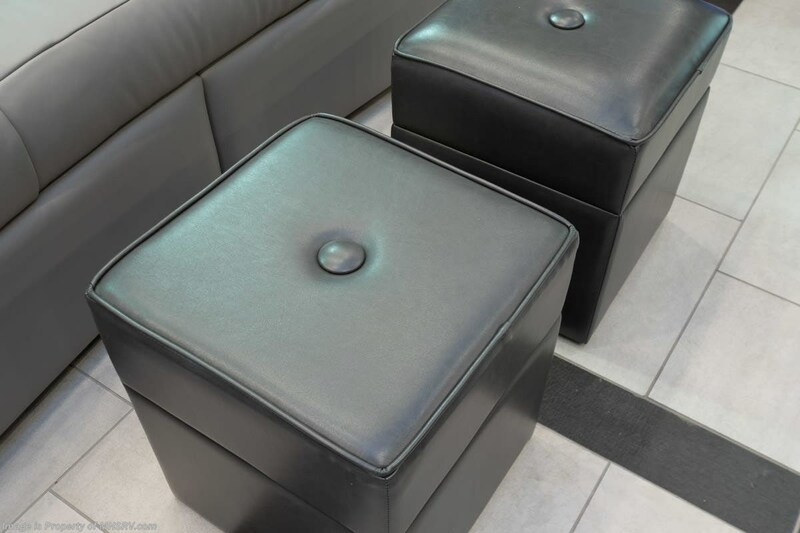 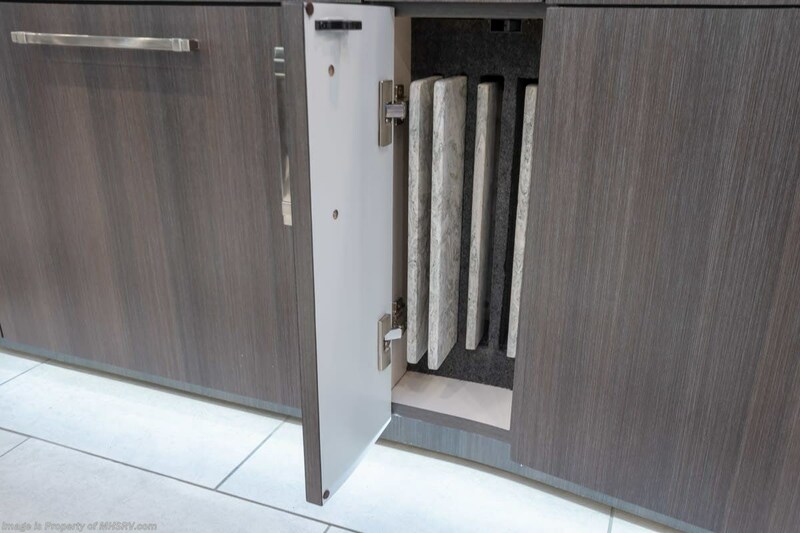 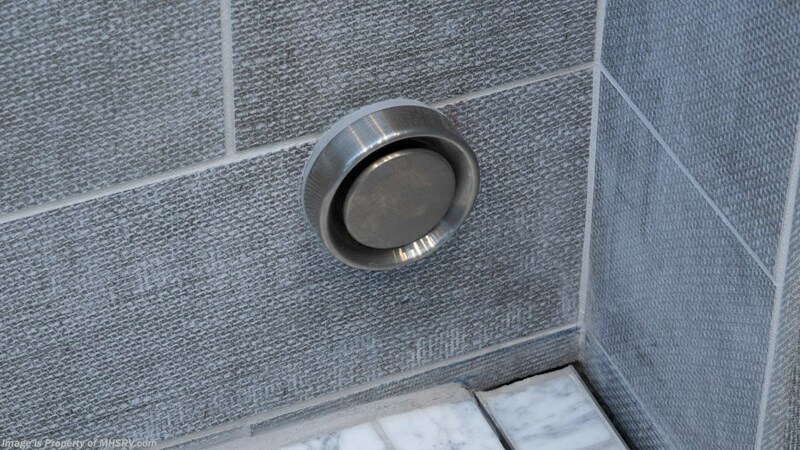 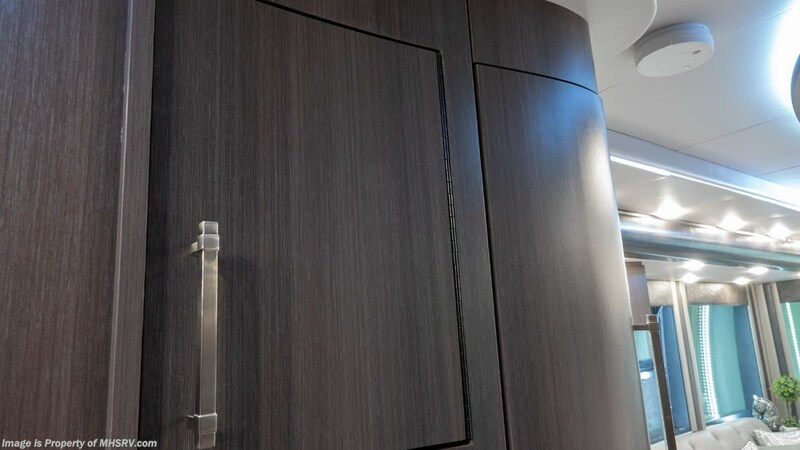 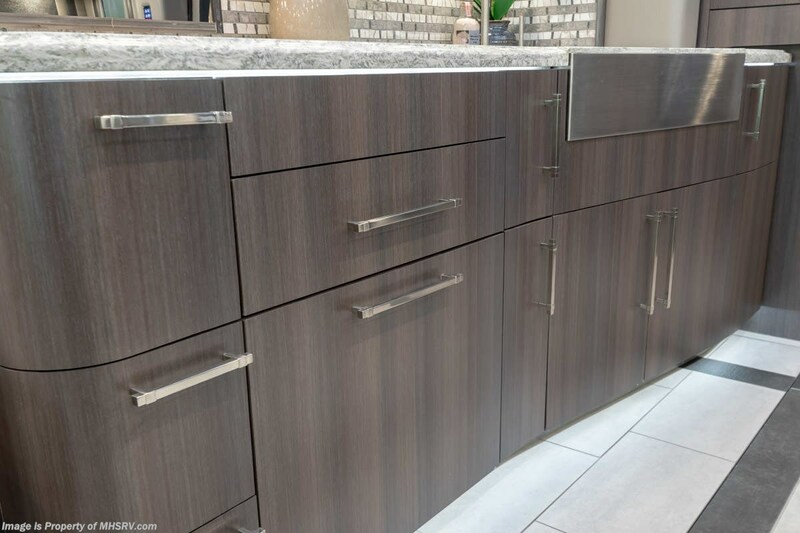 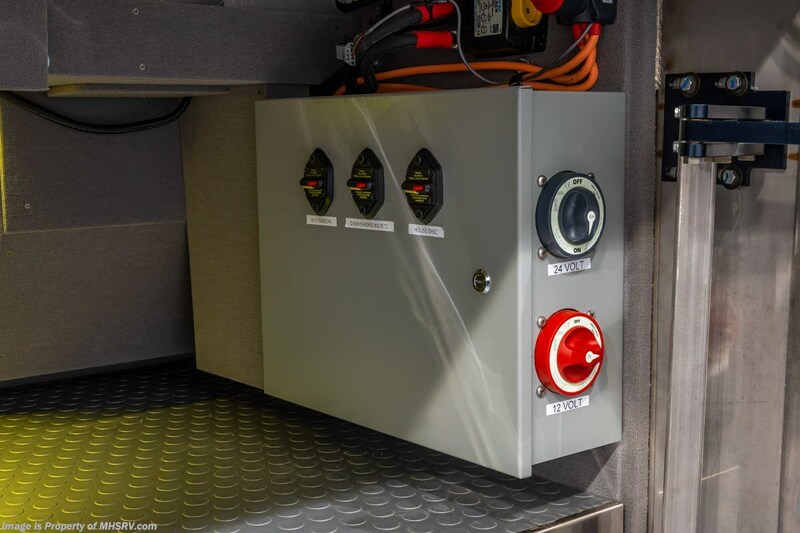 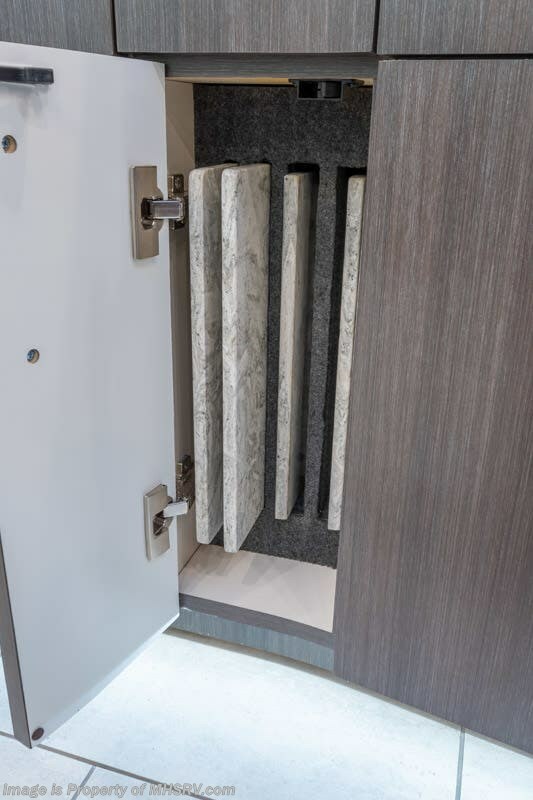 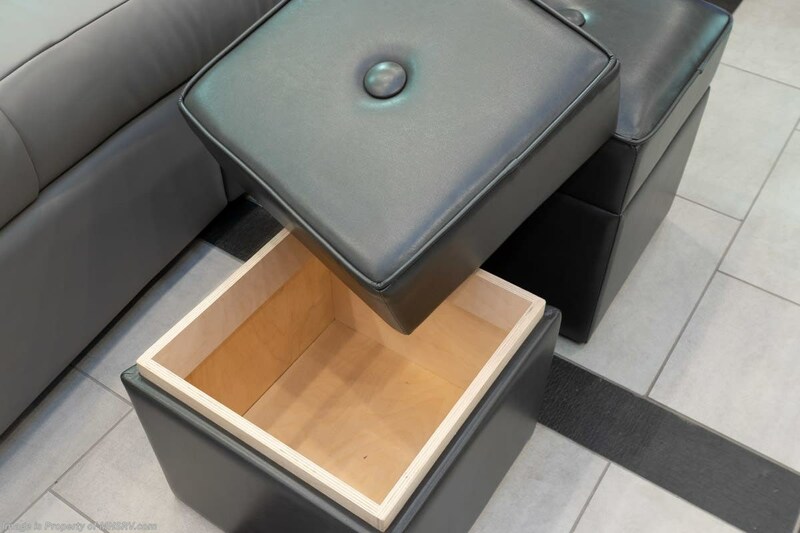 There is one other extraordinary component we added to ensure only the very best bath and sauna experience possible for an Emperor Sauna Suite owner. 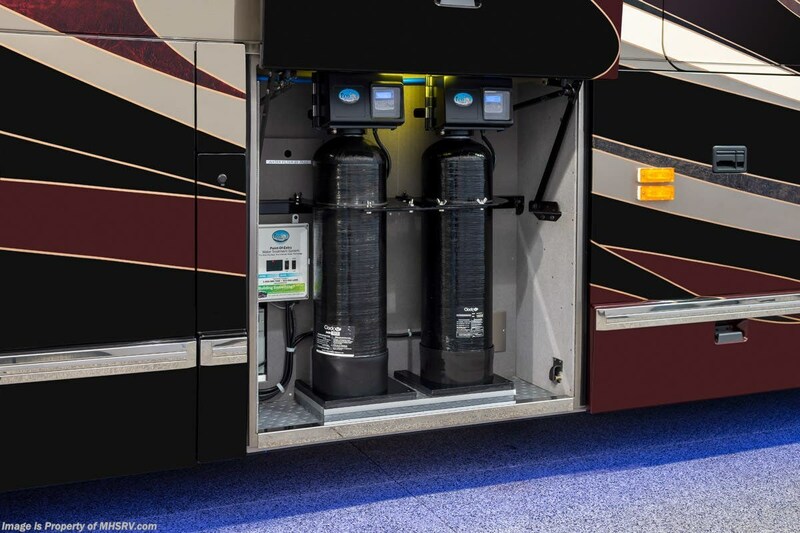 You will find dual 8" x 36" water filtration chamber tanks. 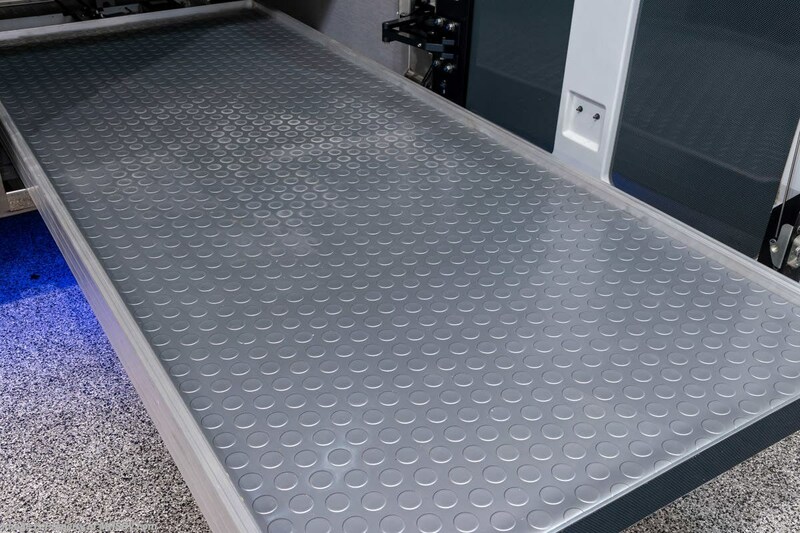 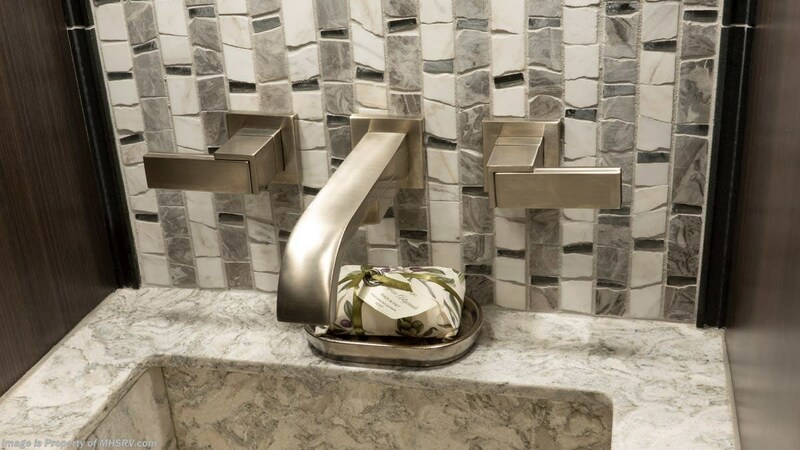 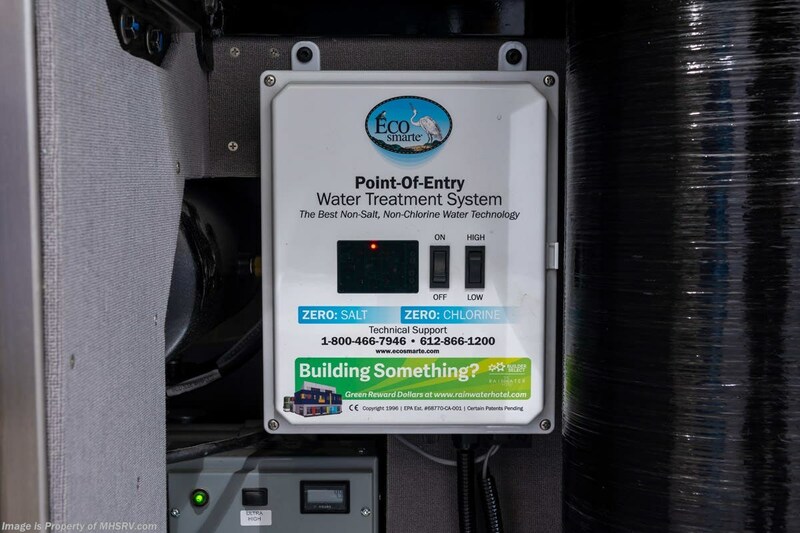 The ECOsmarte® system is the most advanced point-of-entry water treatment technology on the planet. 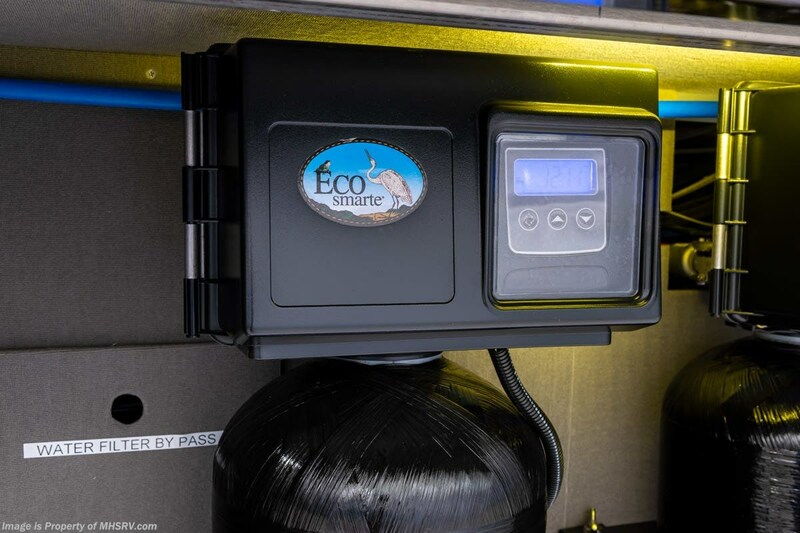 It creates premium water quality while still preserving the calcium and magnesium minerals that are vital to your health. 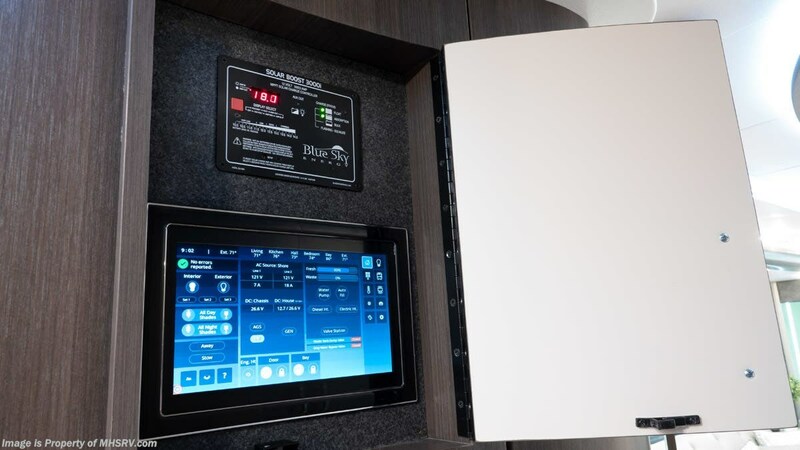 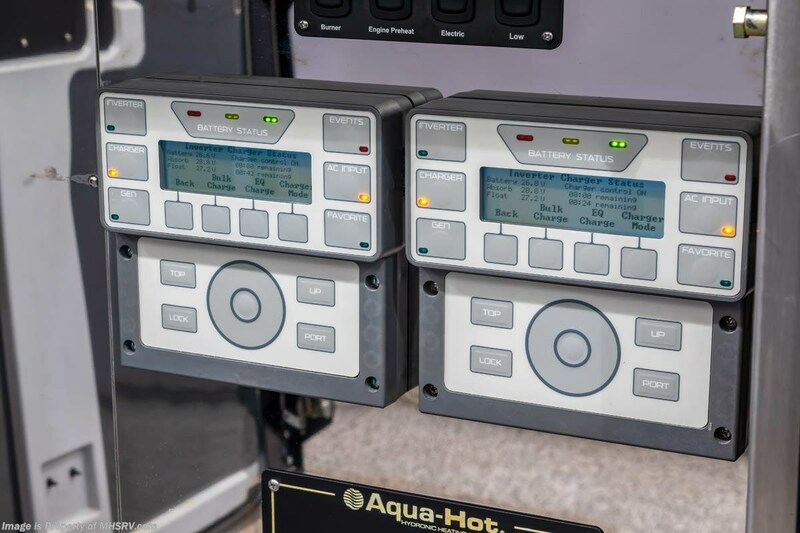 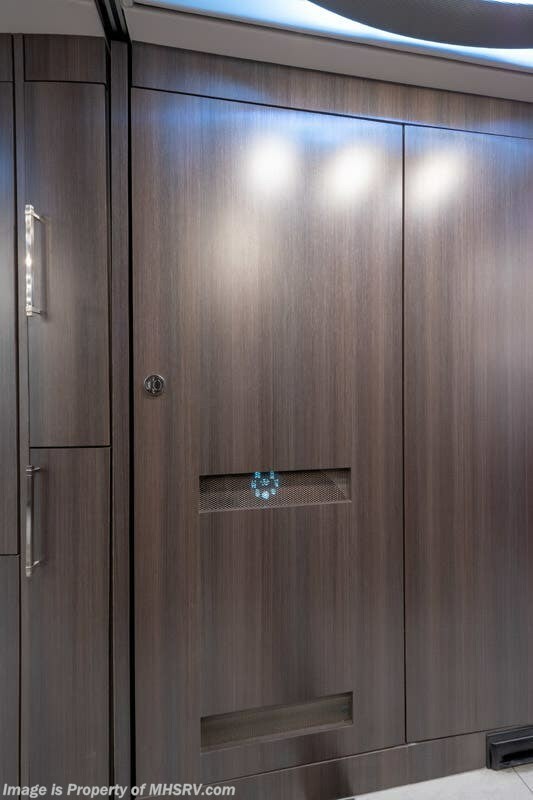 So regardless of where you are or what water is made available to you the ECOsmarte® system will ensure an exceptional quality of steam and water throughout the 45' Emperor Sauna Suite. 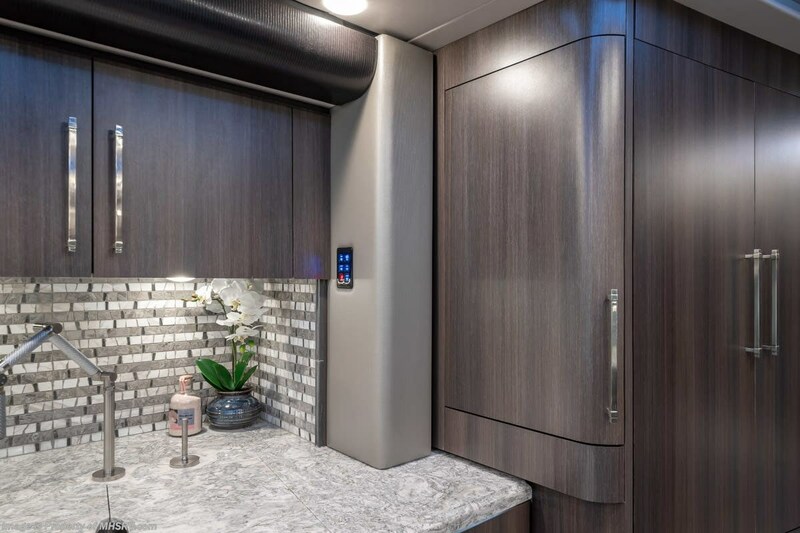 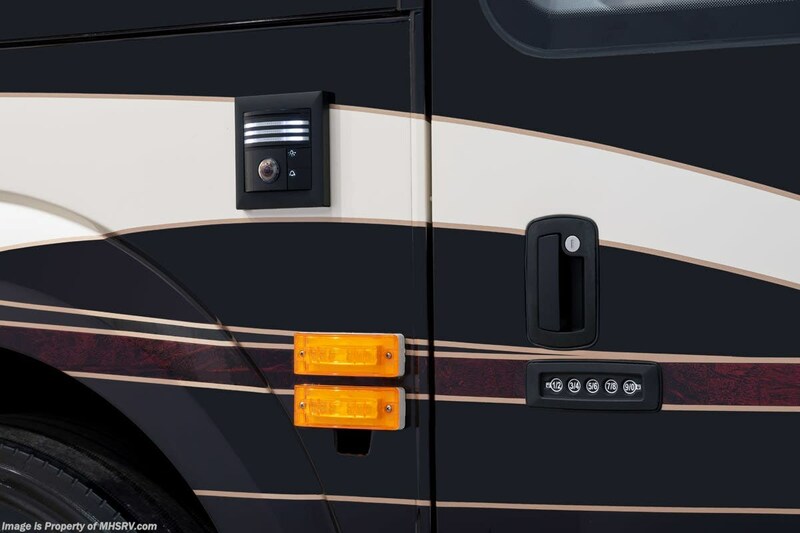 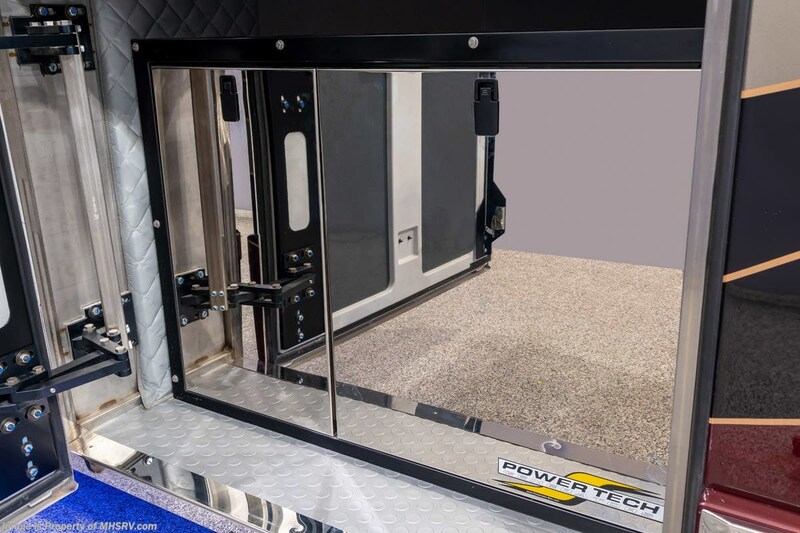 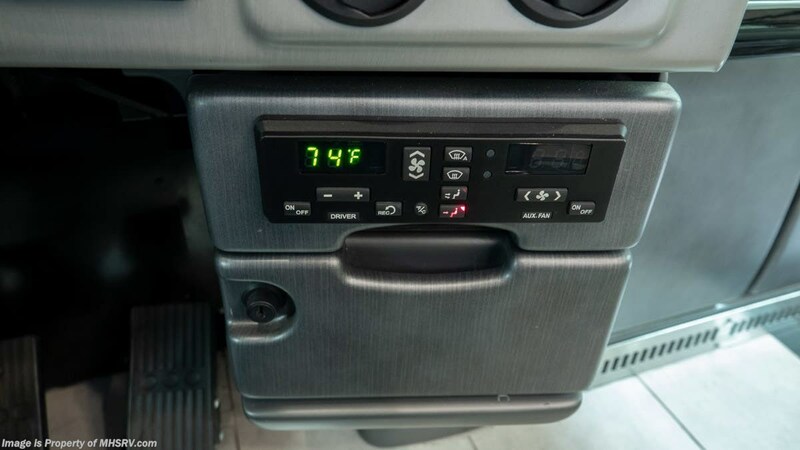 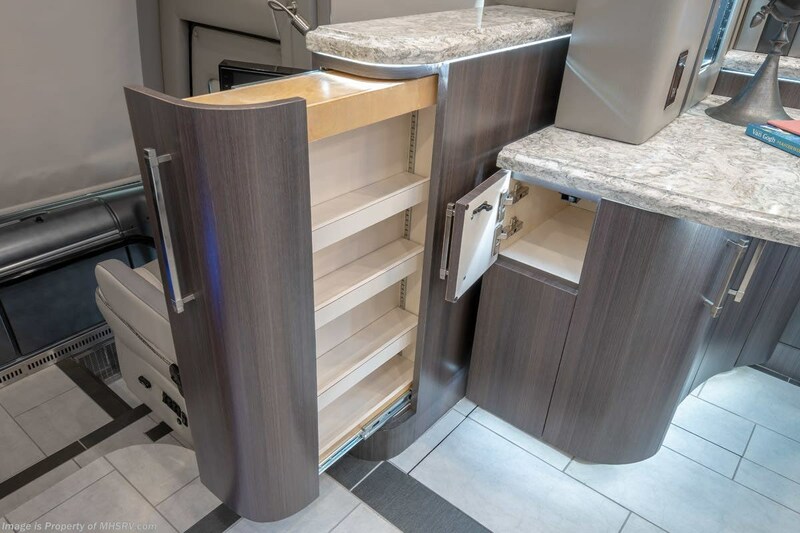 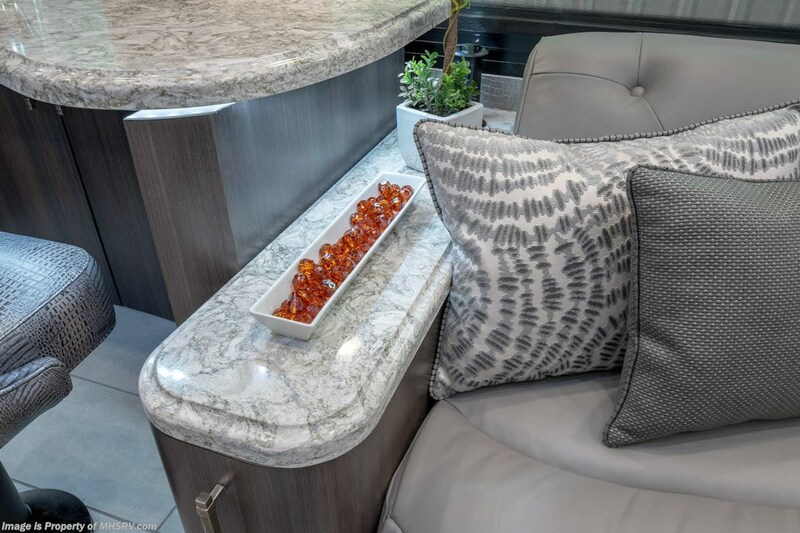 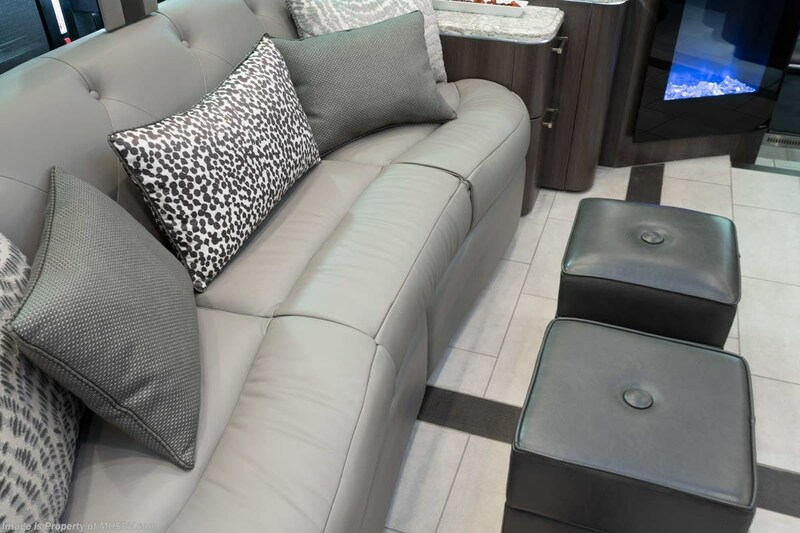 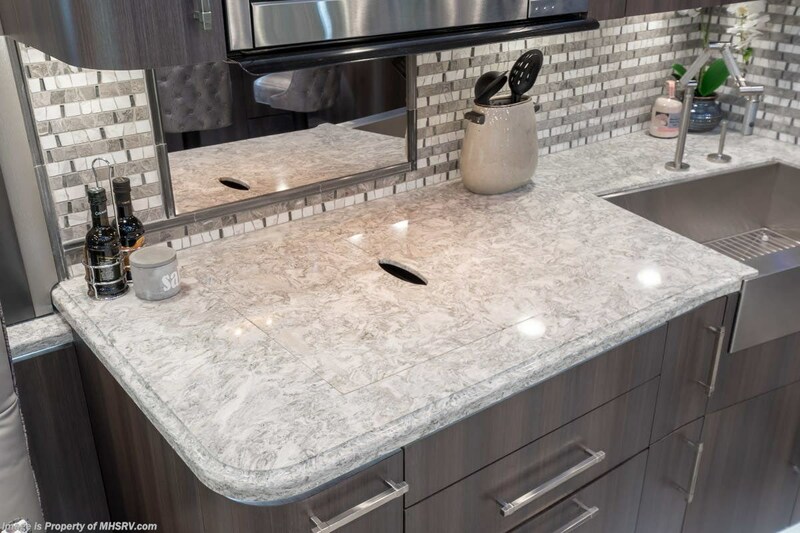 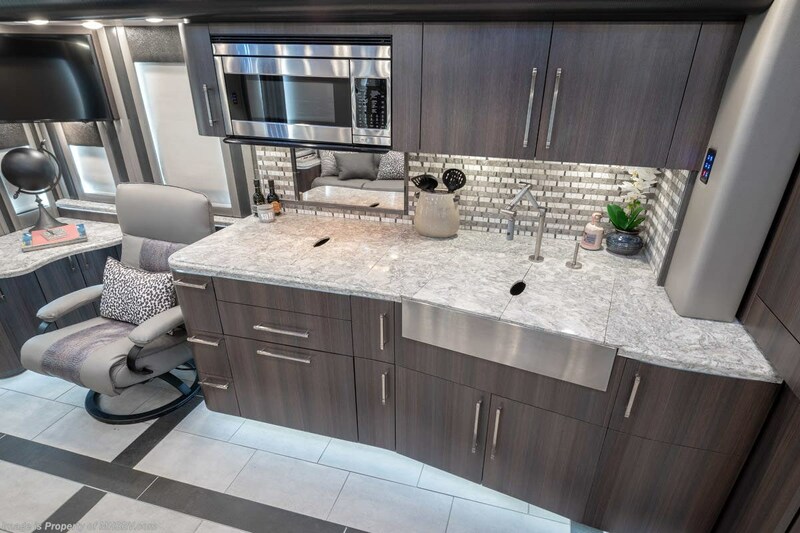 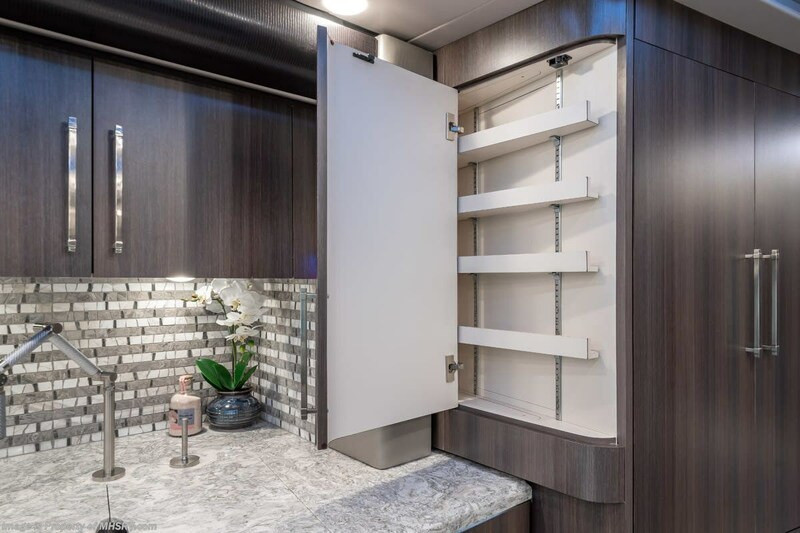 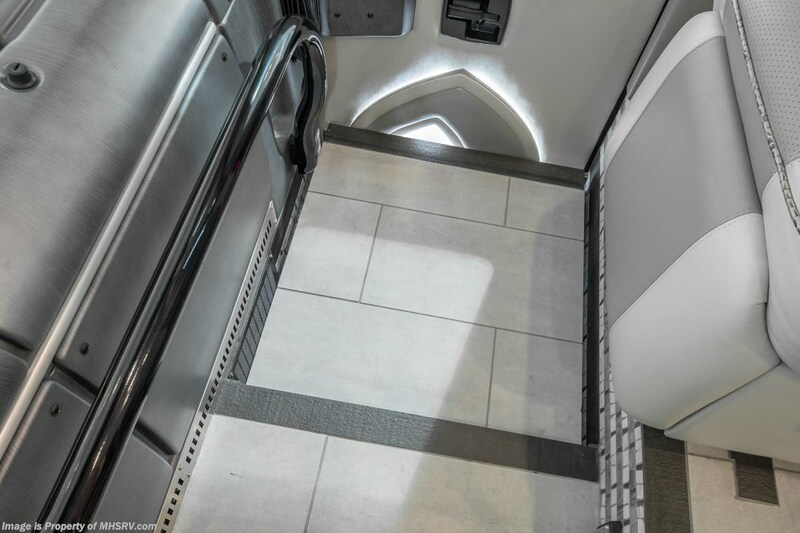 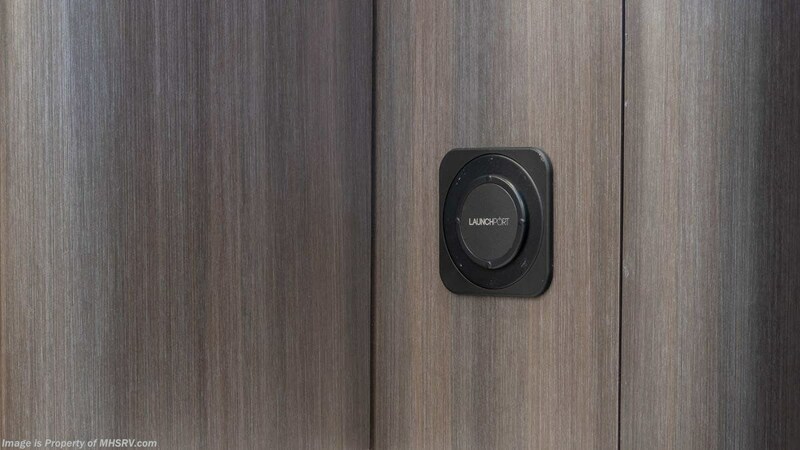 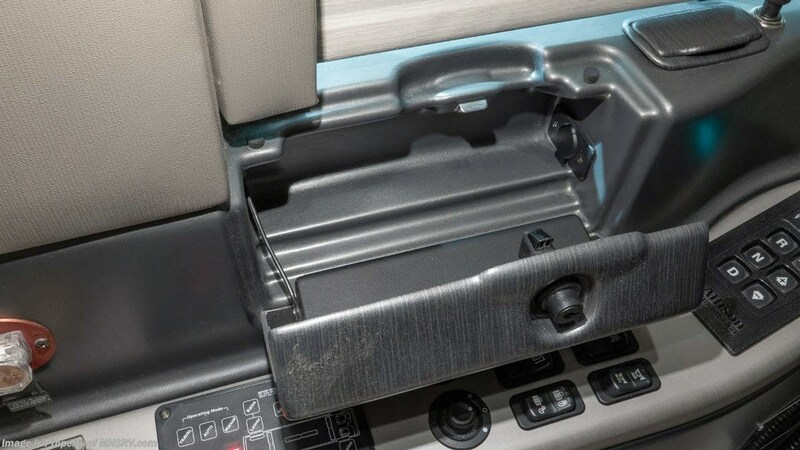 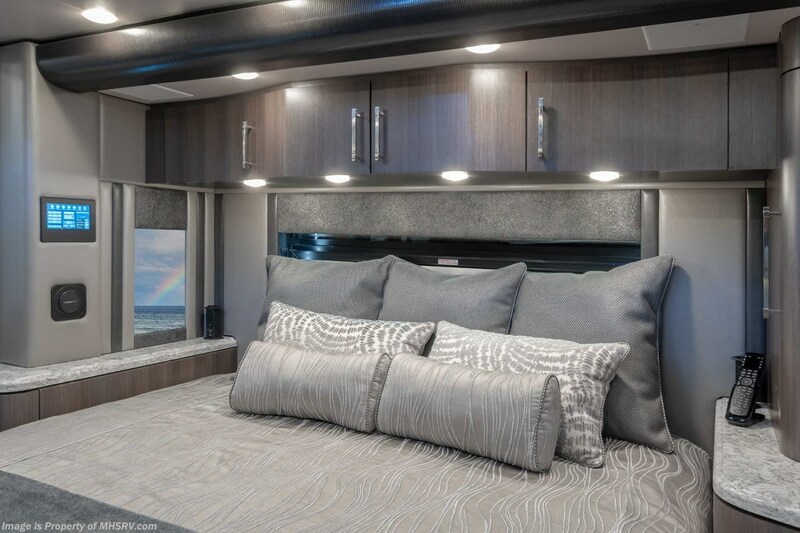 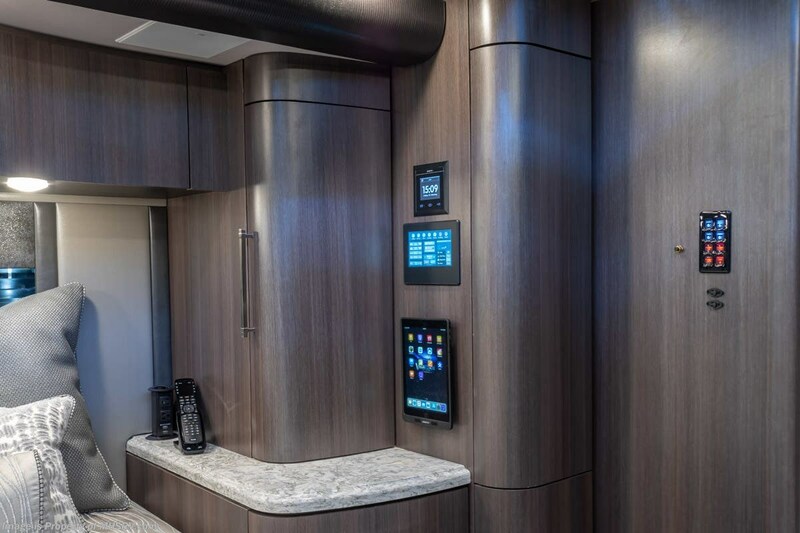 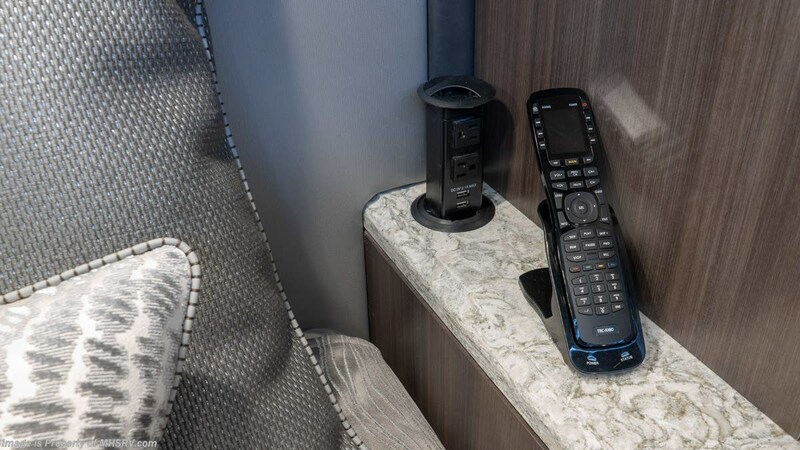 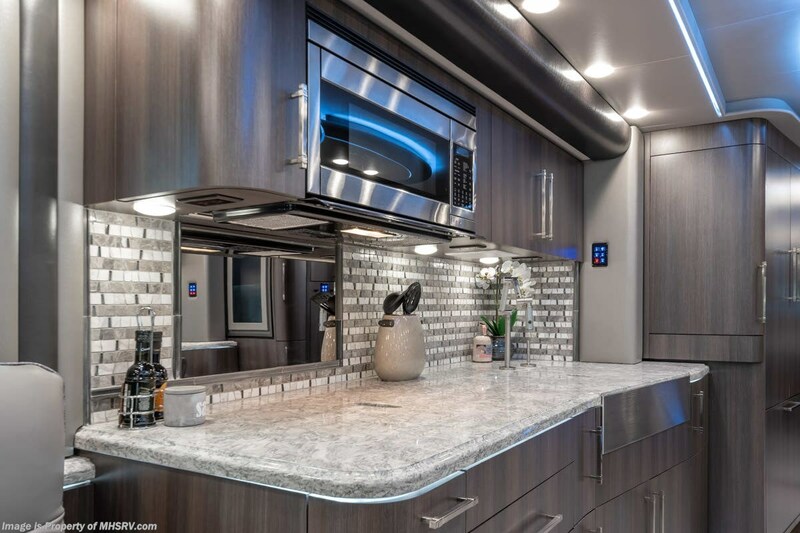 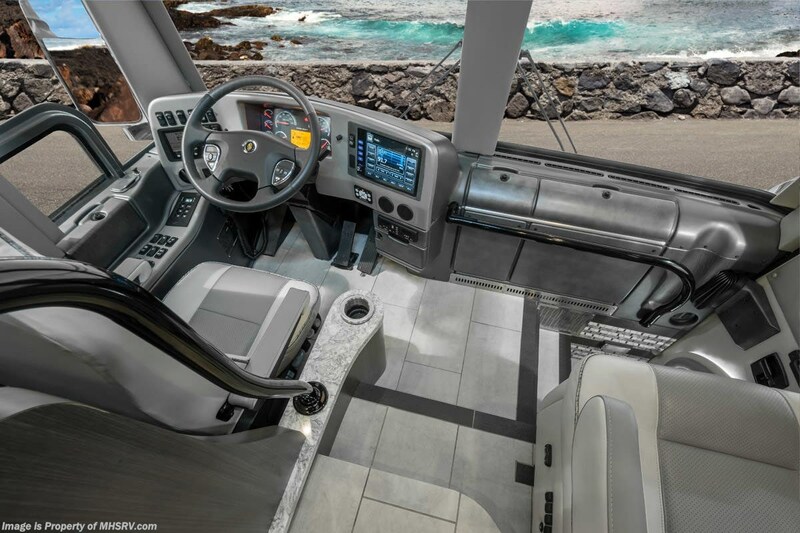 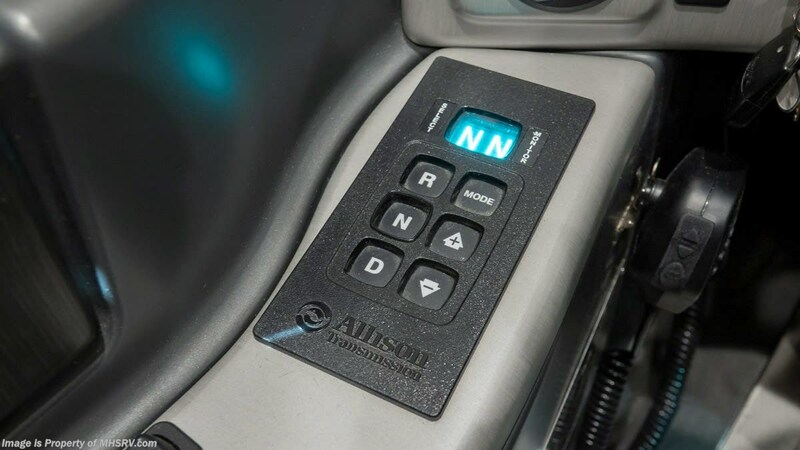 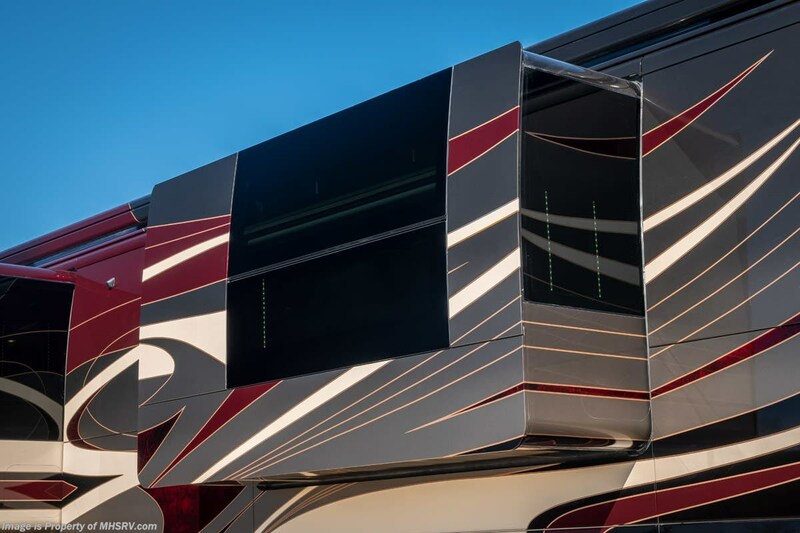 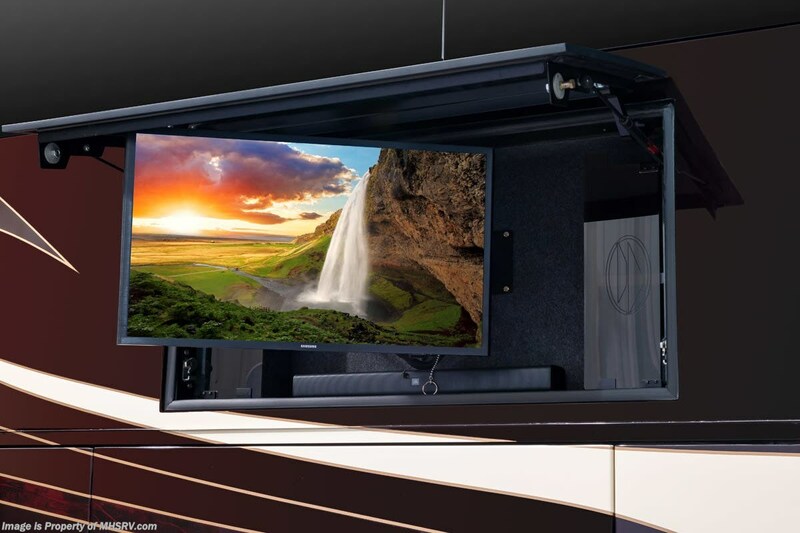 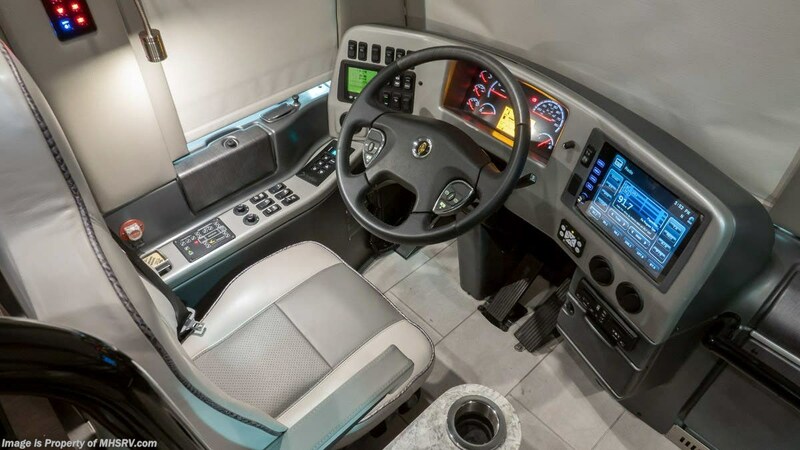 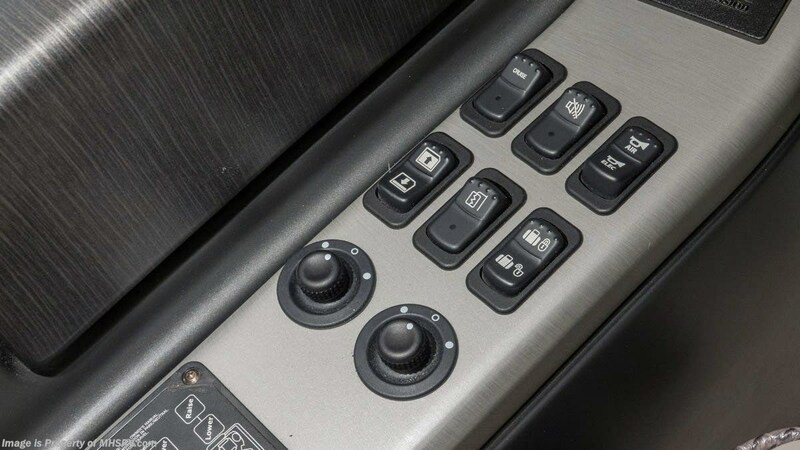 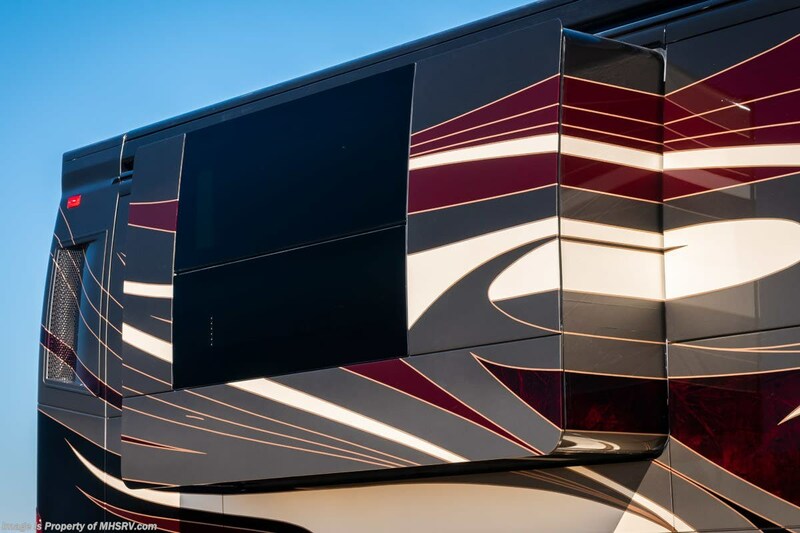 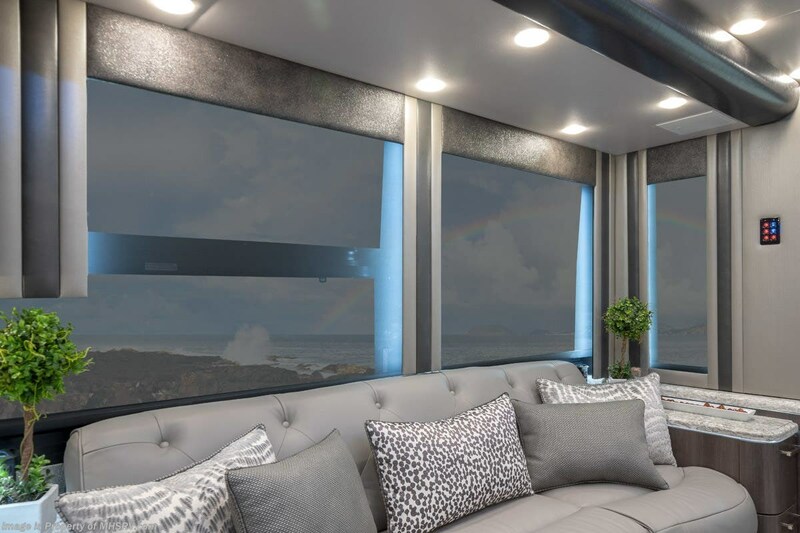 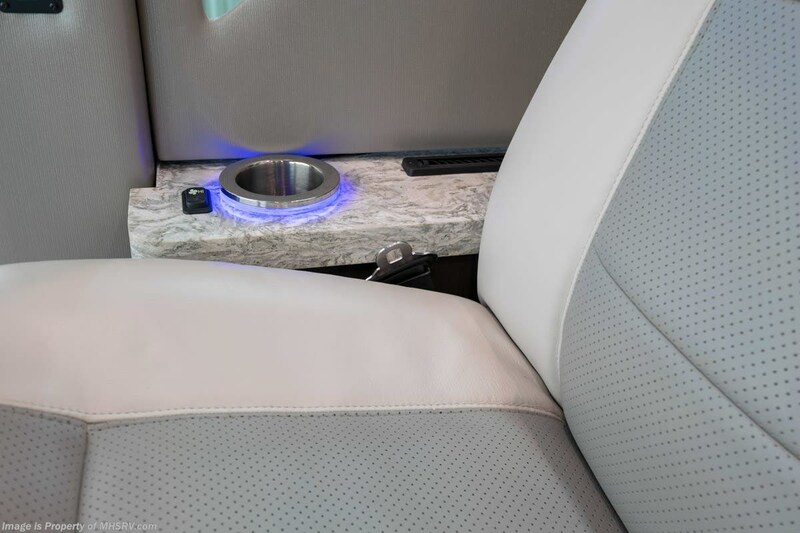 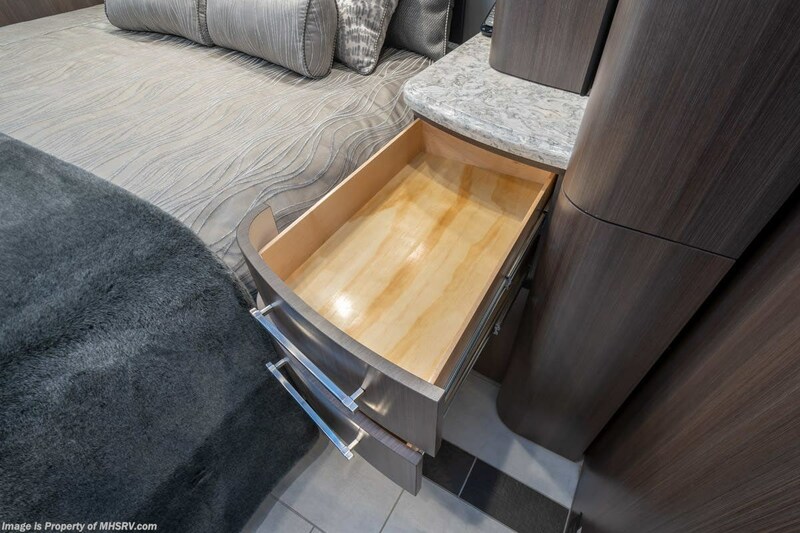 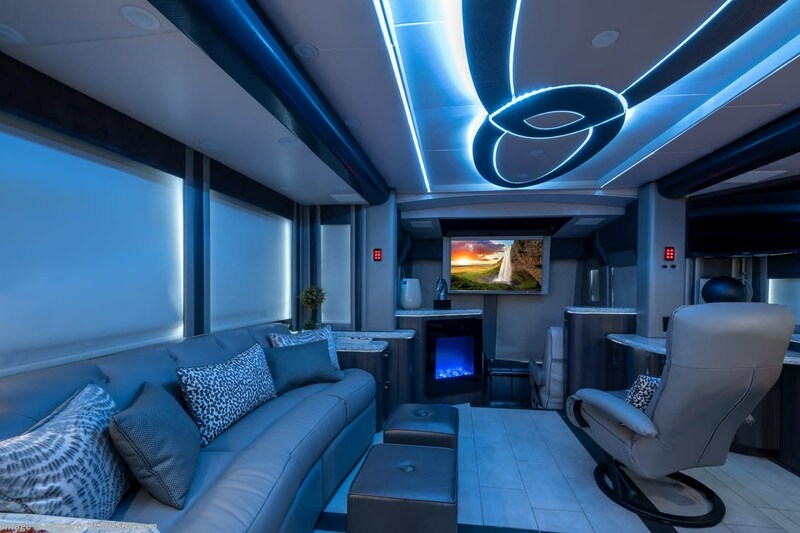 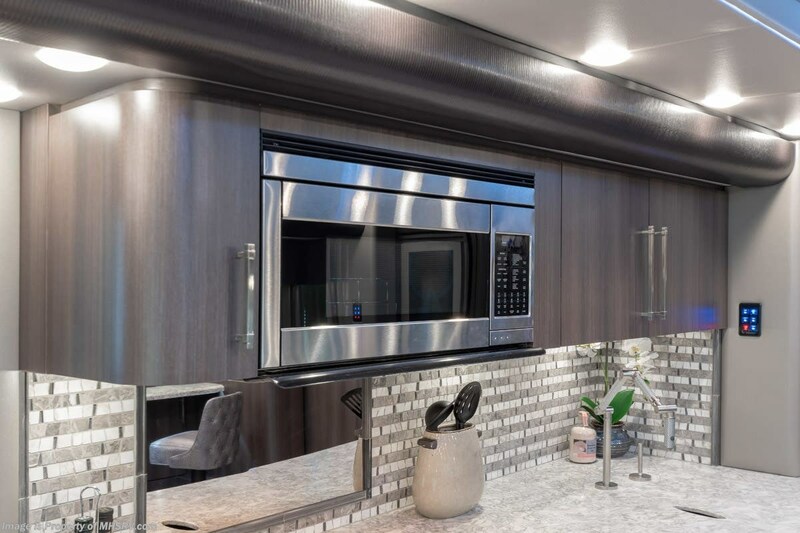 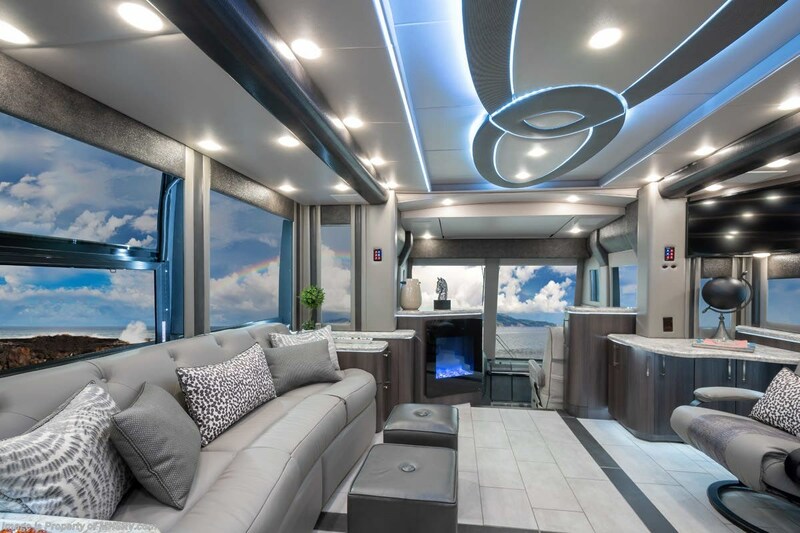 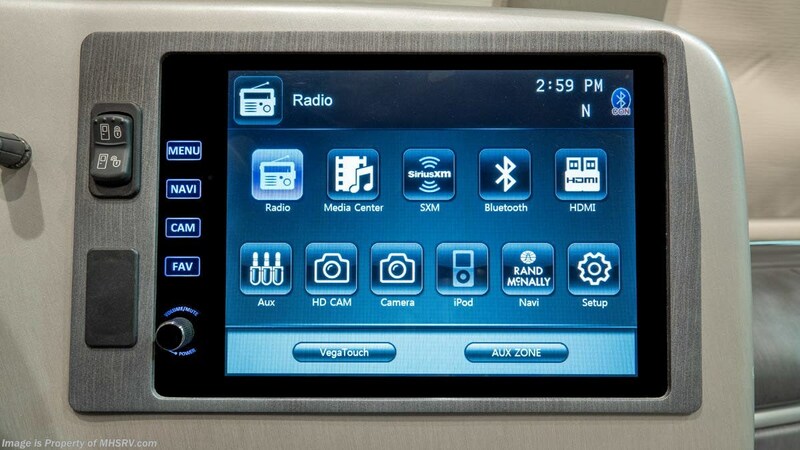 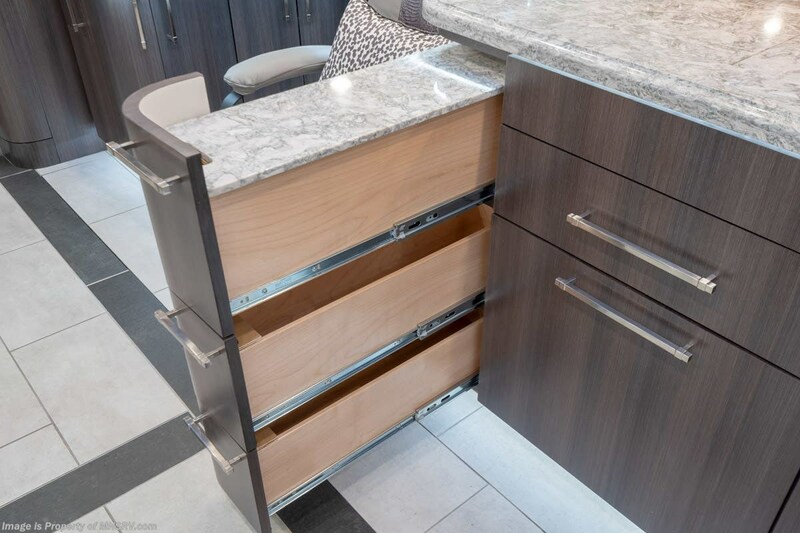 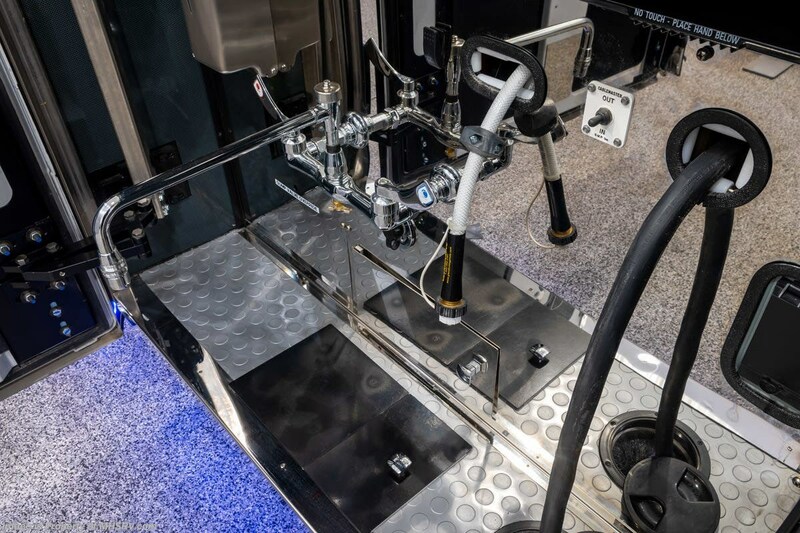 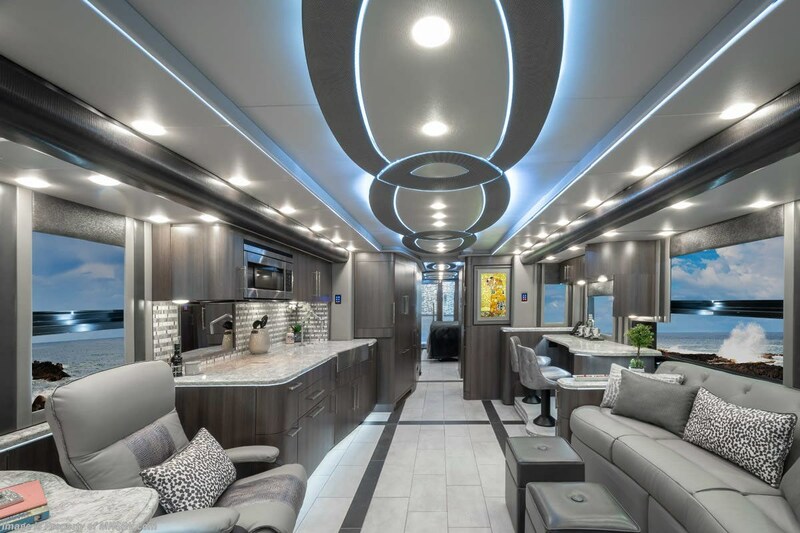 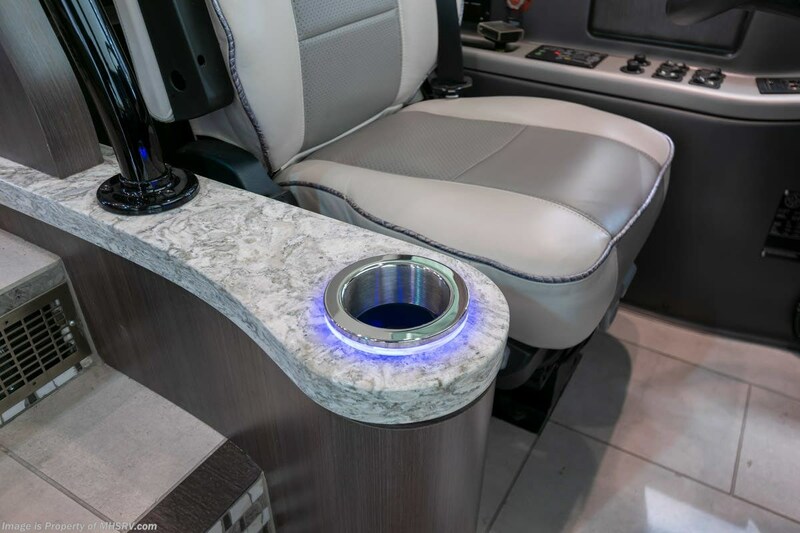 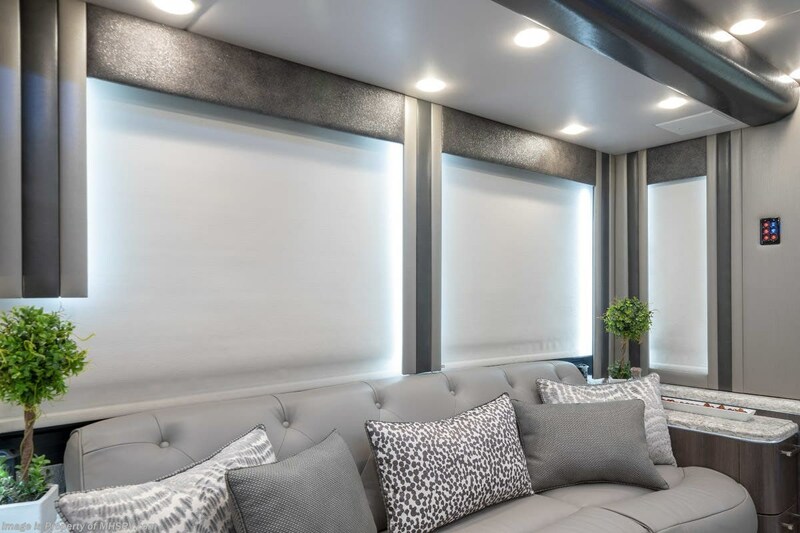 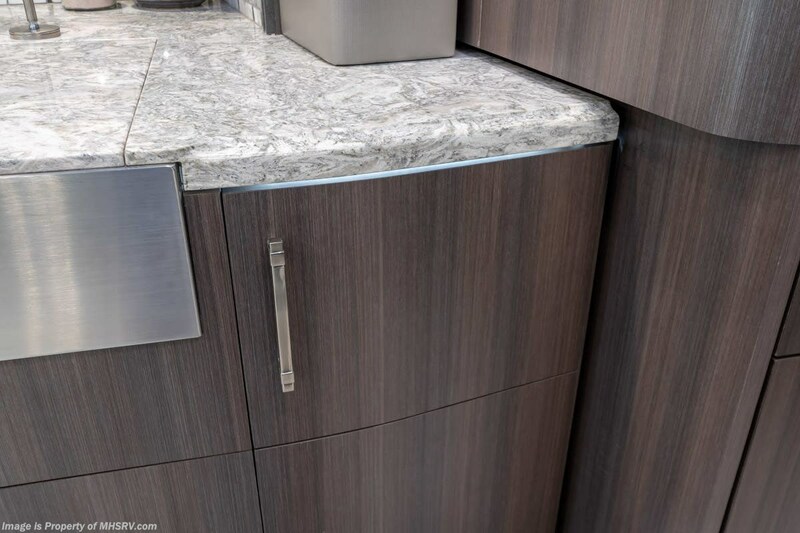 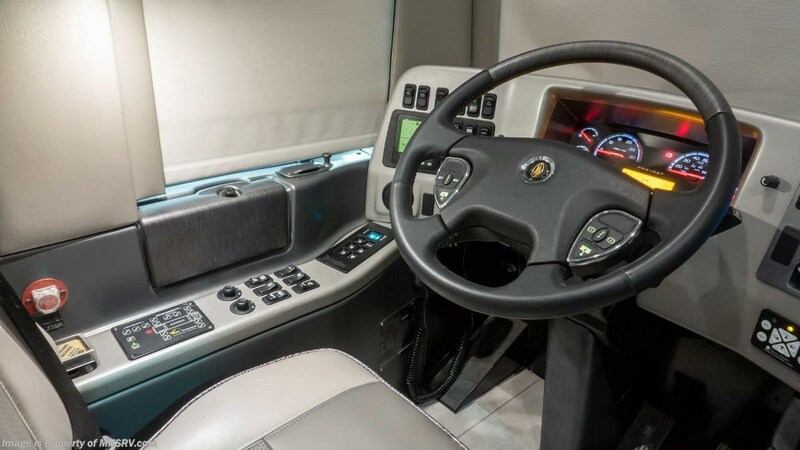 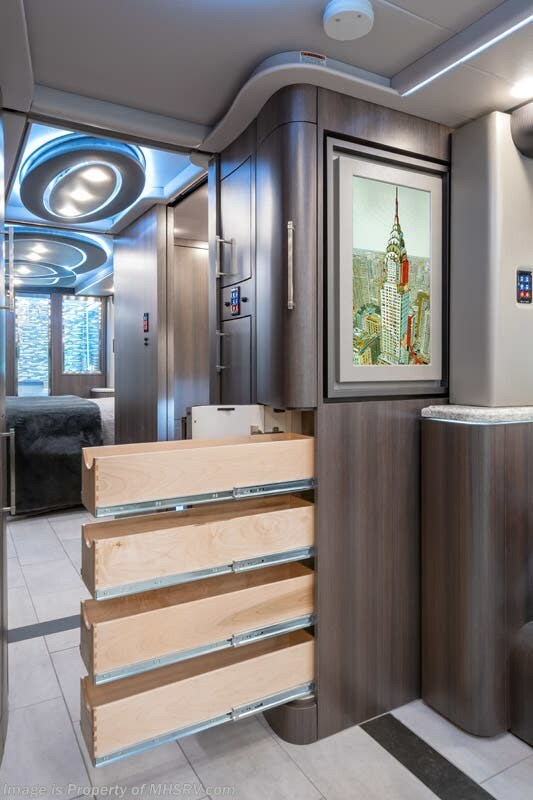 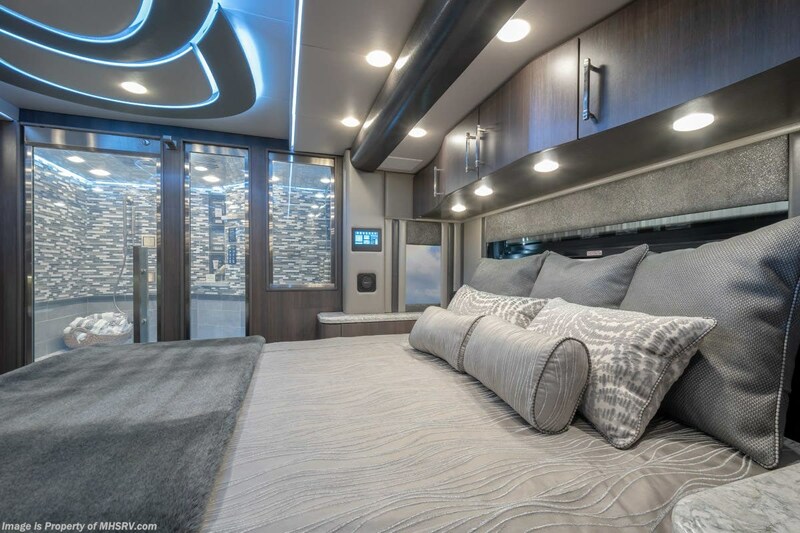 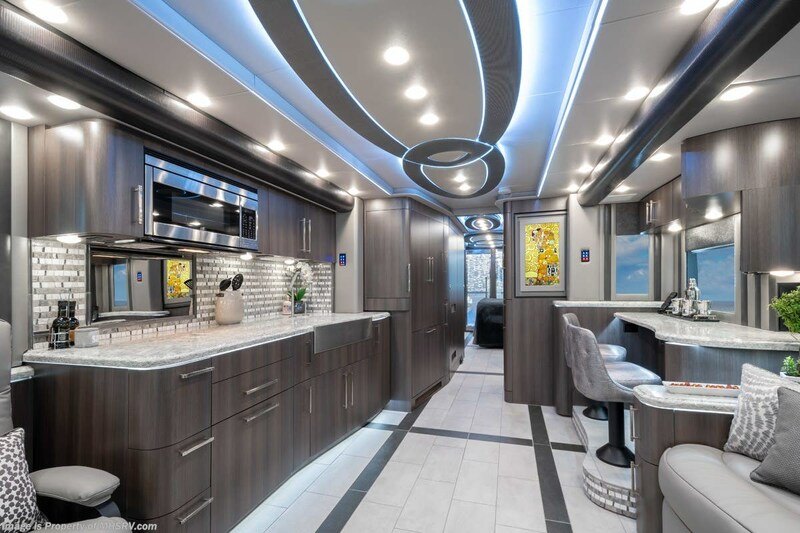 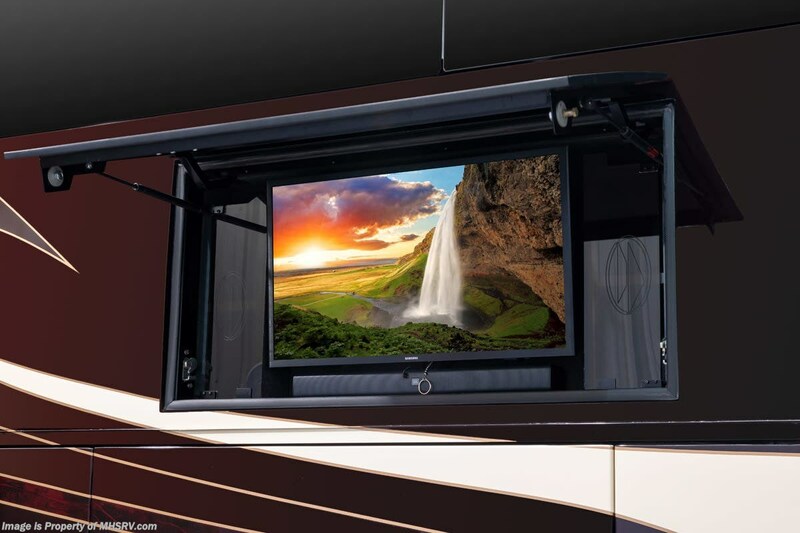 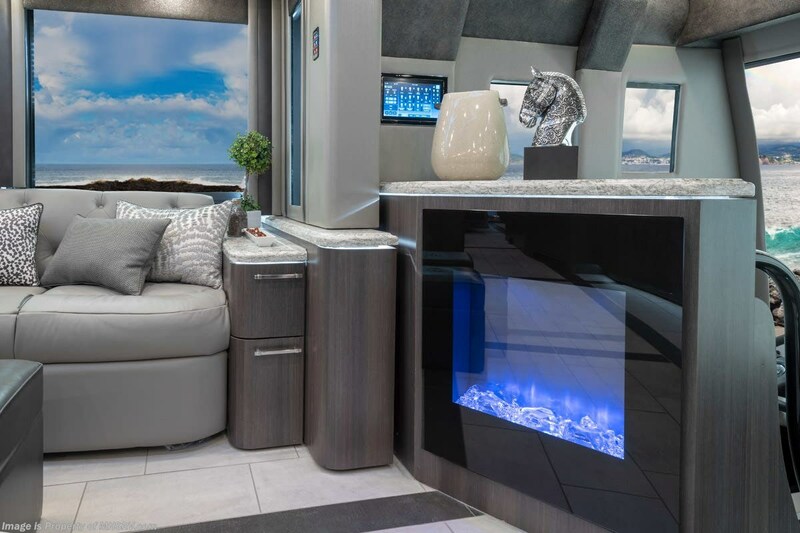 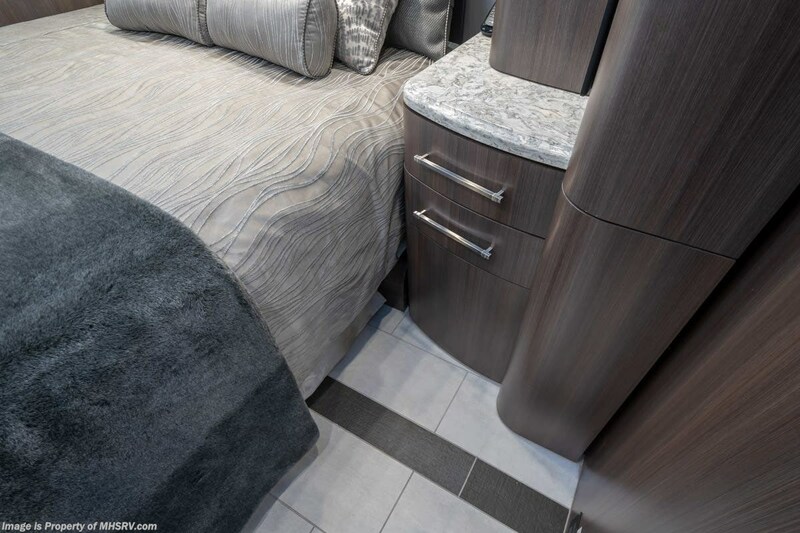 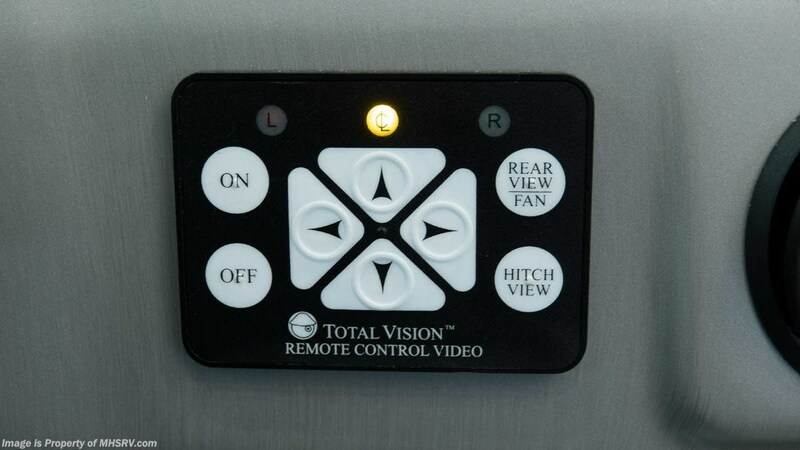 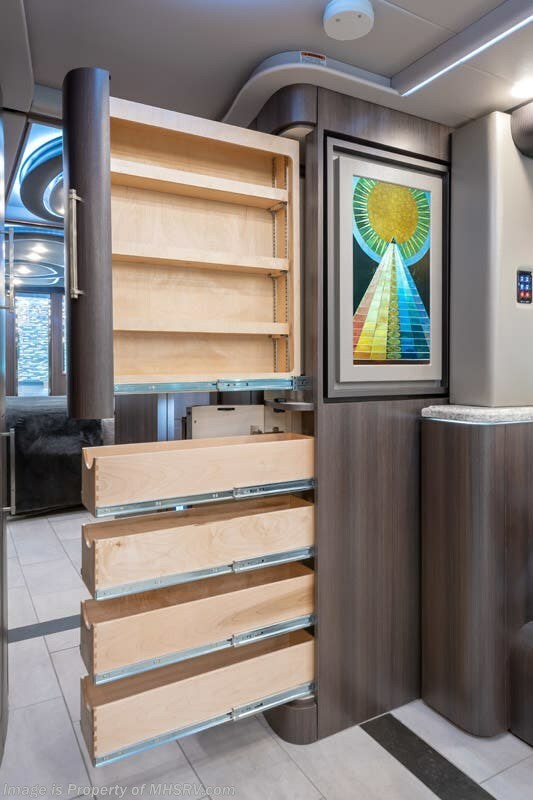 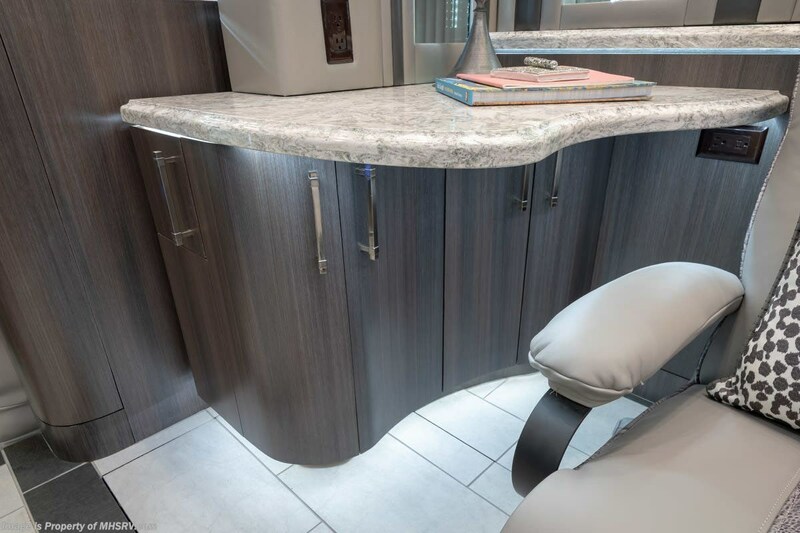 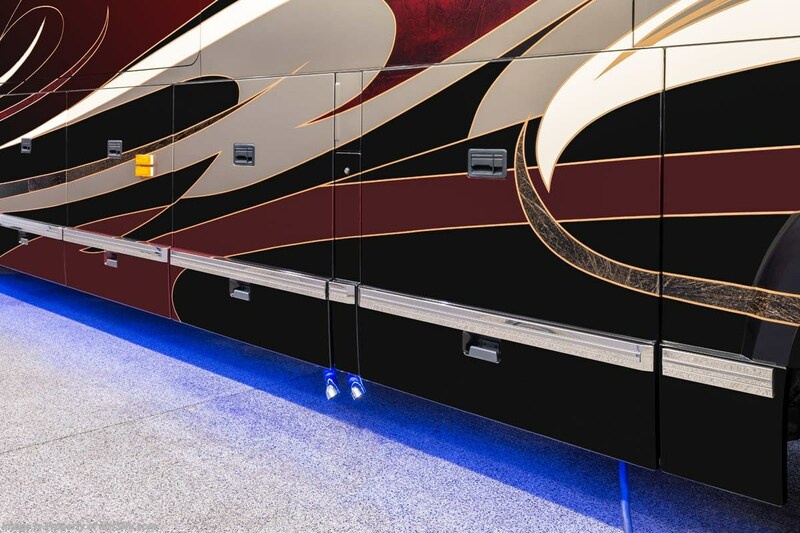 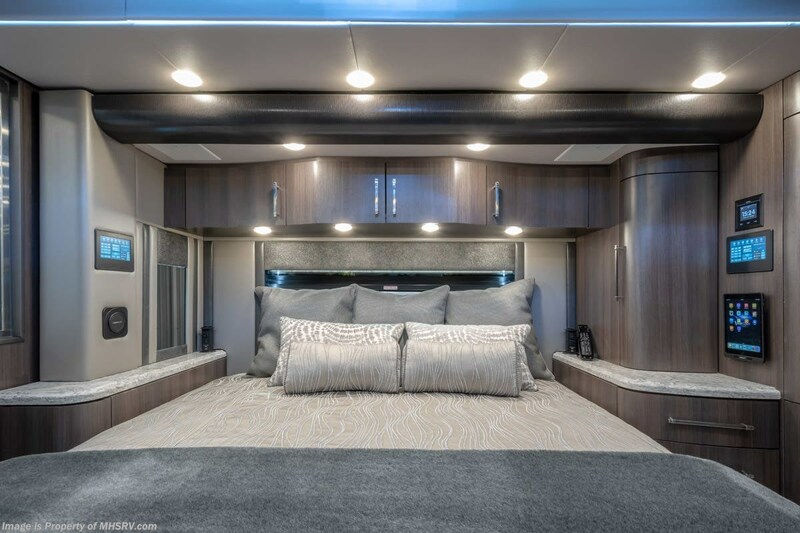 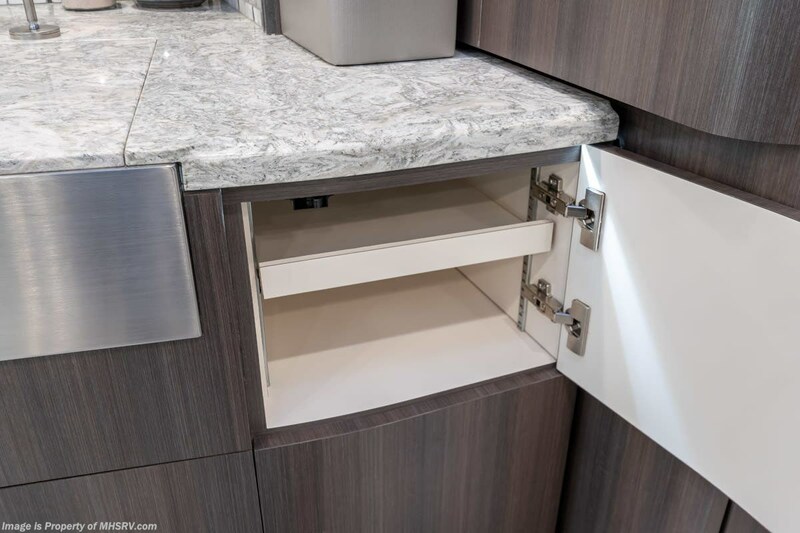 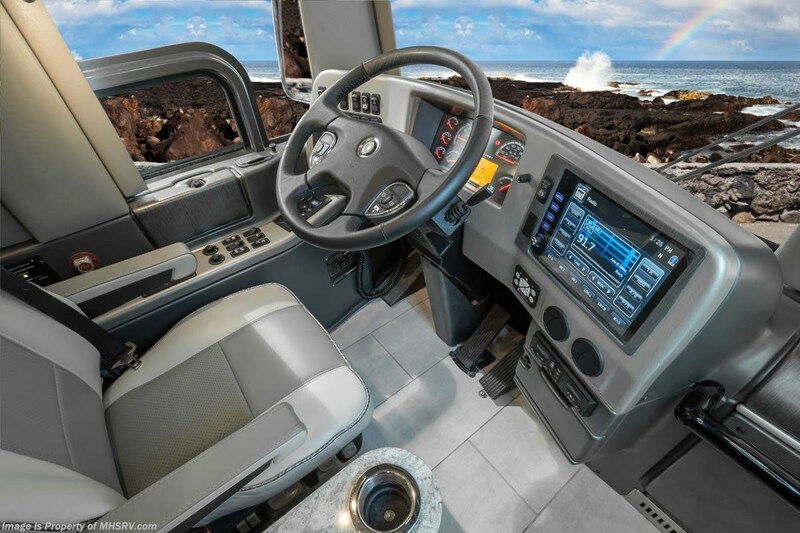 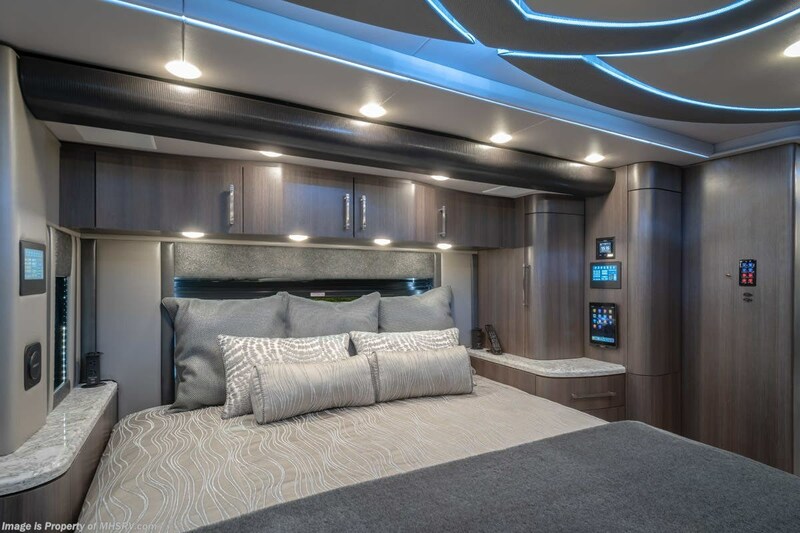 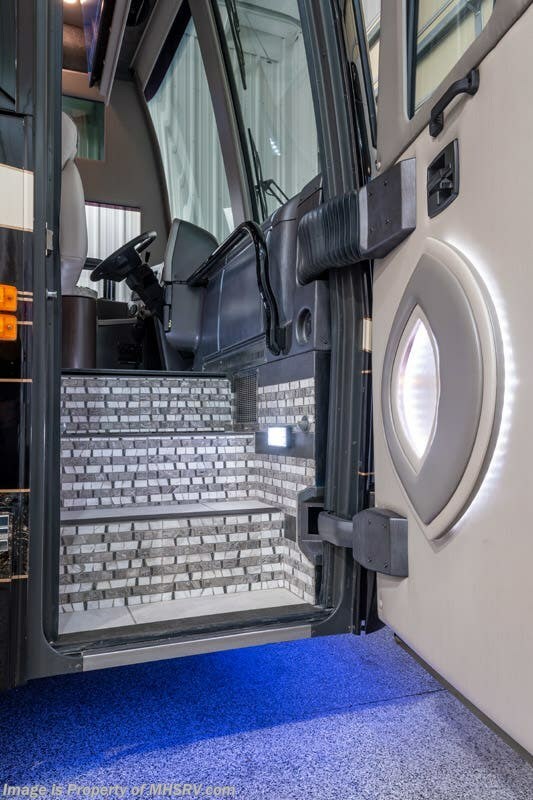 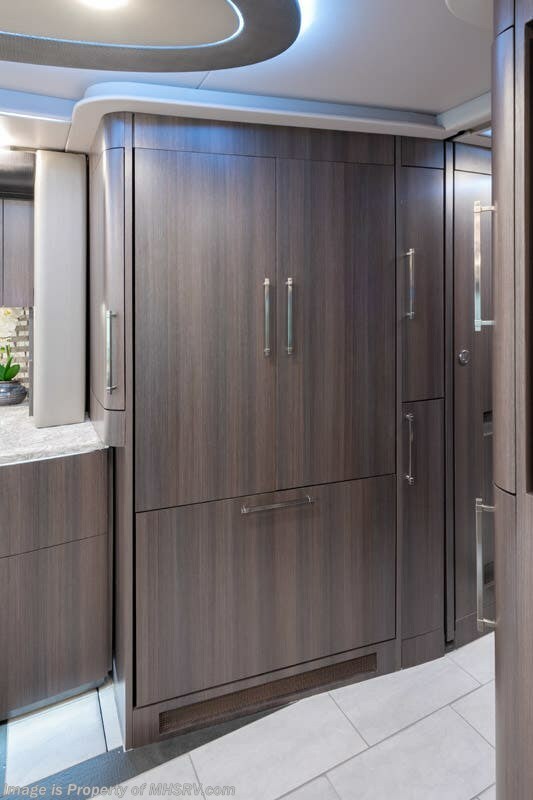 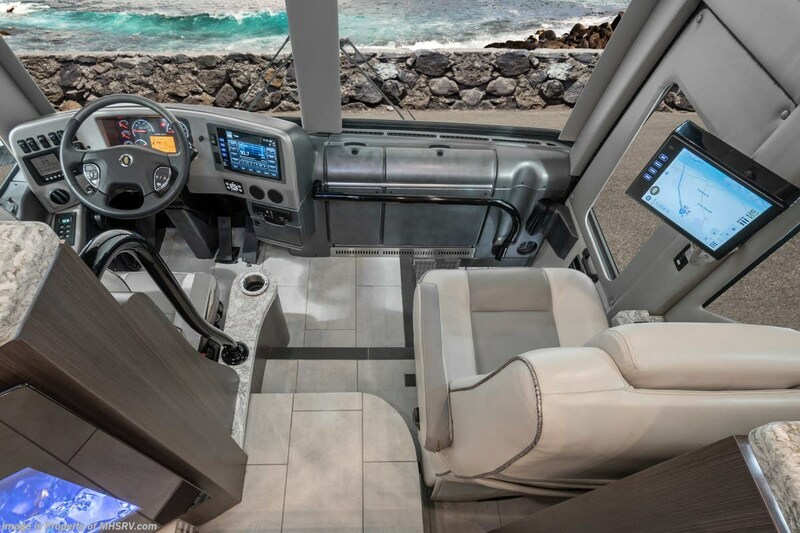 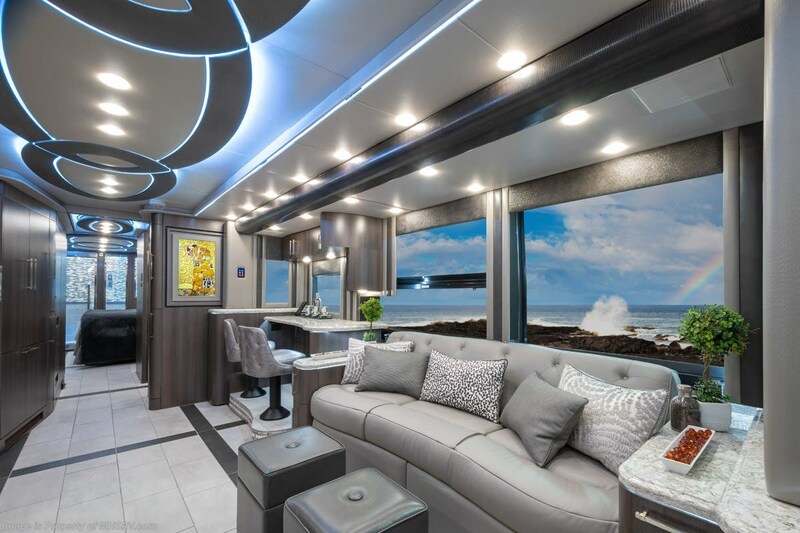 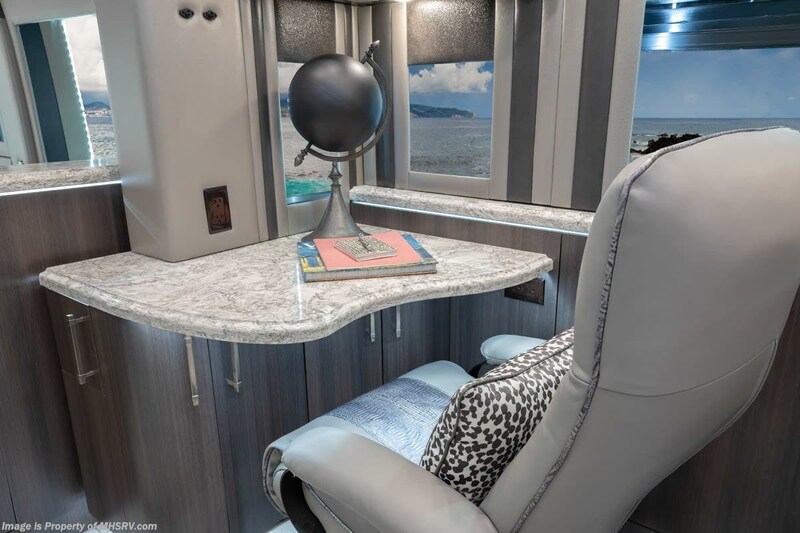 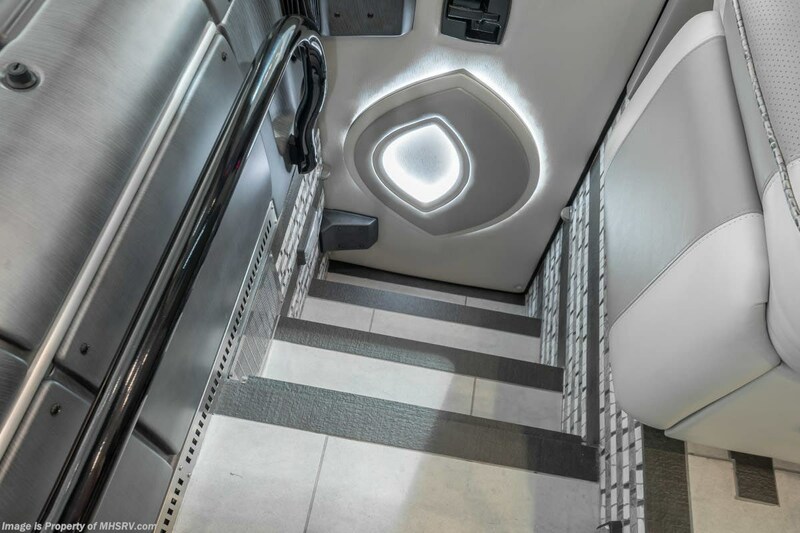 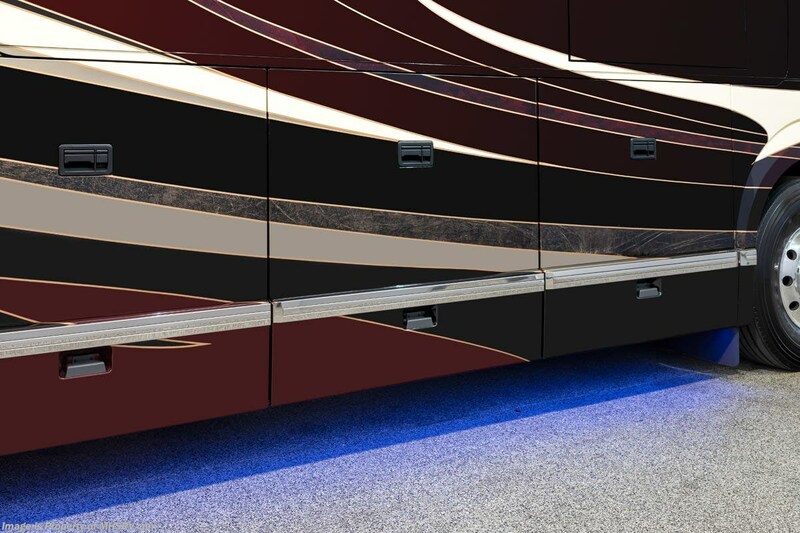 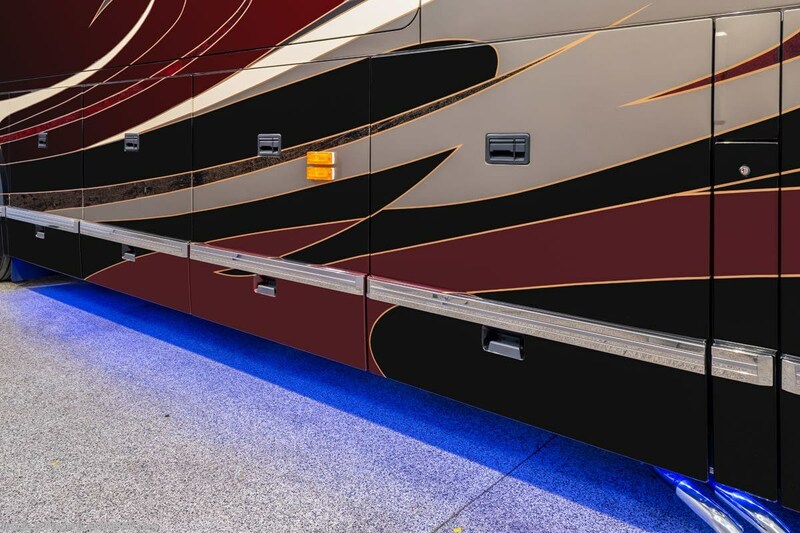 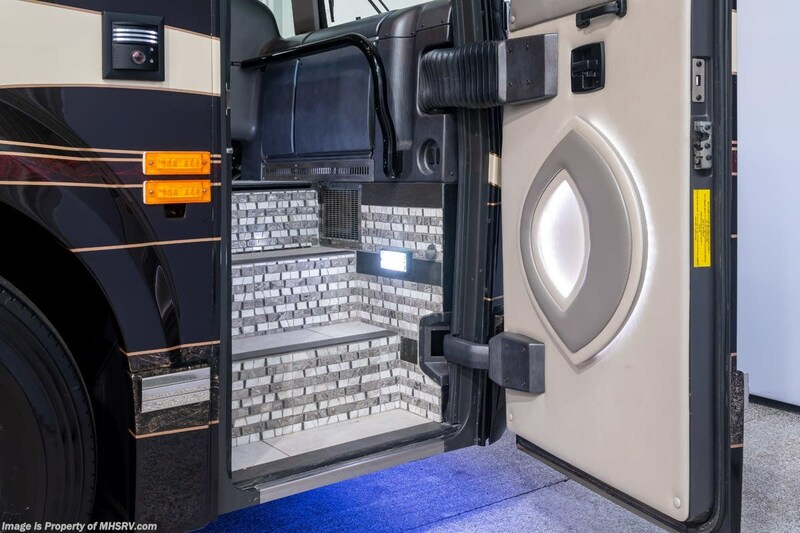 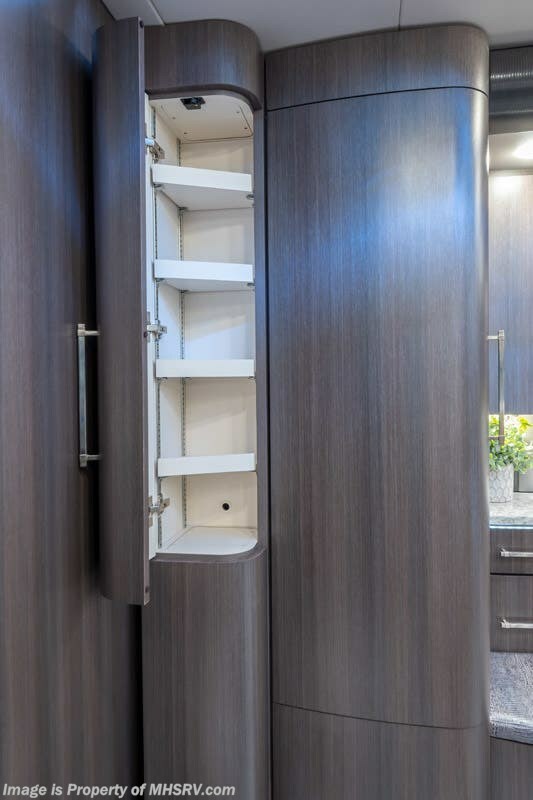 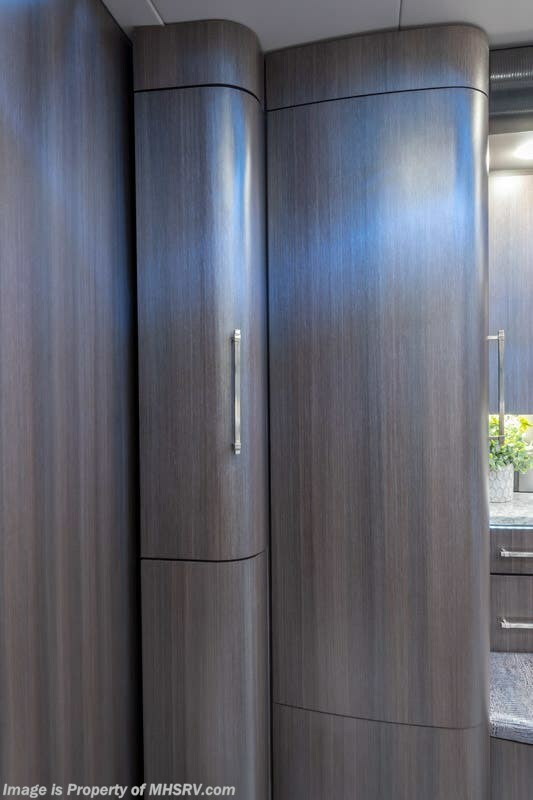 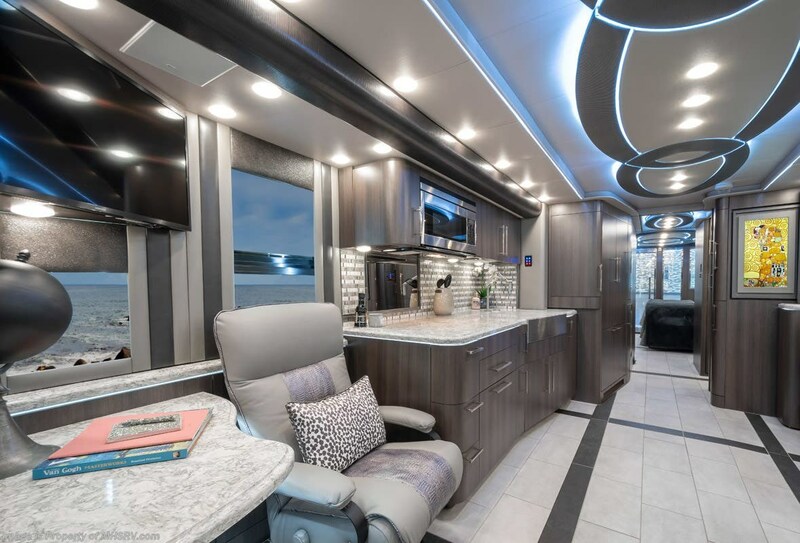 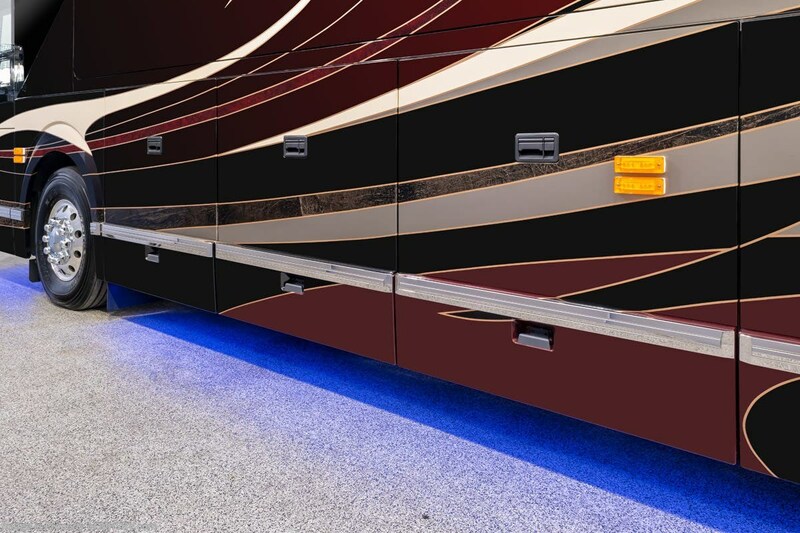 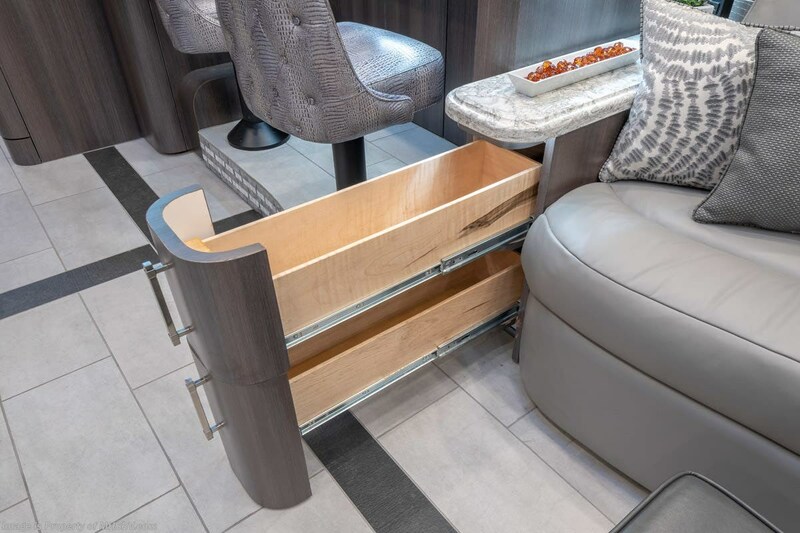 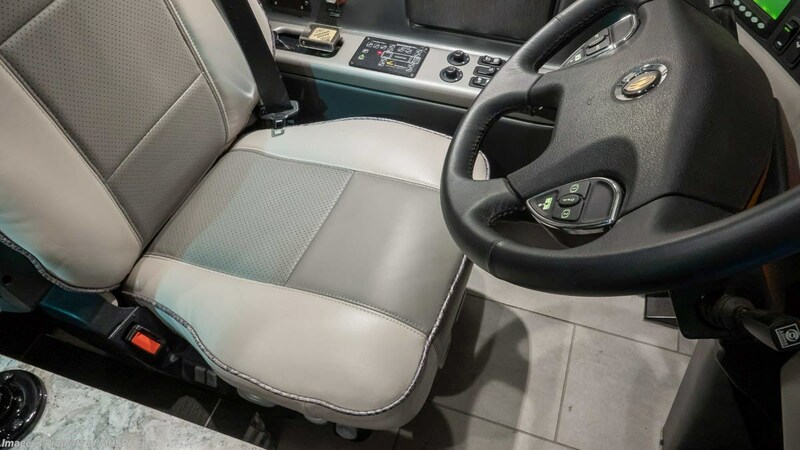 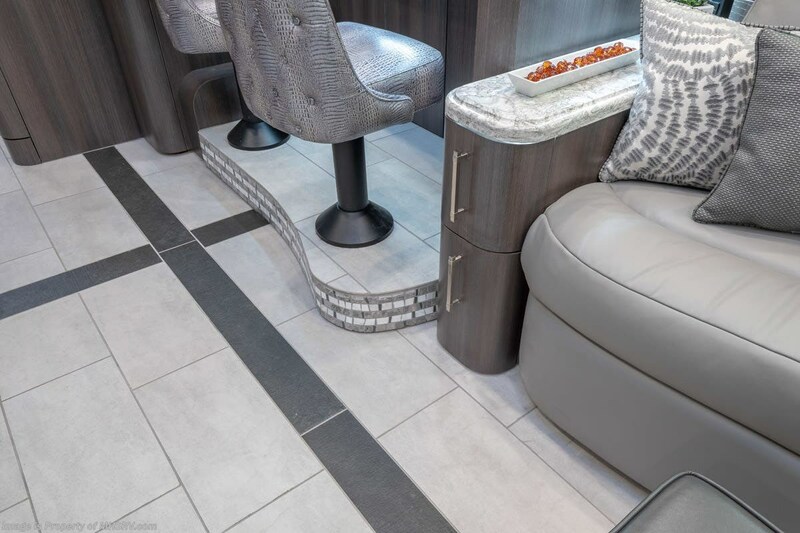 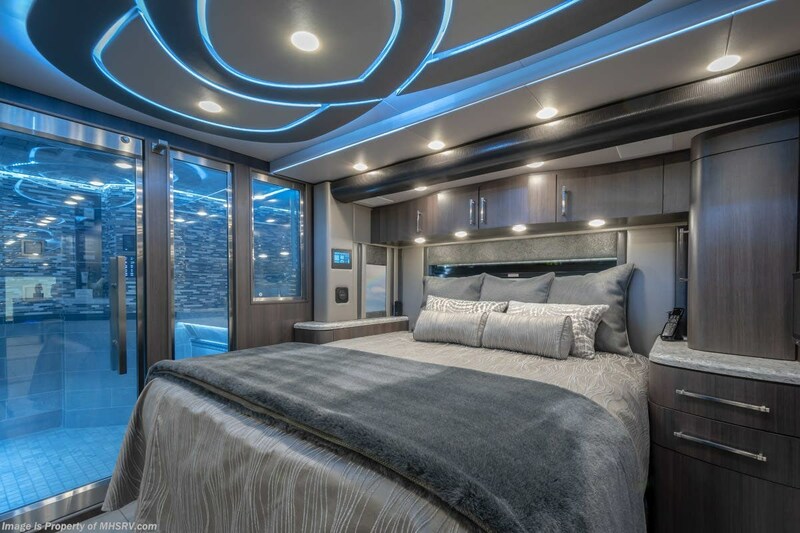 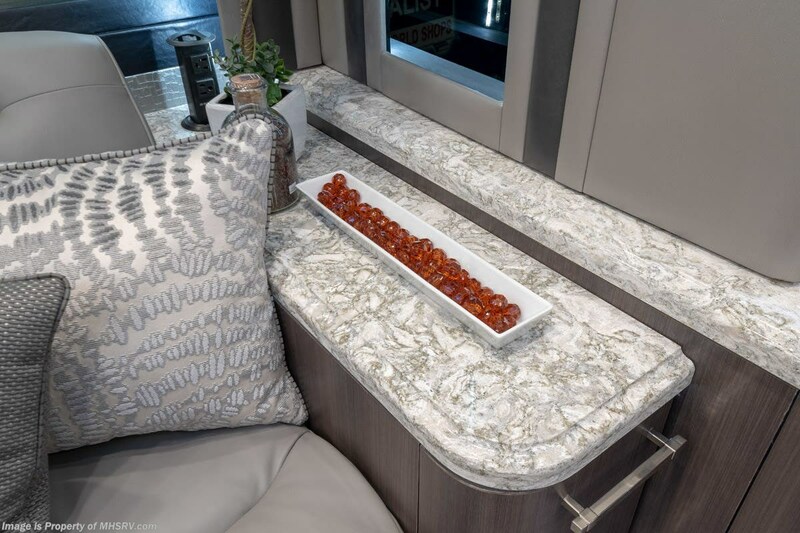 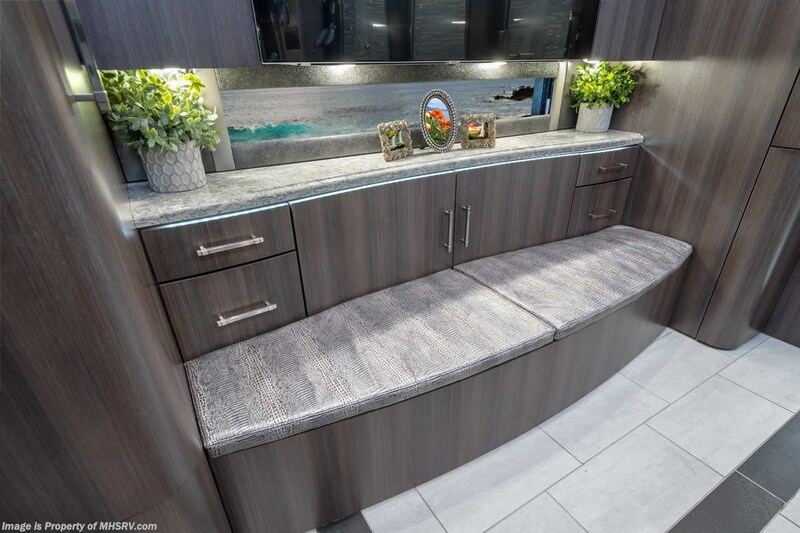 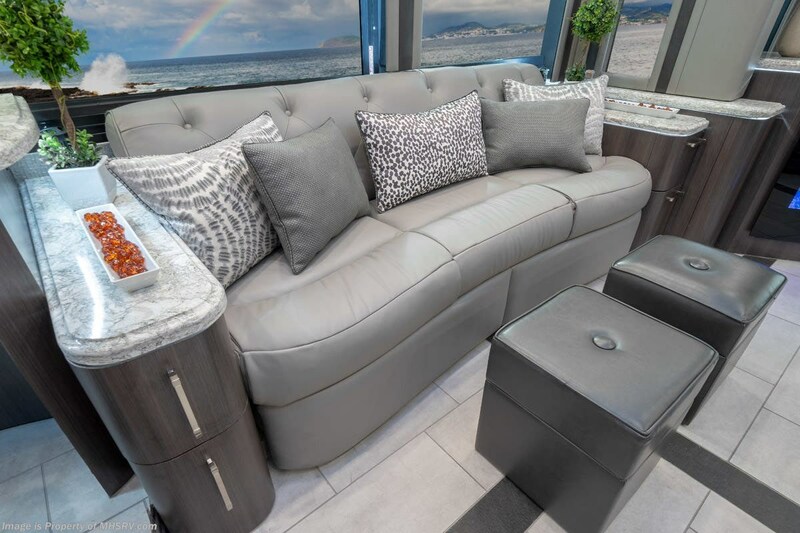 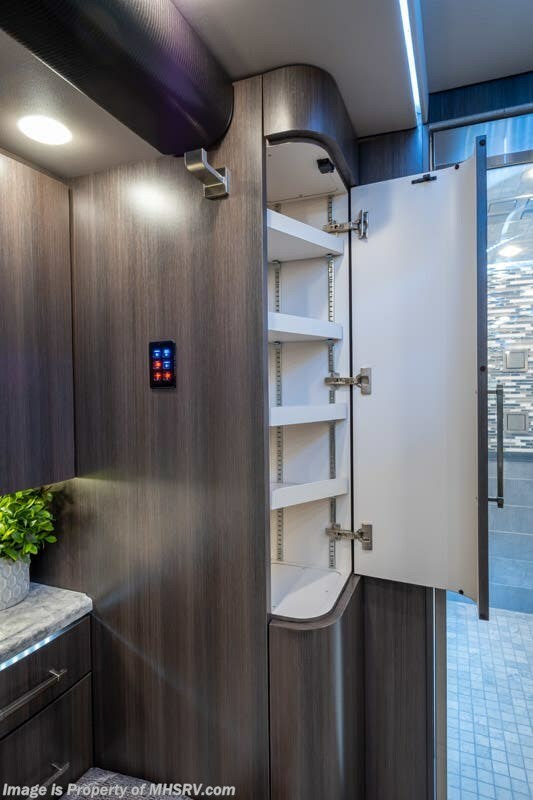 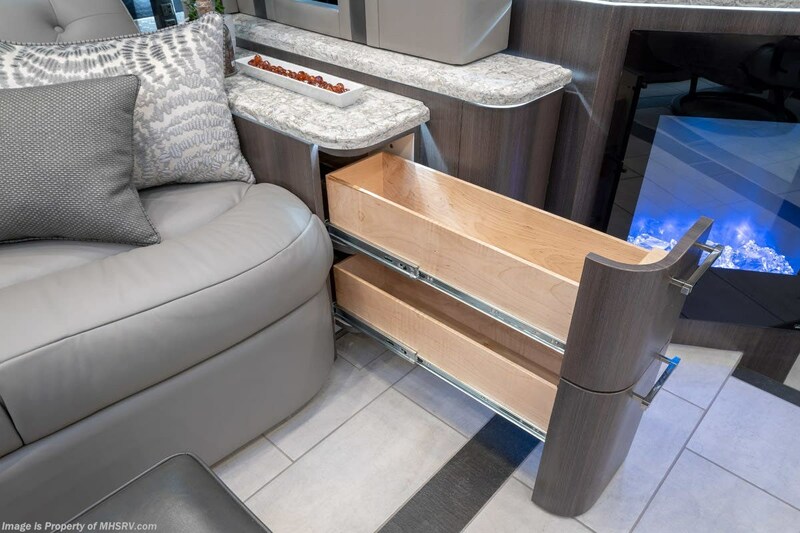 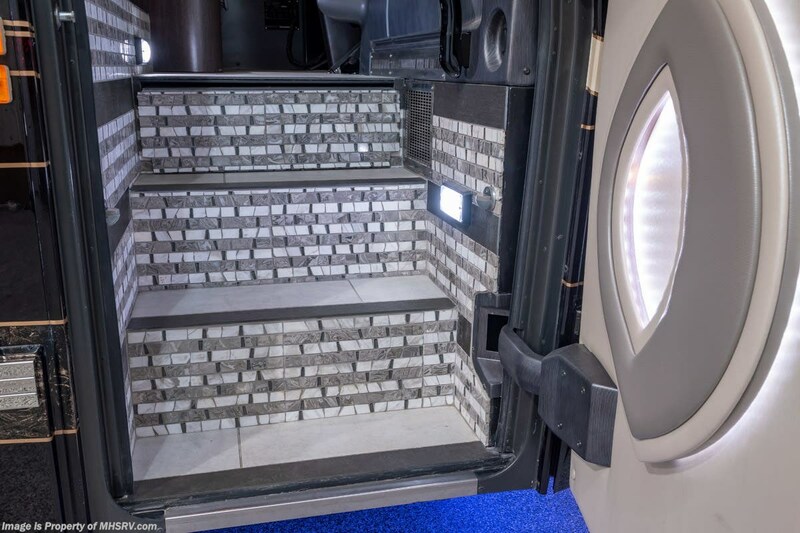 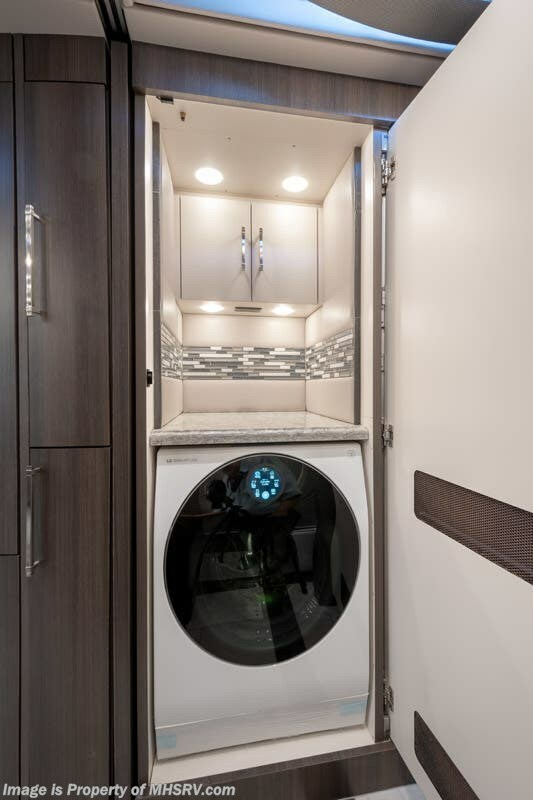 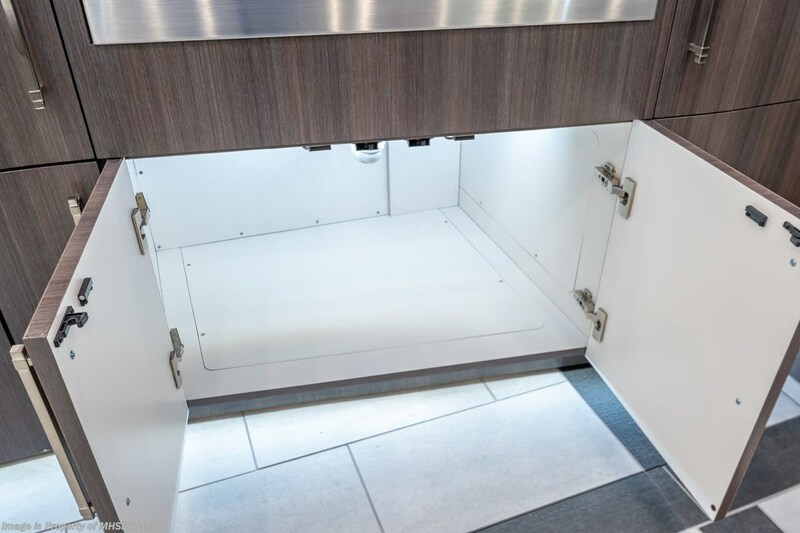 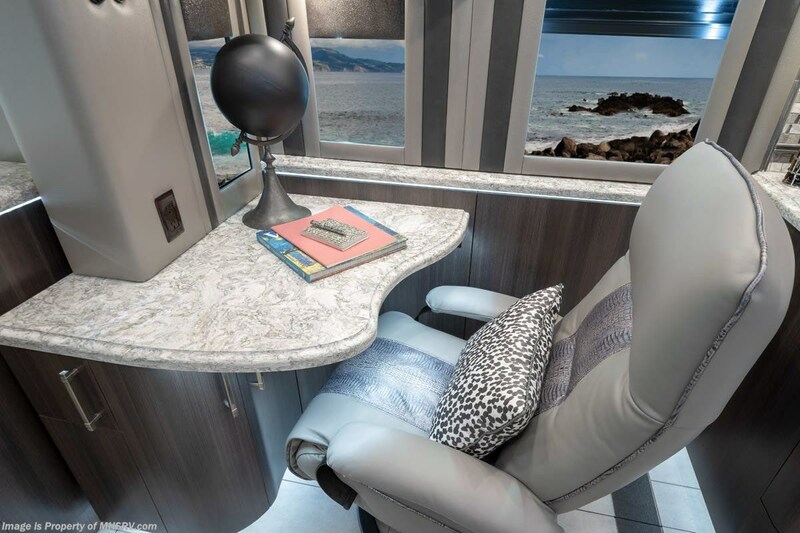 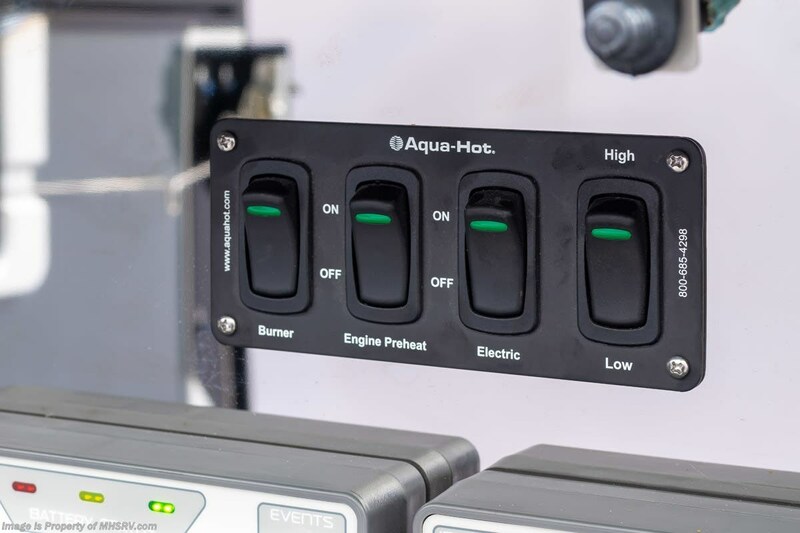 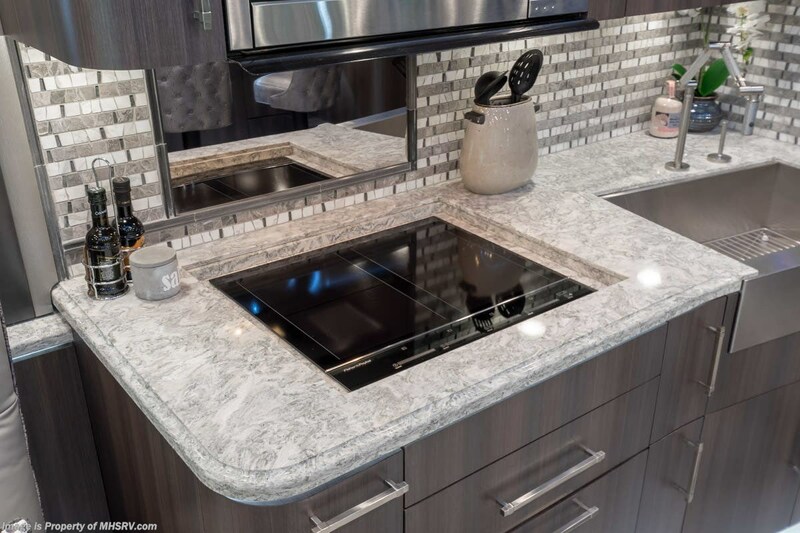 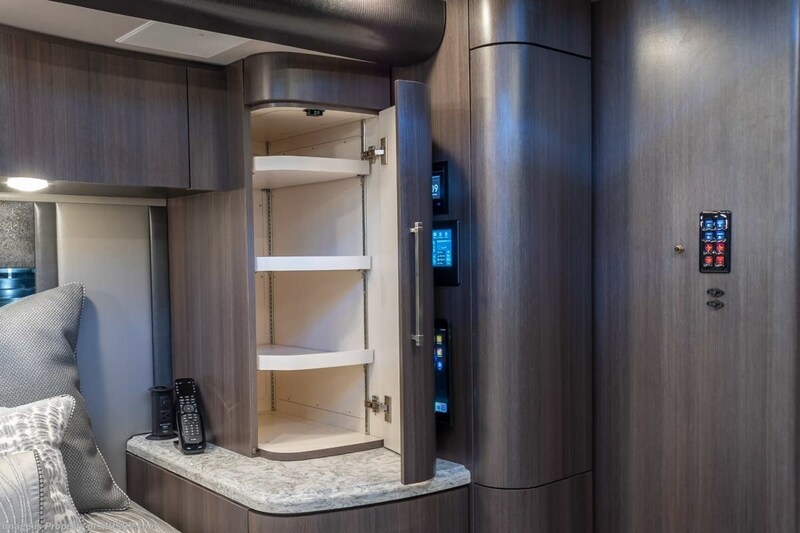 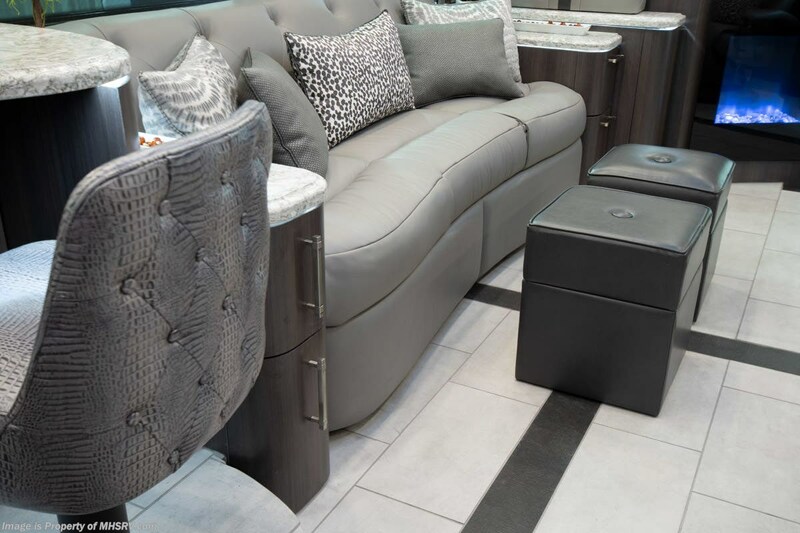 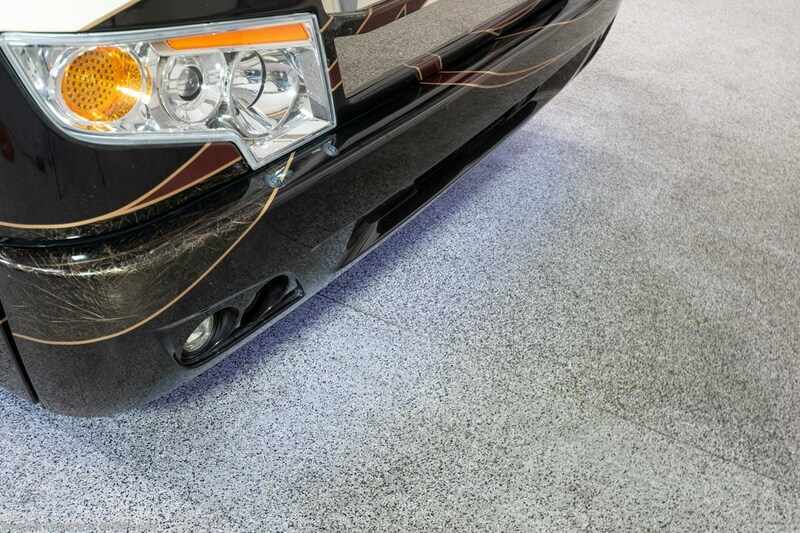 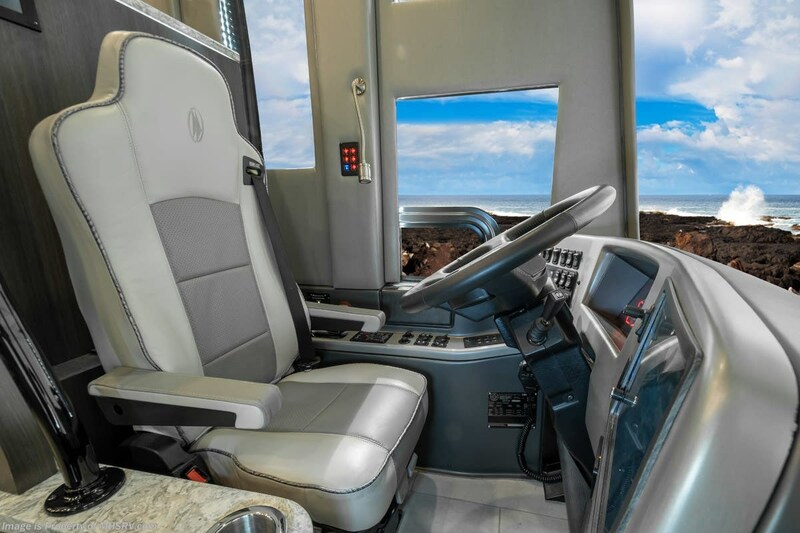 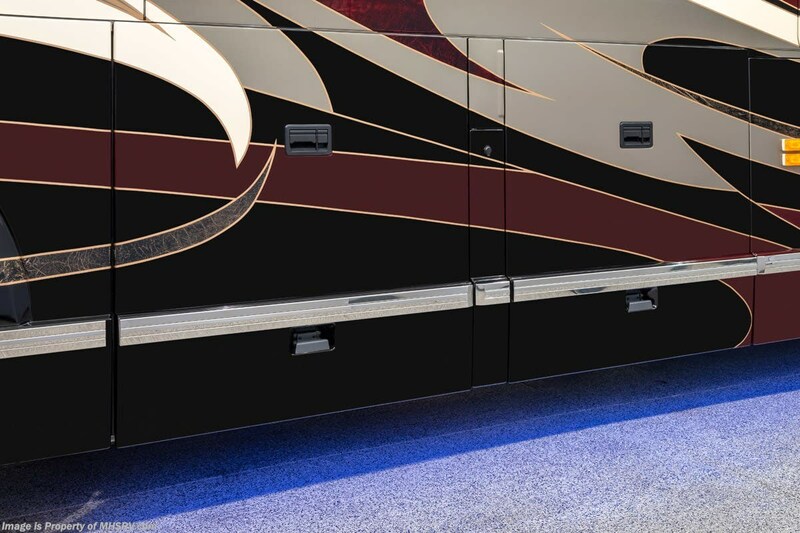 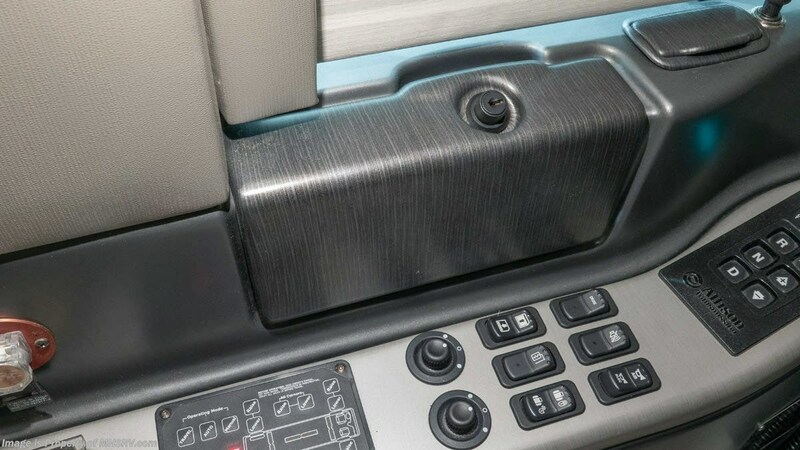 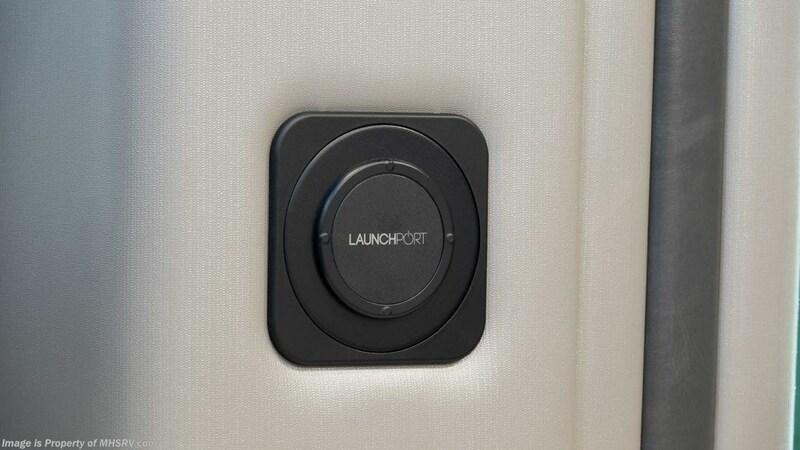 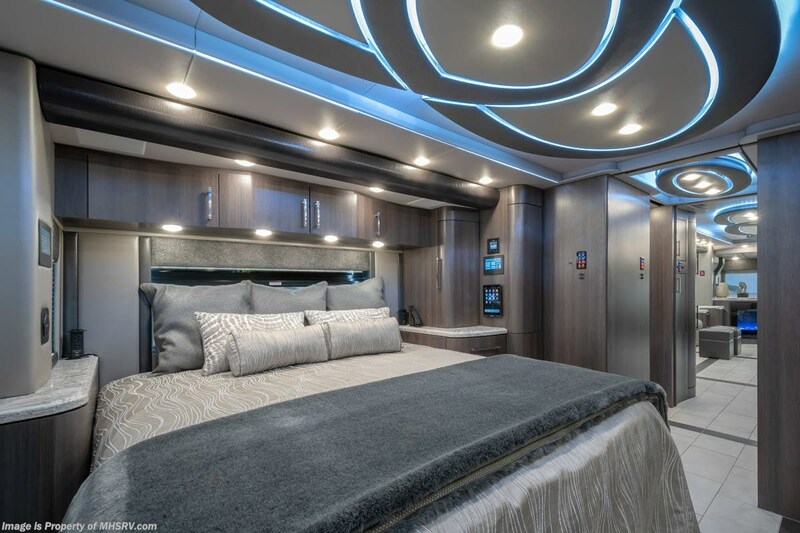 Just a few other coach highlights include heated floors, air actuated pocket doors, custom Hydro-Dip™ dash panels, a VegaTouch® coach control system and a Prevost® approved built-in exterior TV that does not take up any of your bay storage space. 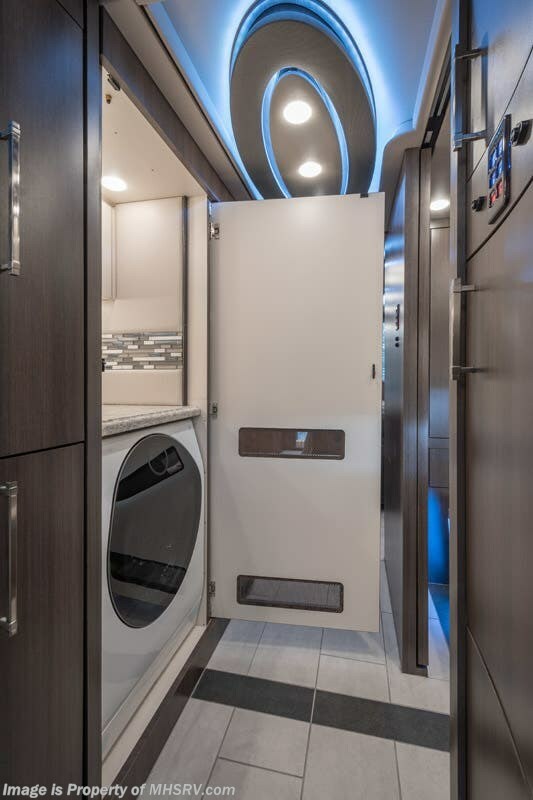 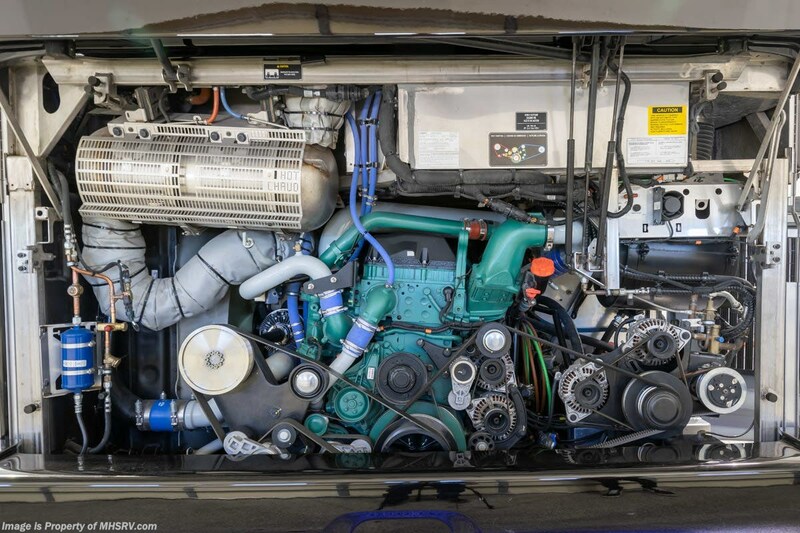 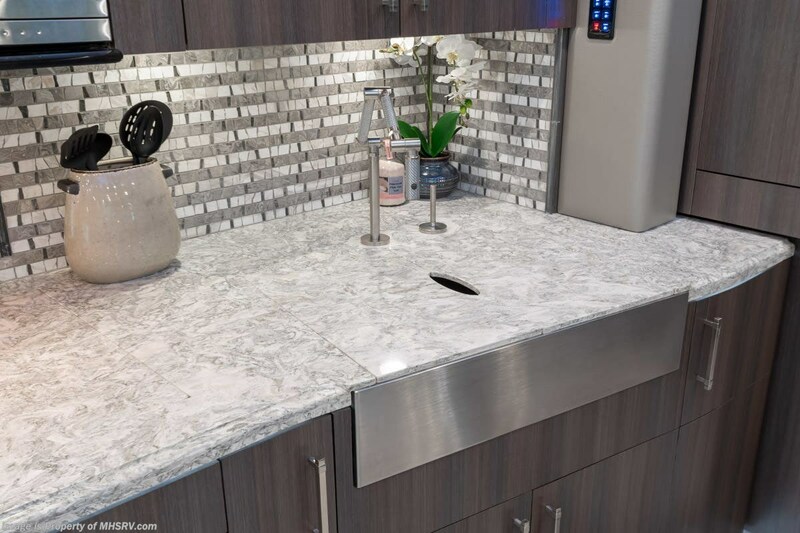 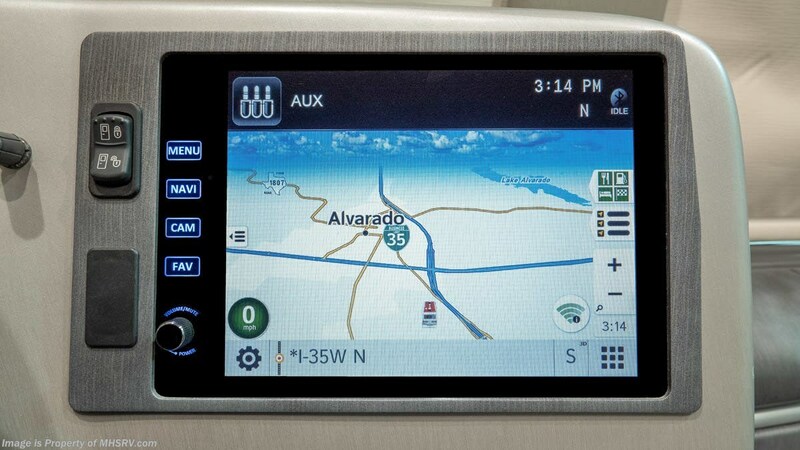 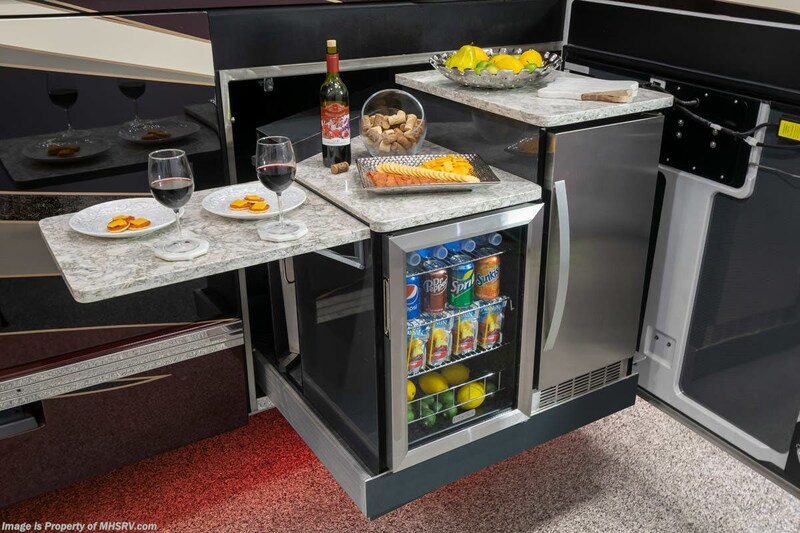 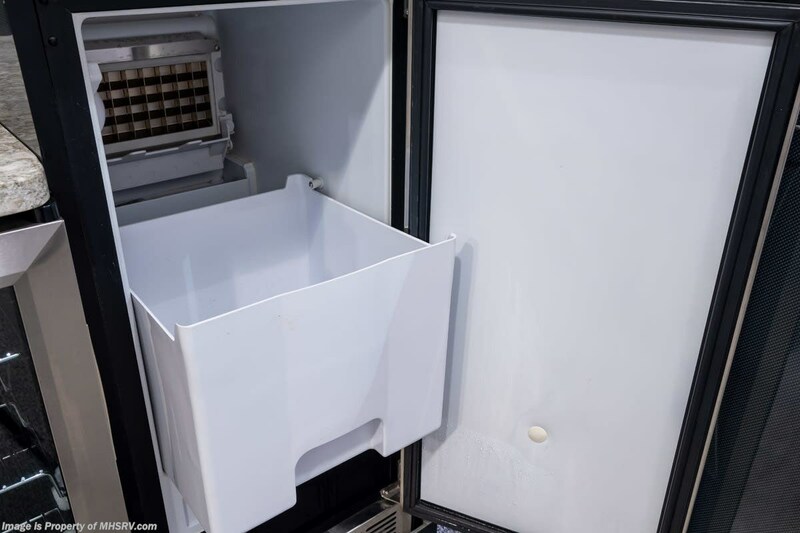 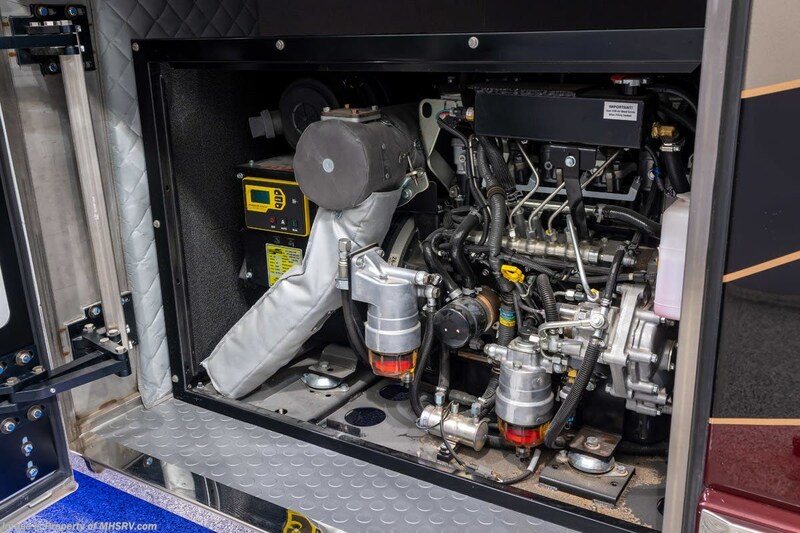 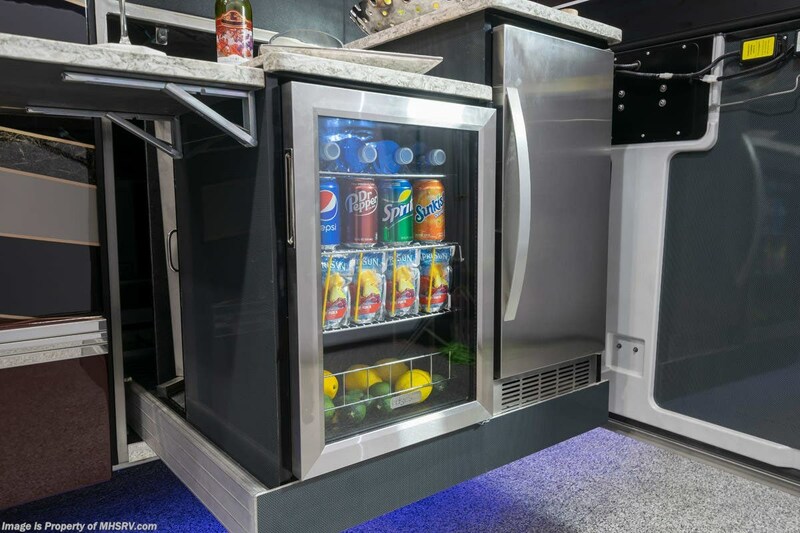 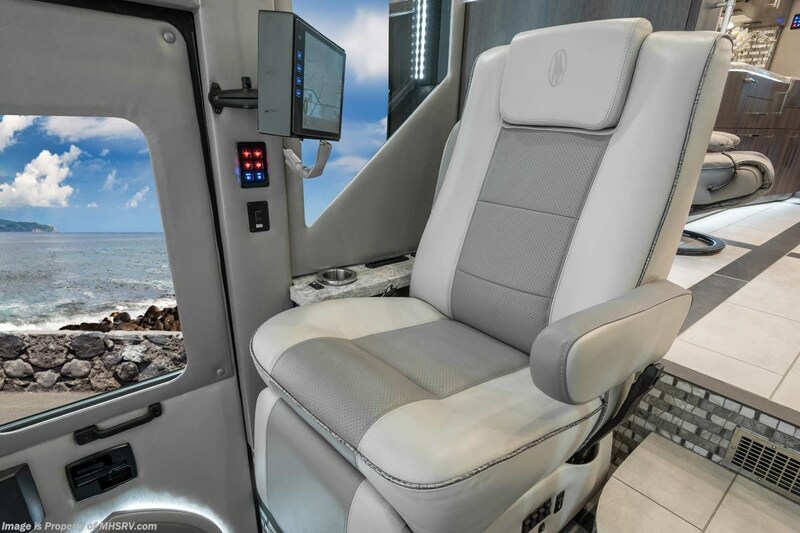 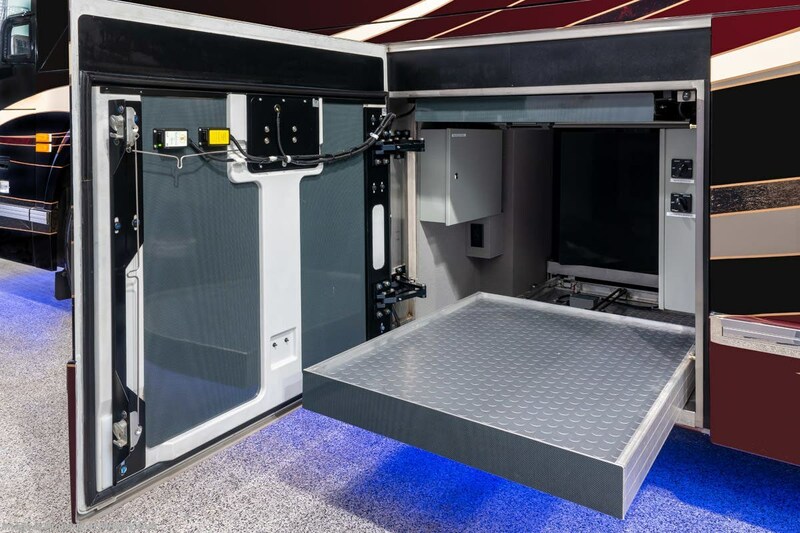 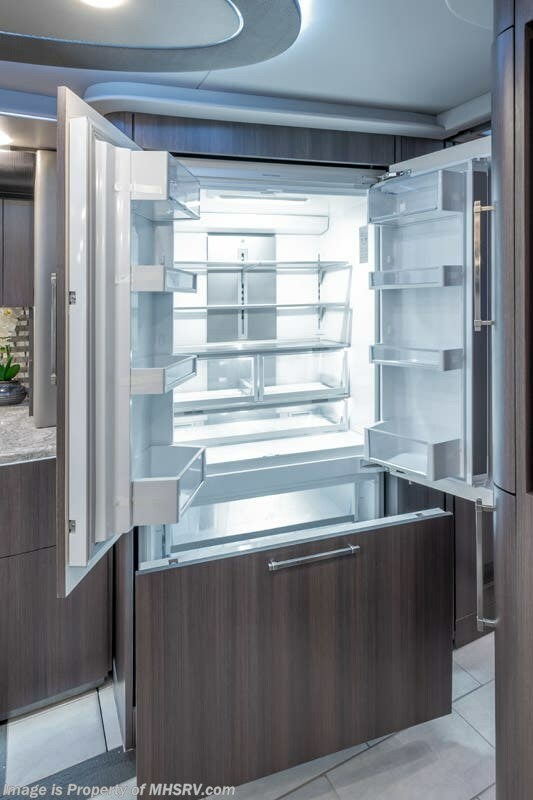 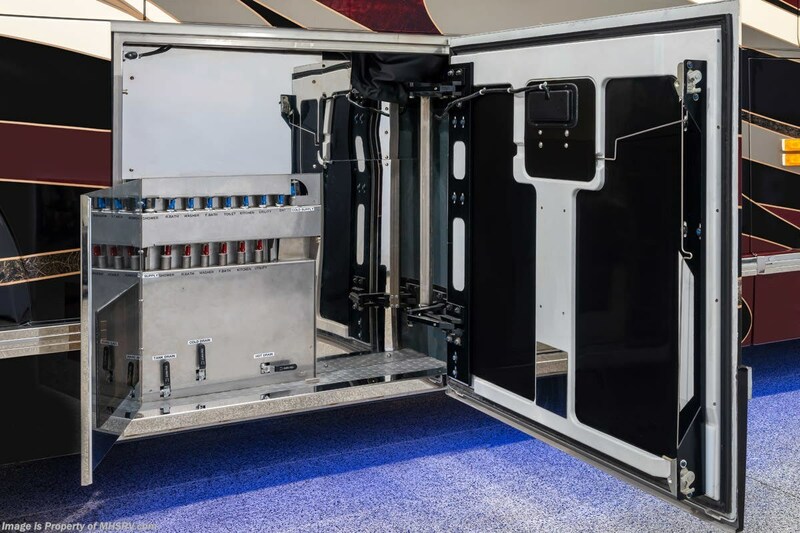 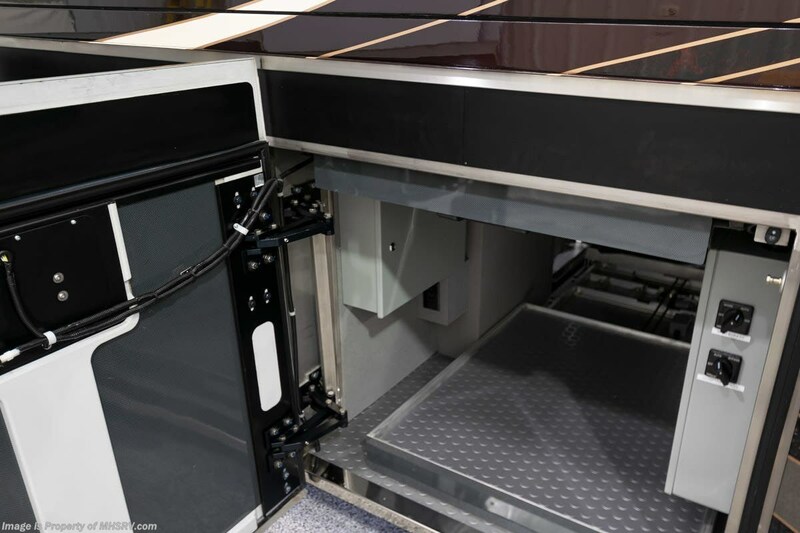 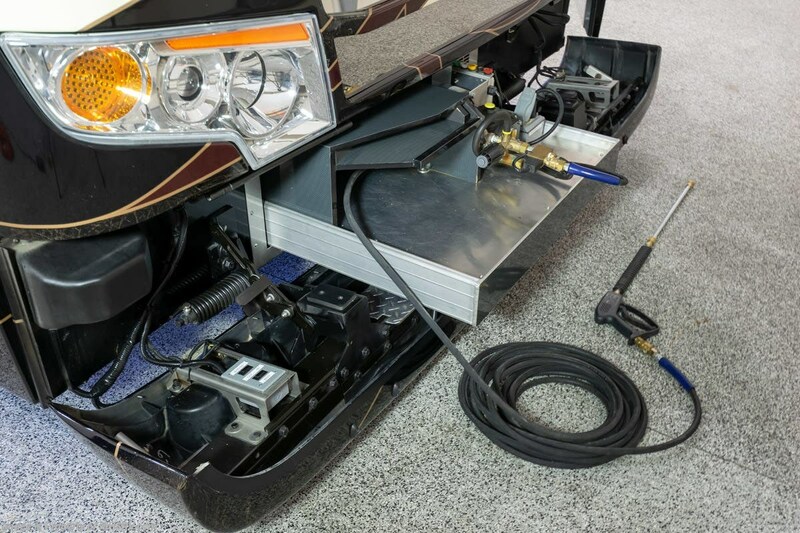 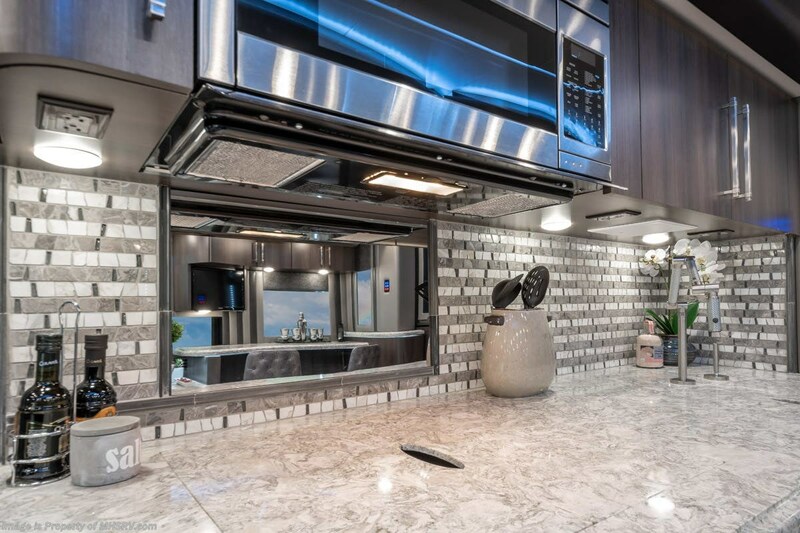 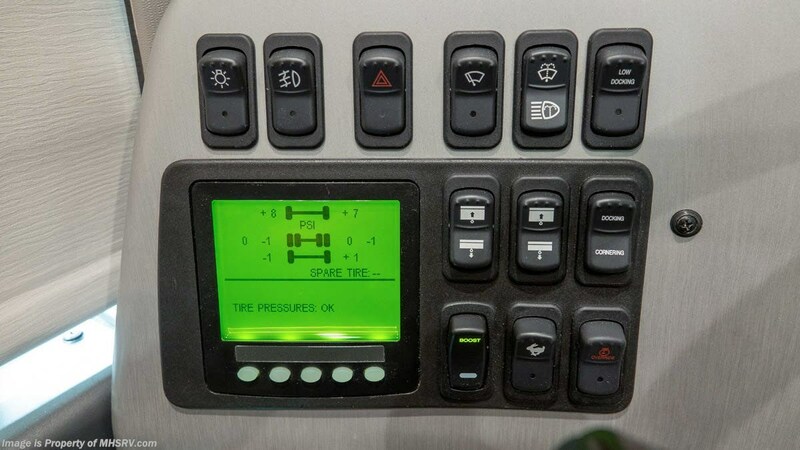 You will also find a large exterior ice maker, refrigerator, grill, (4) Girard awnings, a 20KW Power Tech diesel generator, (4) 3500w Outback inverters, 8D Gel Cell batteries, an Aqua-Hot Hydronic Heating system, (3) power cargo trays and an integrated high-pressure coach wash to keep your rolling master piece looking its best. 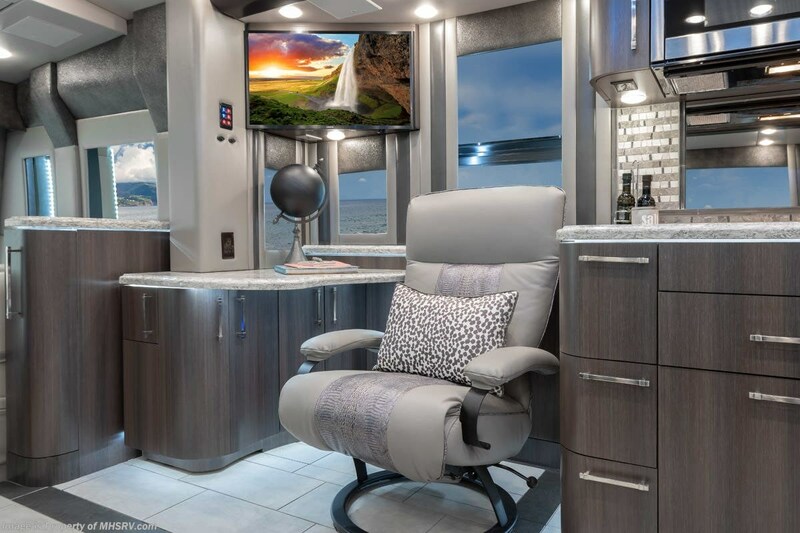 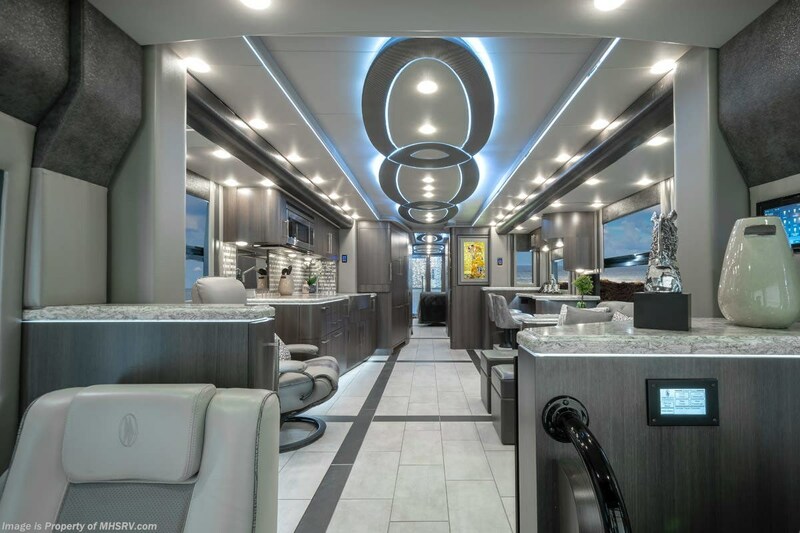 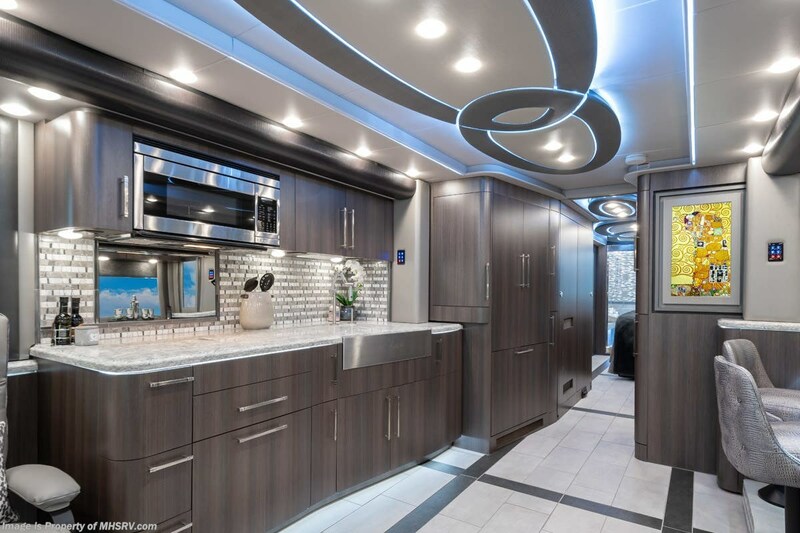 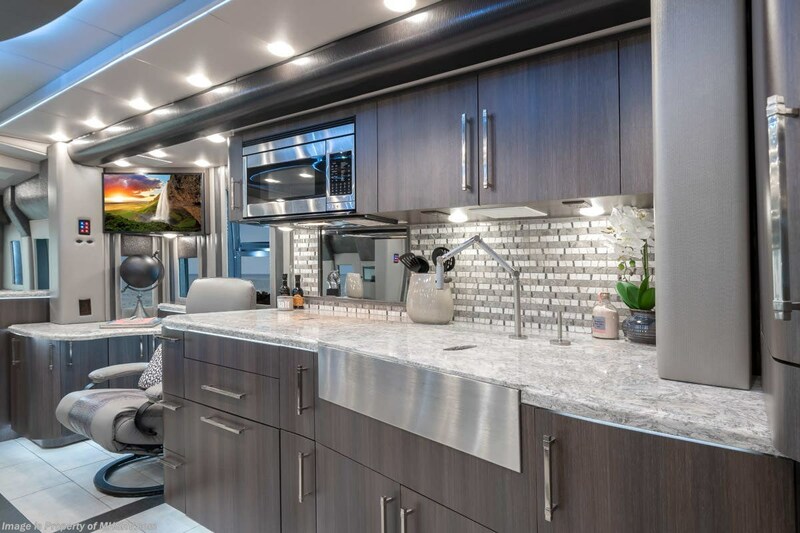 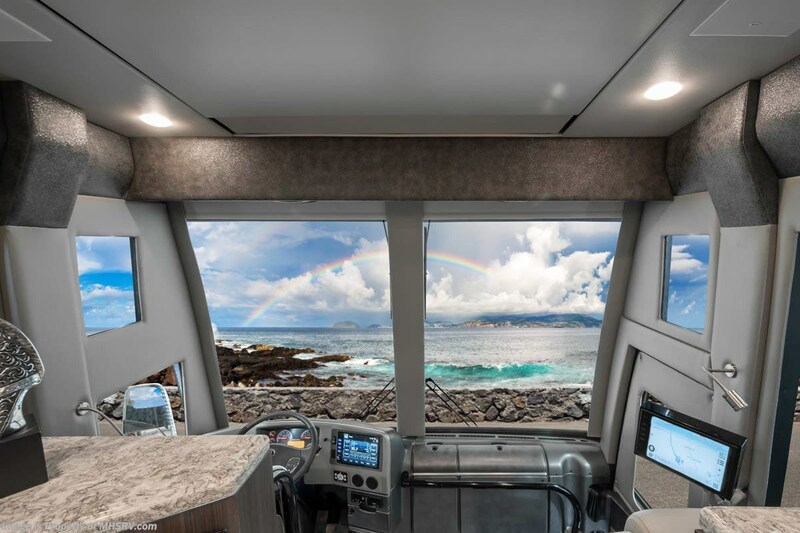 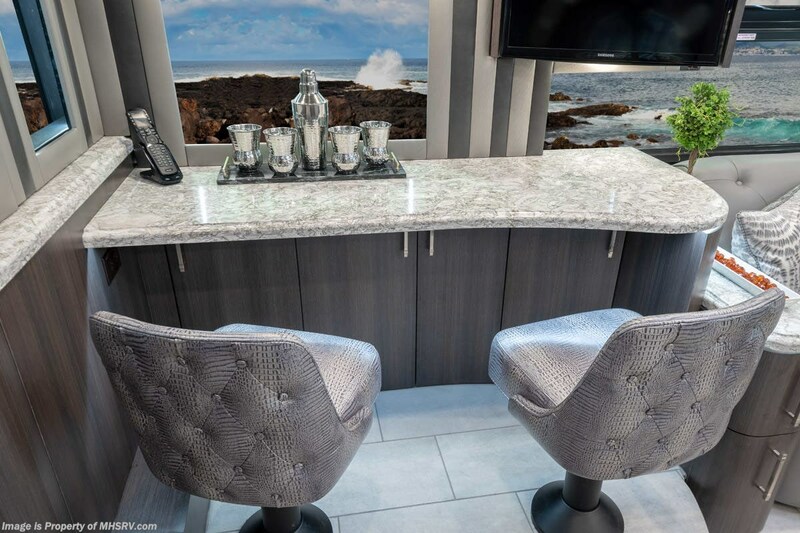 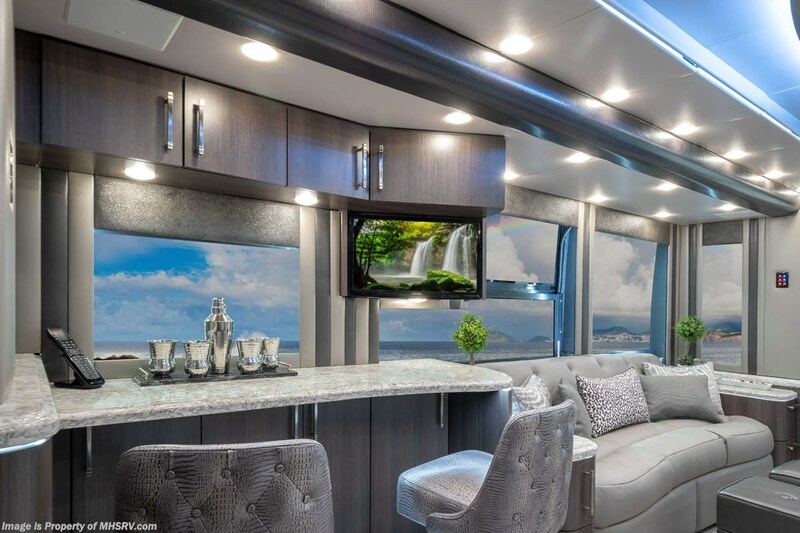 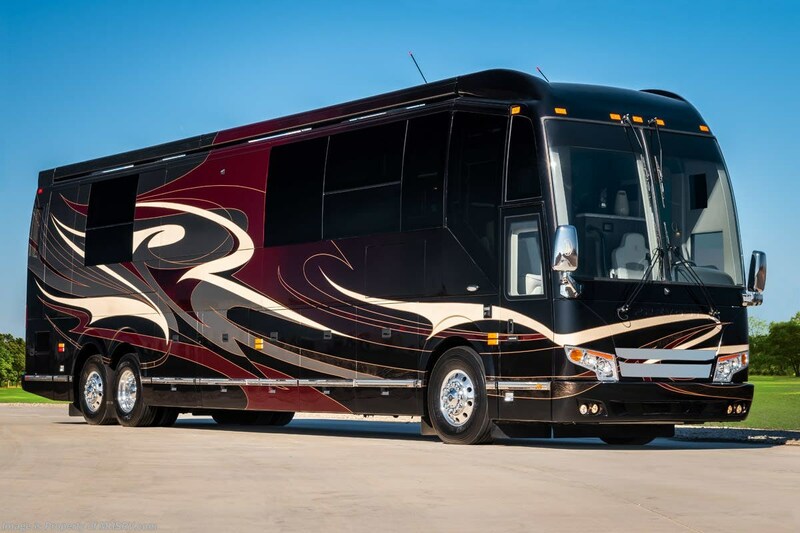 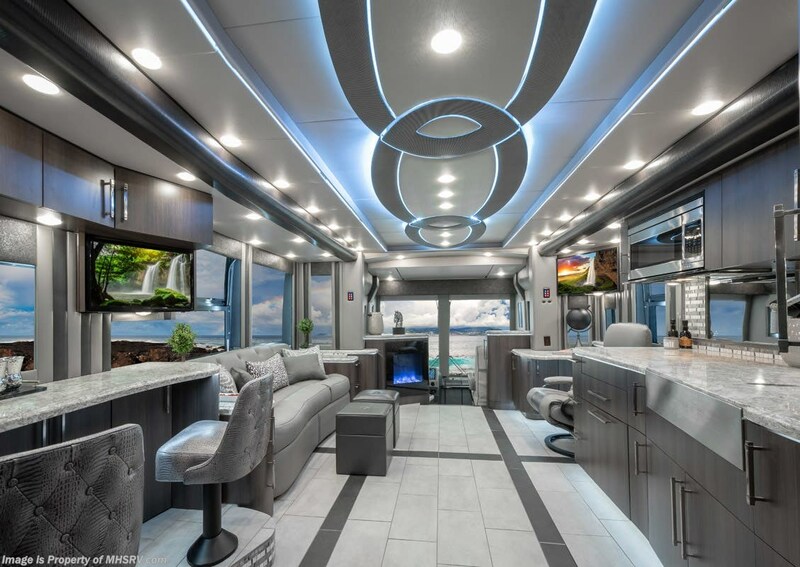 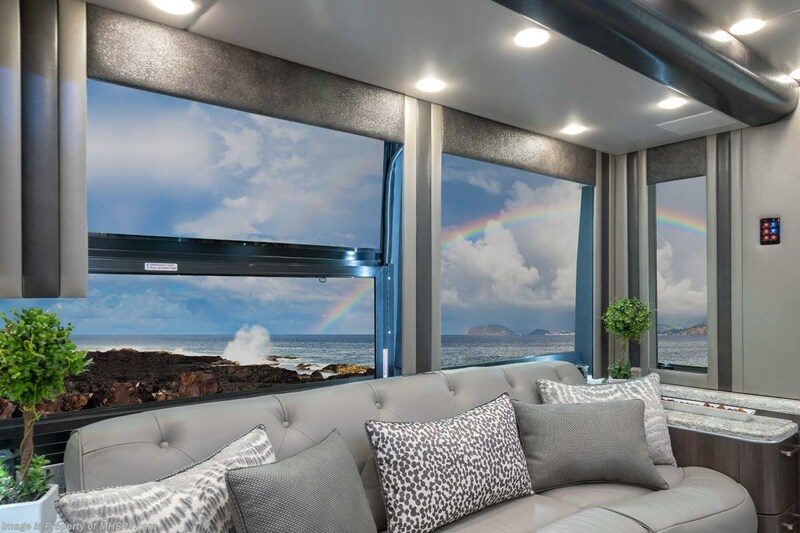 For more information about this incredible luxury motor coach please contact Motor Home Specialist at or call 800-335-6054. 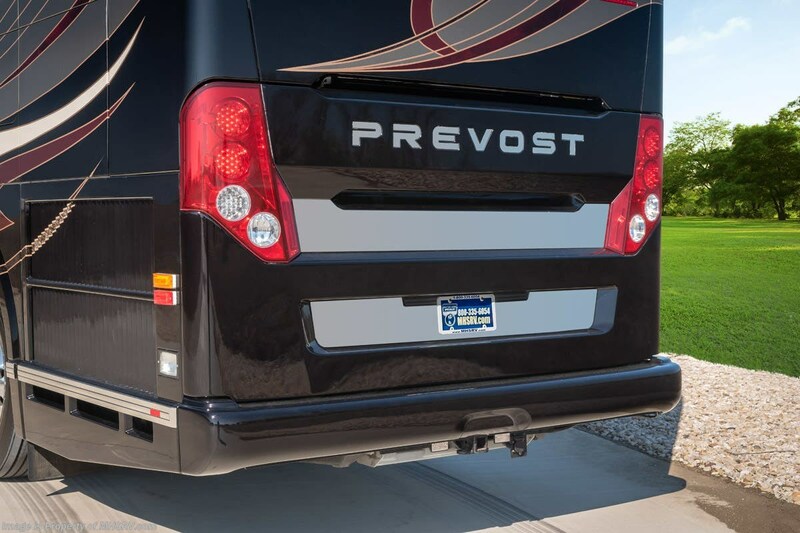 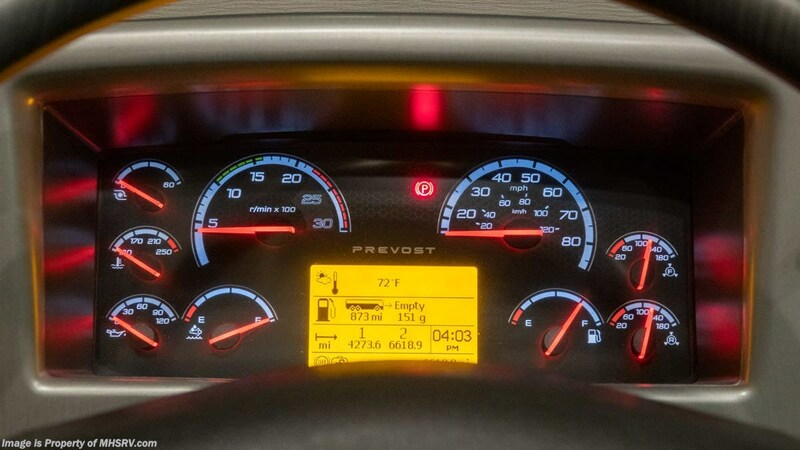 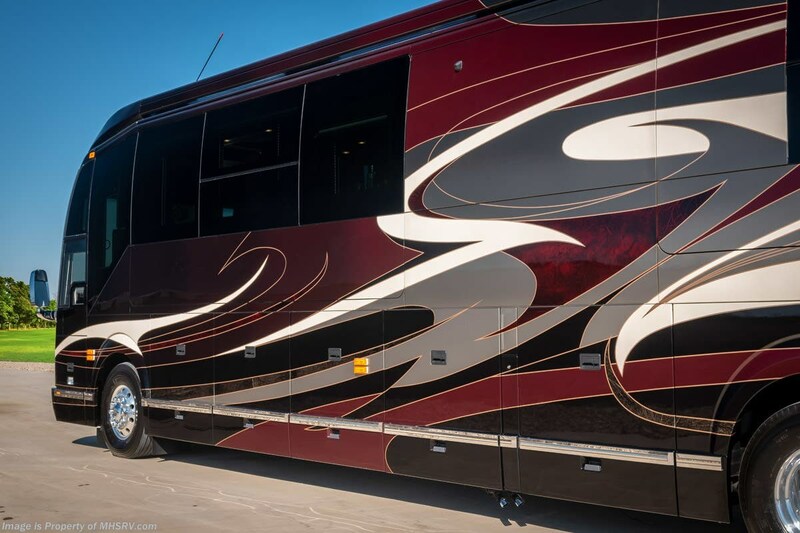 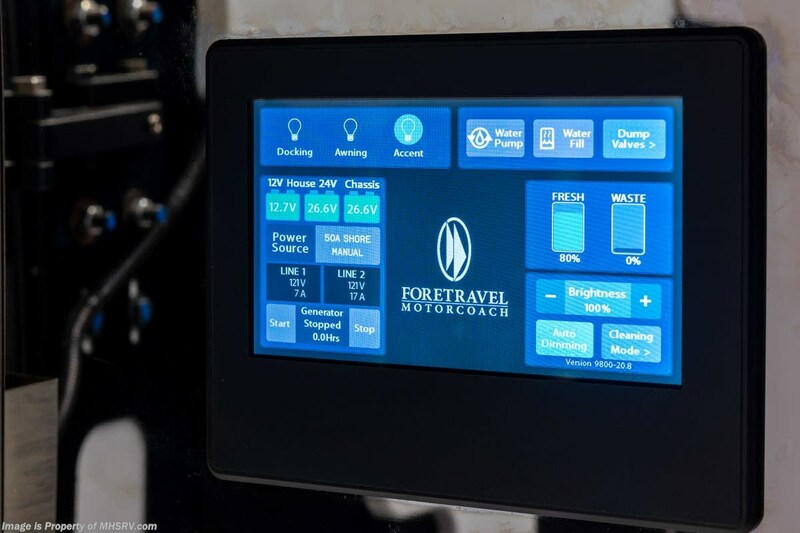 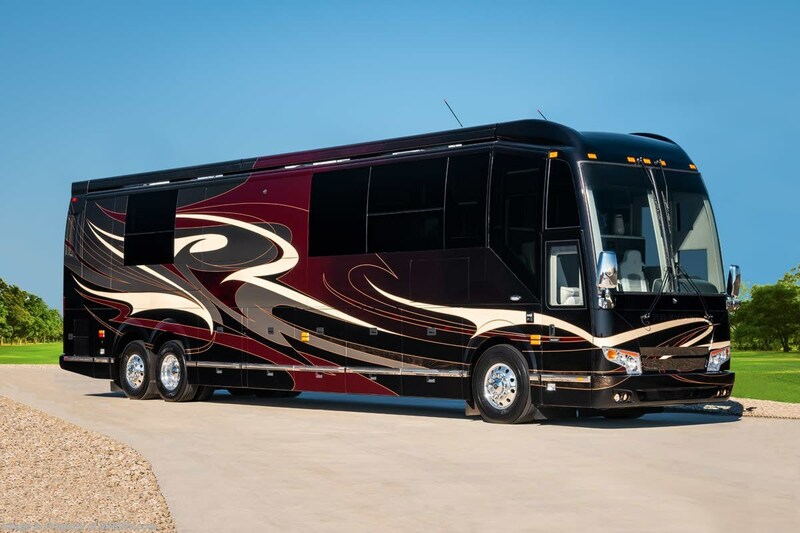 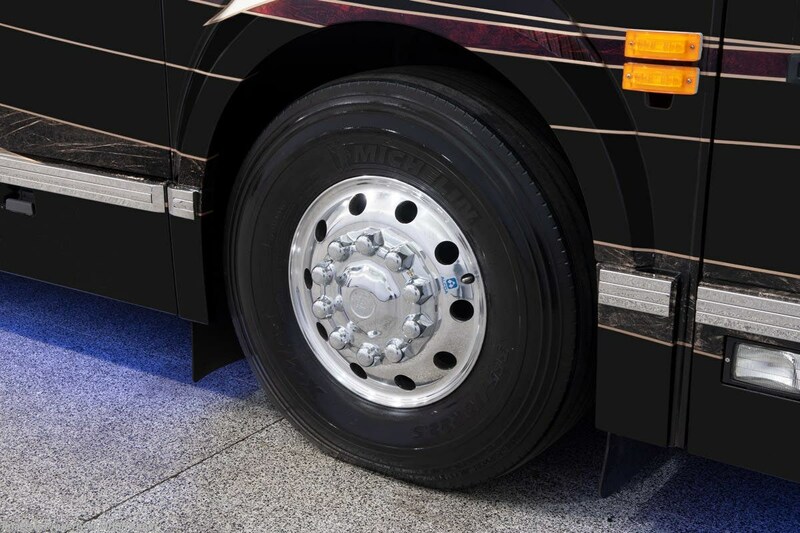 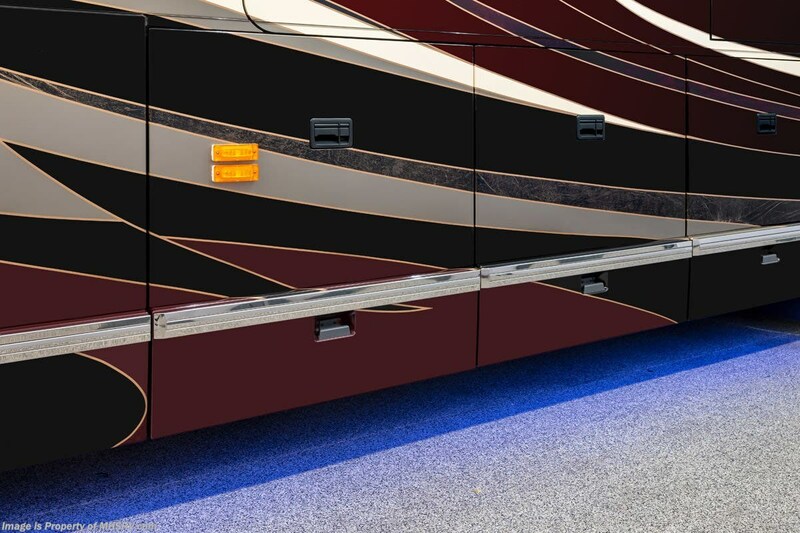 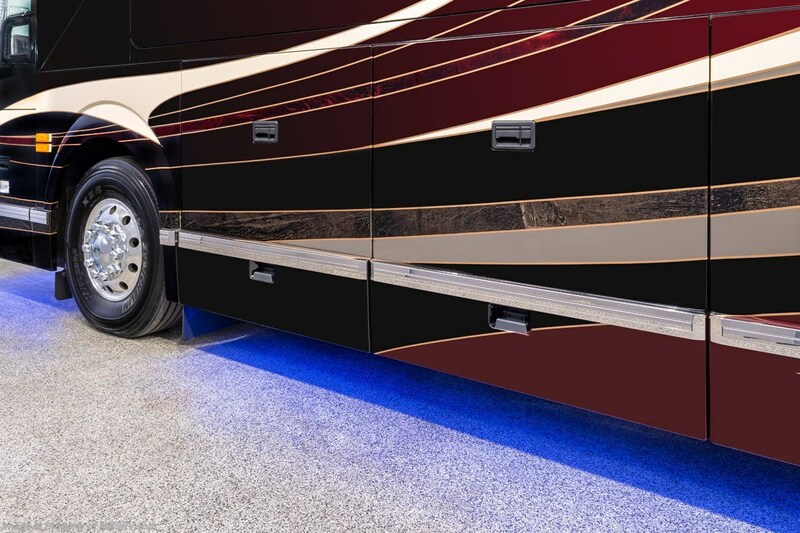 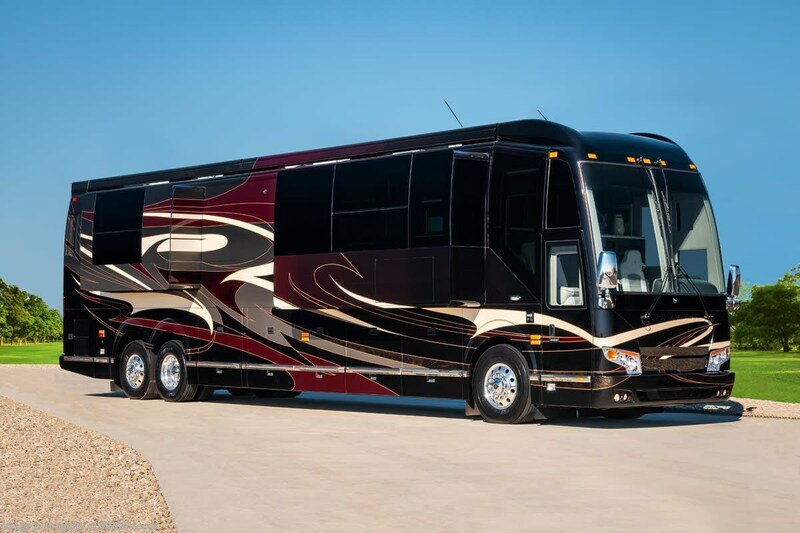 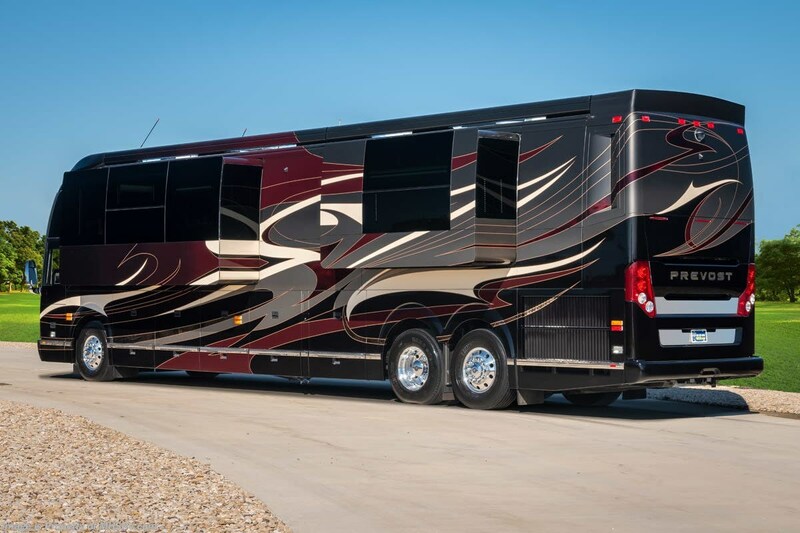 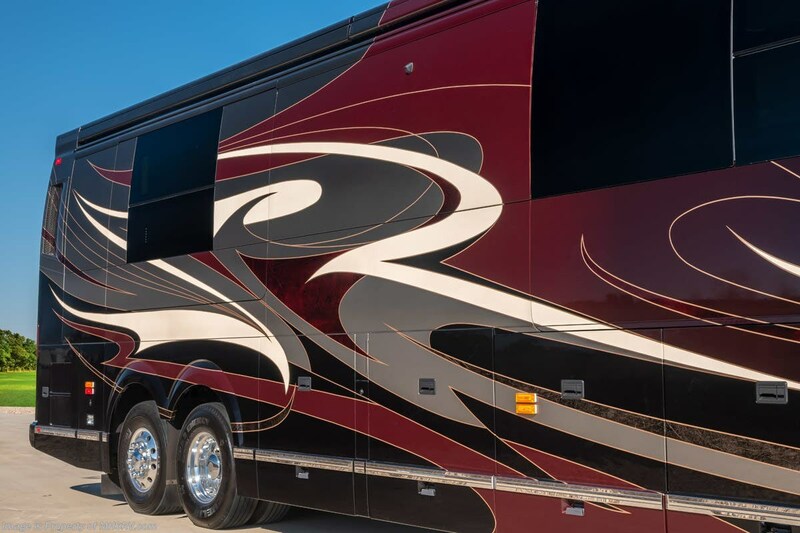 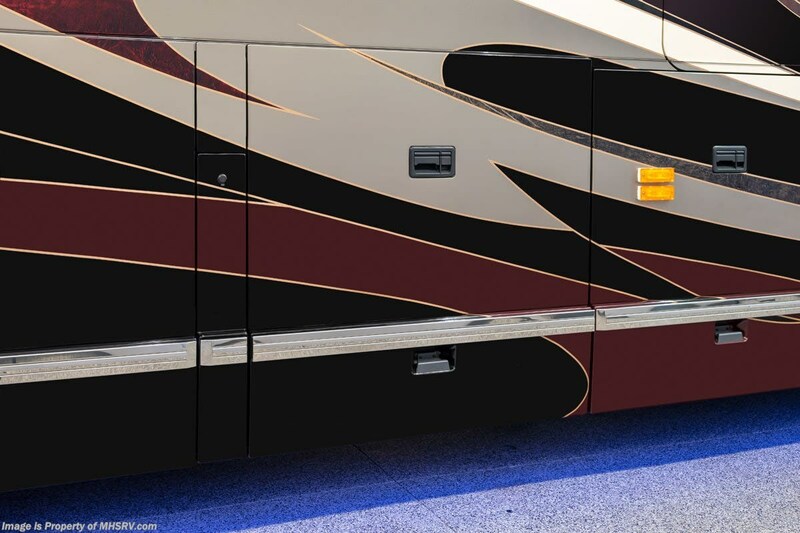 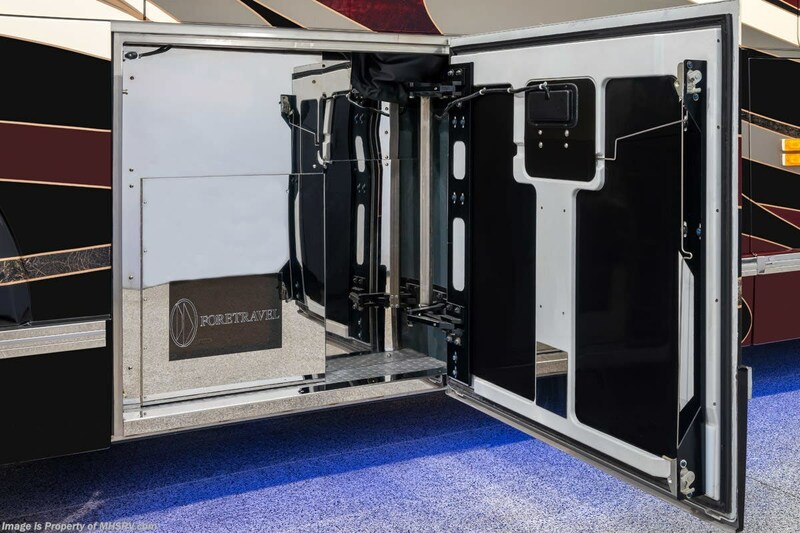 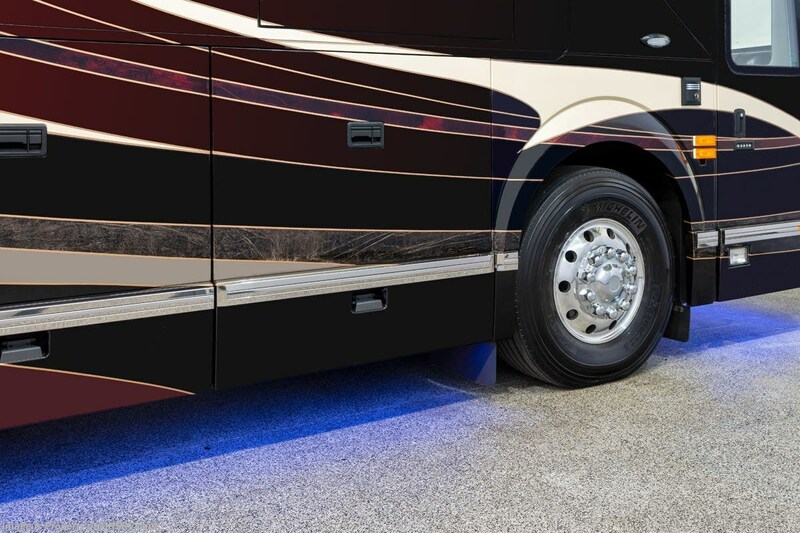 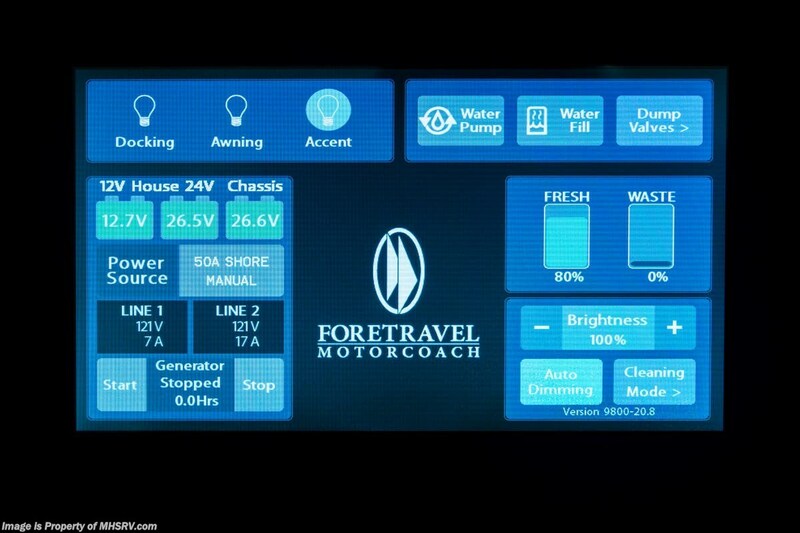 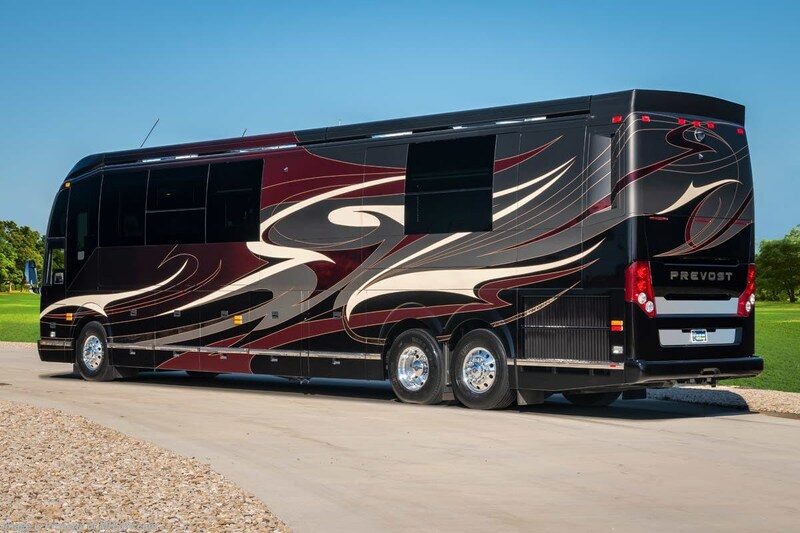 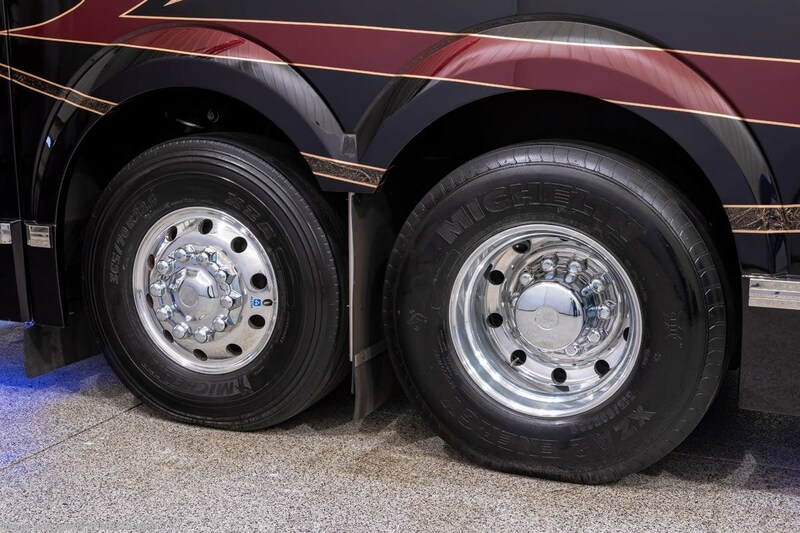 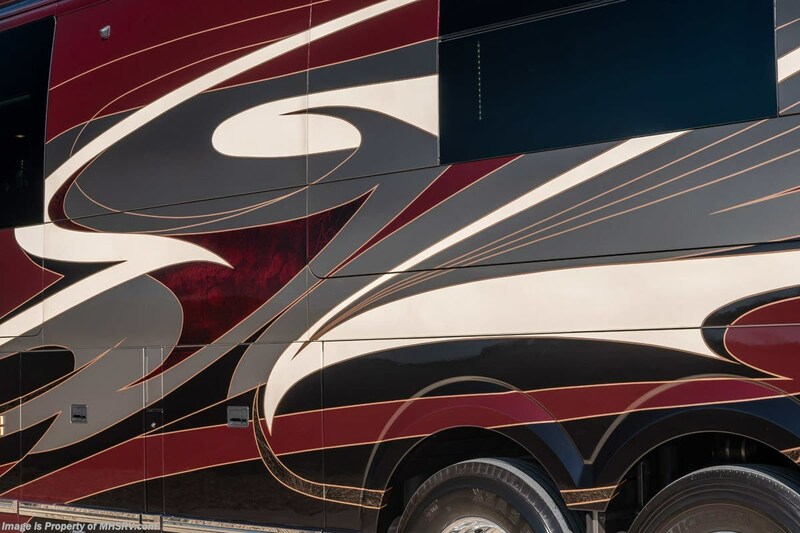 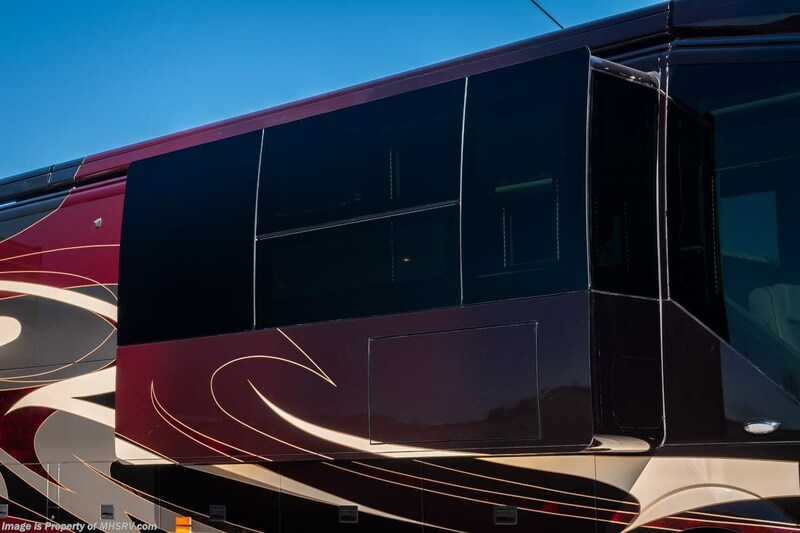 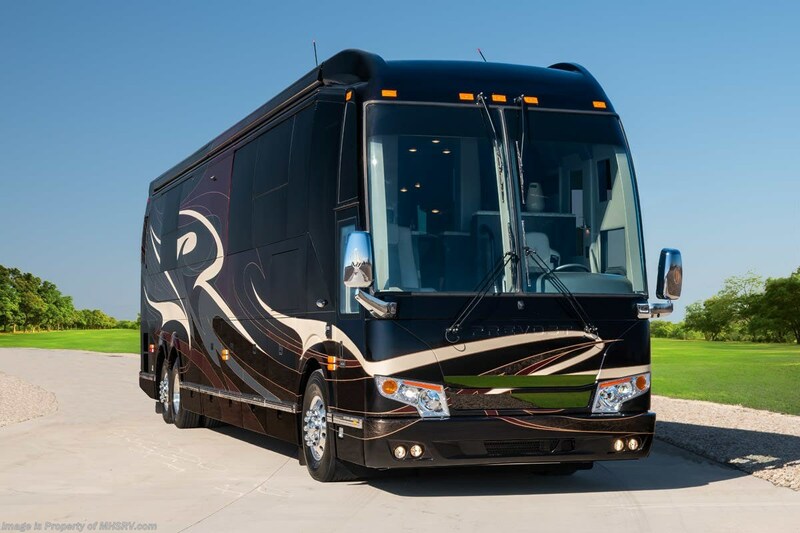 The Foretravel Prevost® H3-45™; The Foremost in luxury motor coaches available today.